Trust Kathy's Show Equipment for your next awards order. 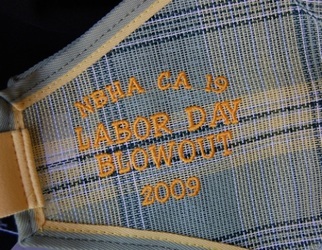 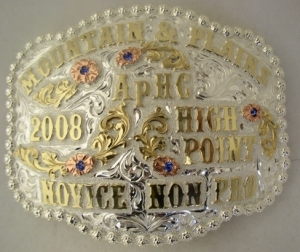 We have unique high end custom awards to fit your awards program and can tailor the items to meet your budget. 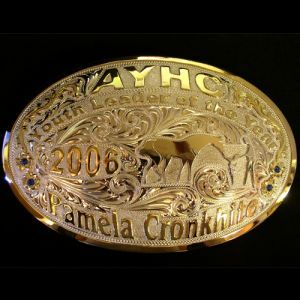 Use the Custom Awards Order/Quote form below to contact us with your award interests and we will give you a quote. 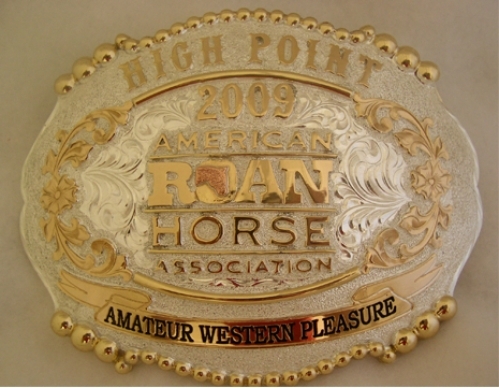 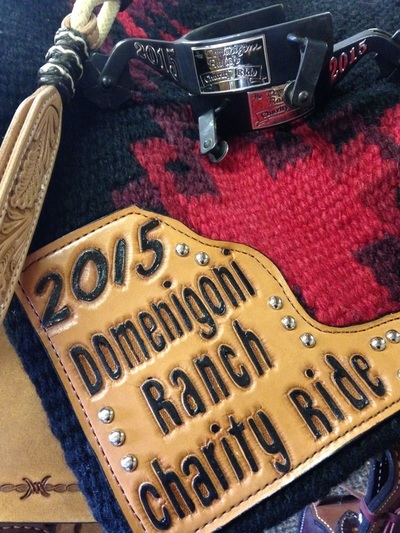 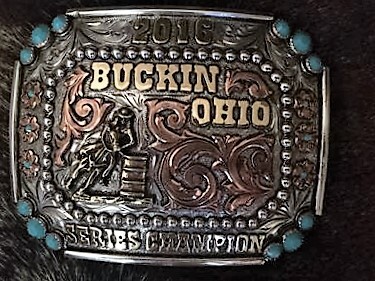 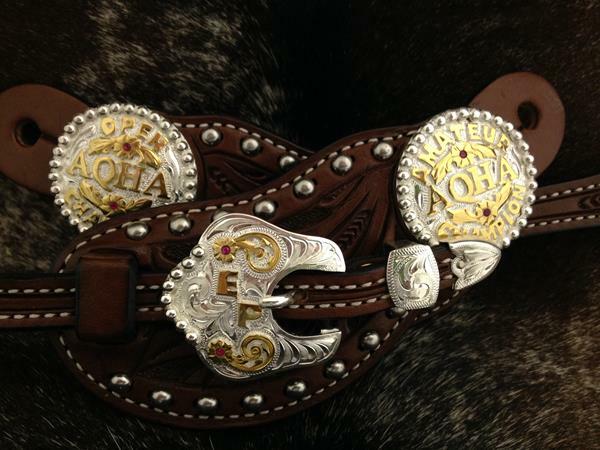 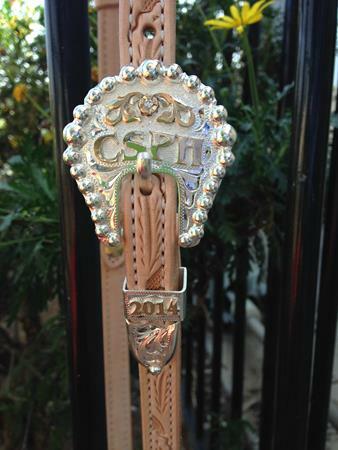 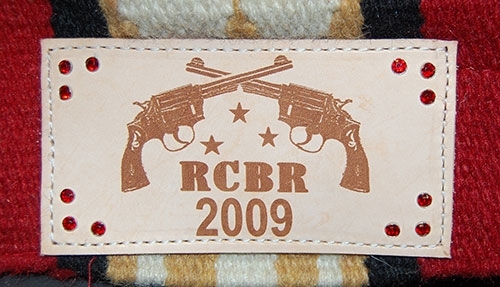 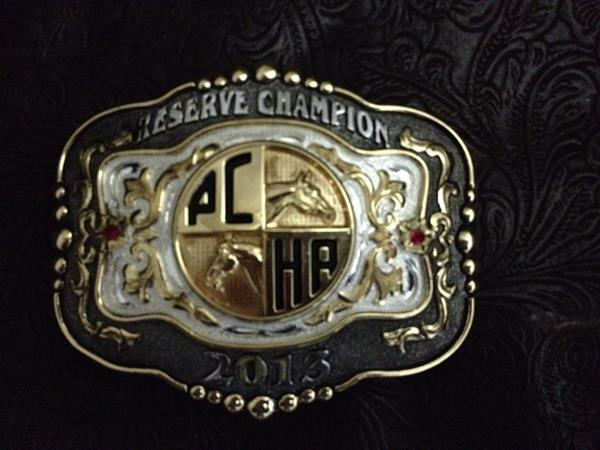 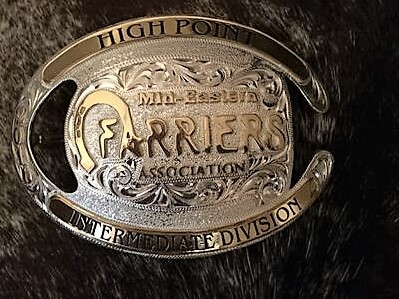 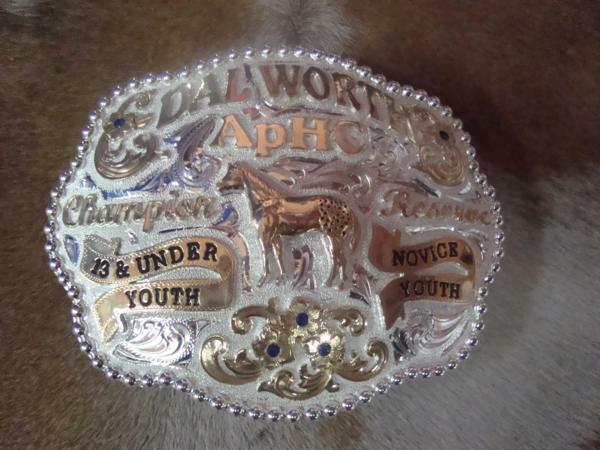 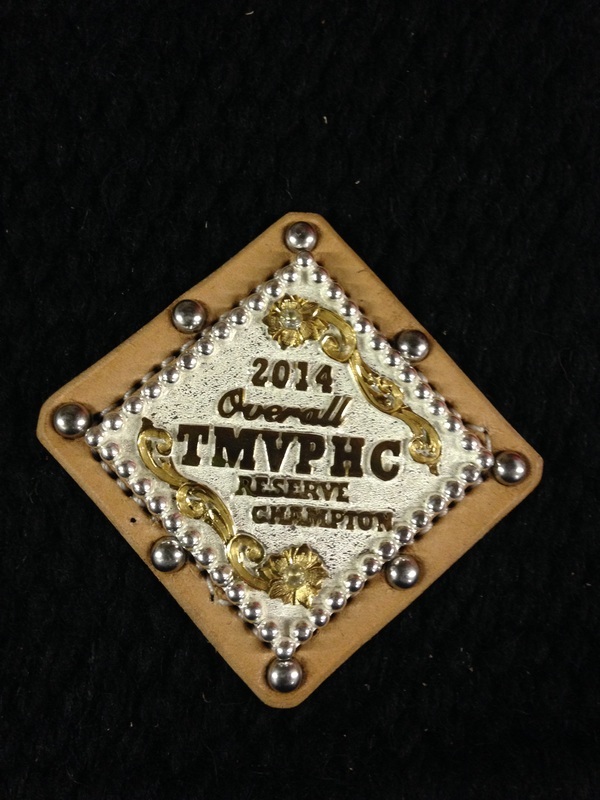 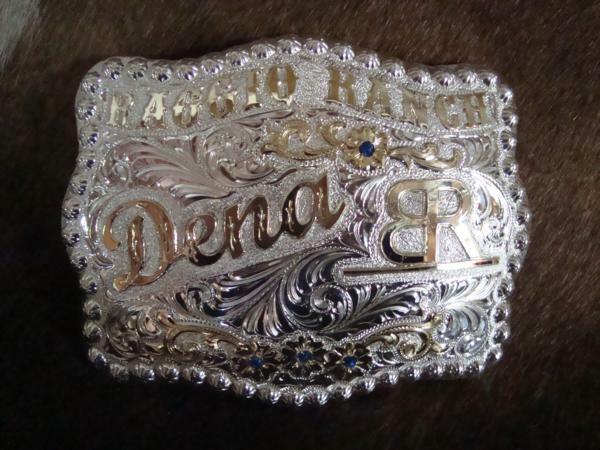 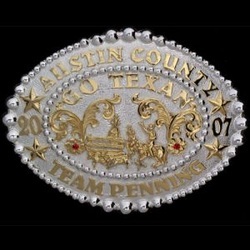 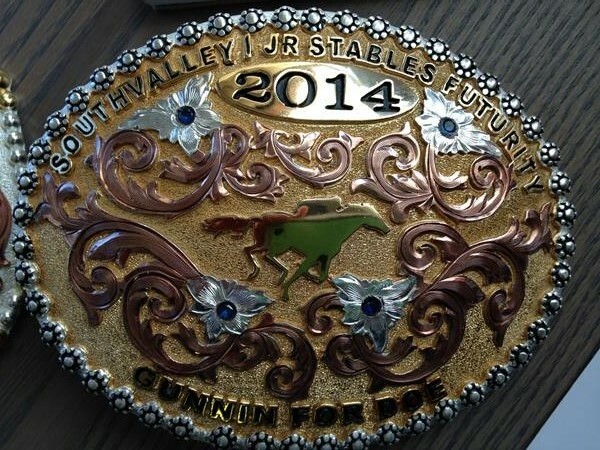 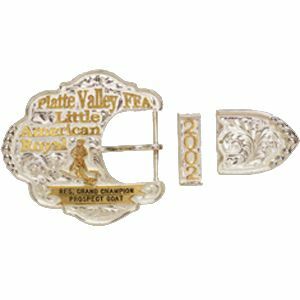 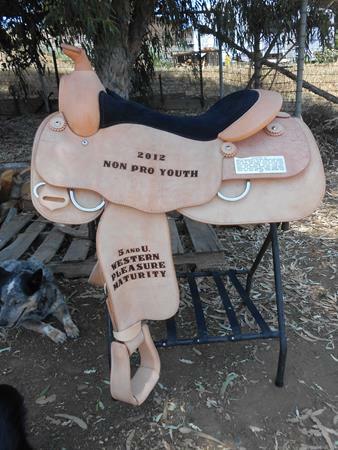 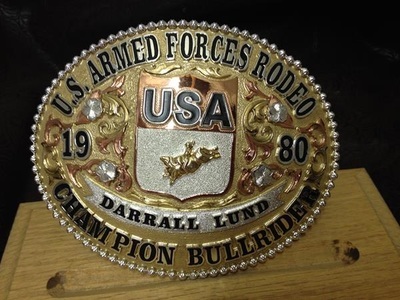 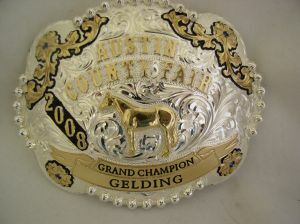 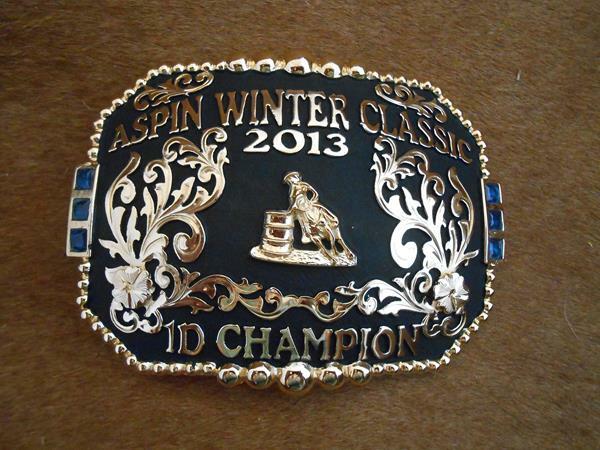 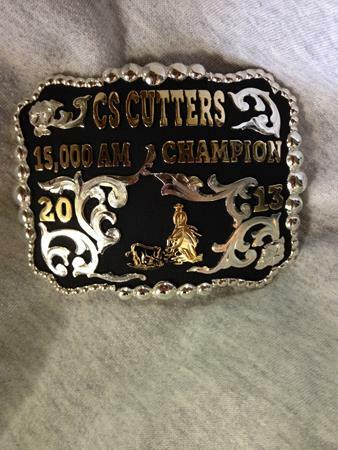 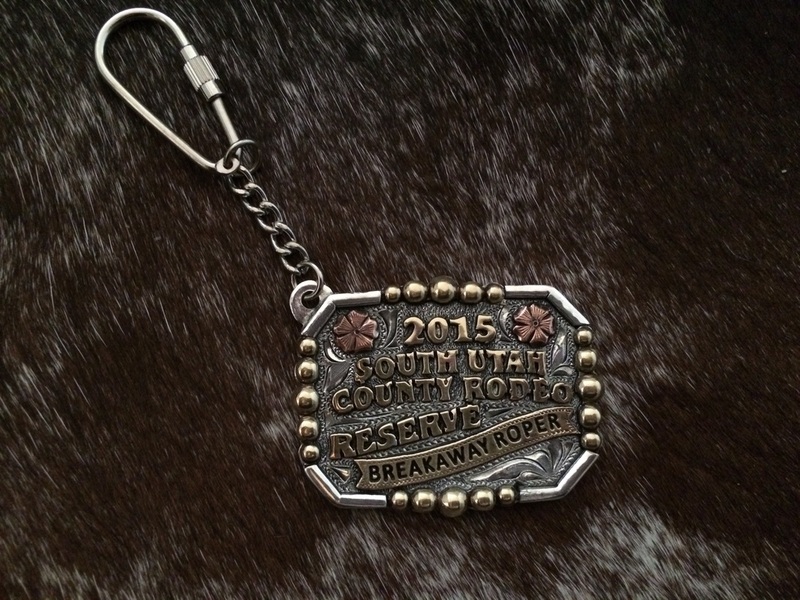 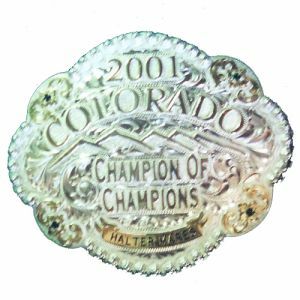 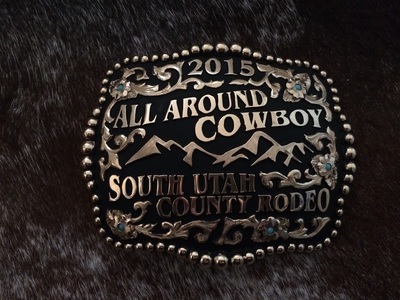 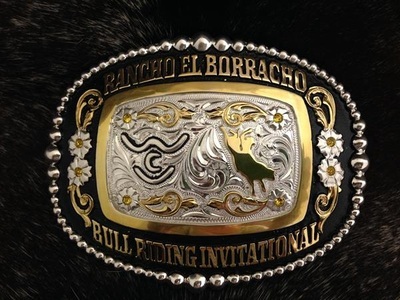 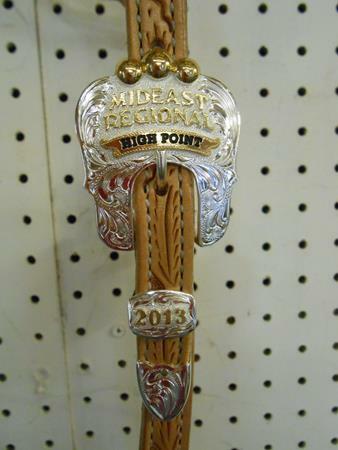 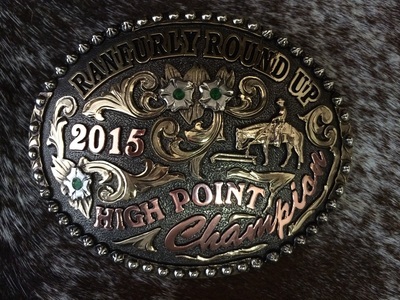 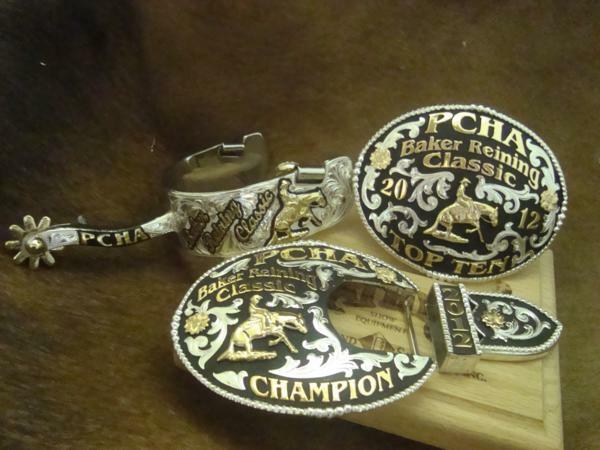 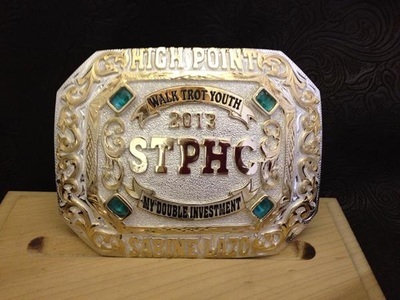 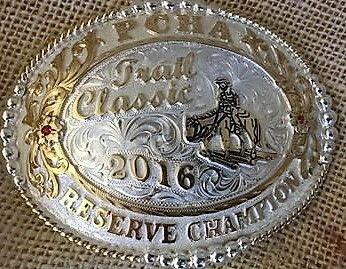 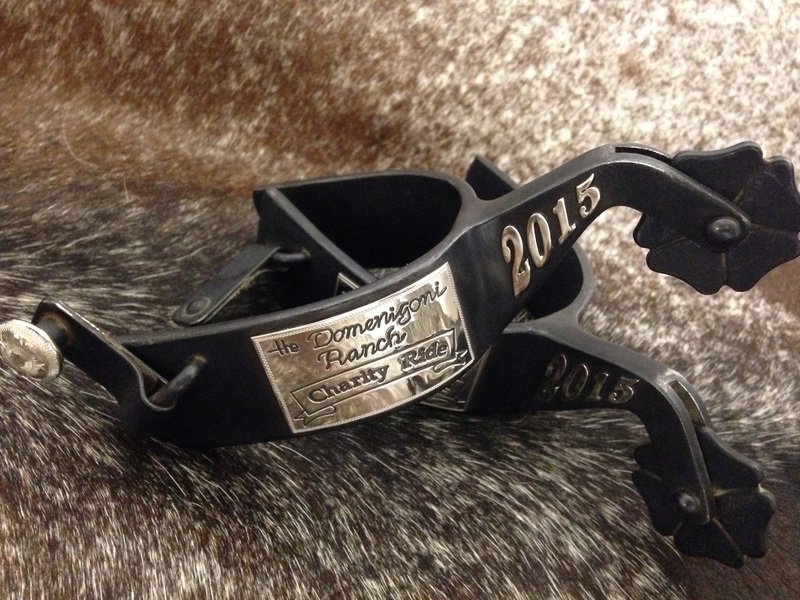 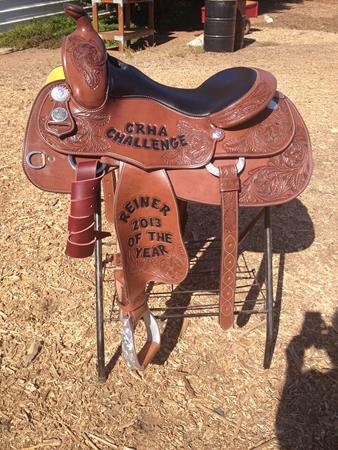 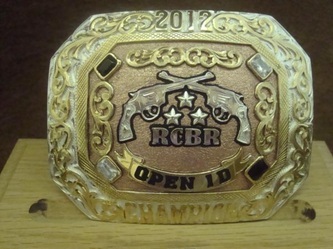 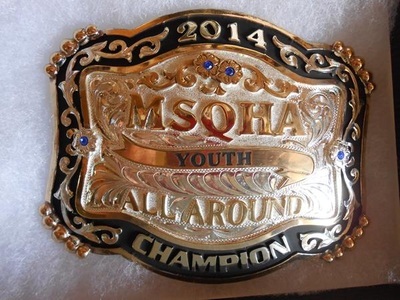 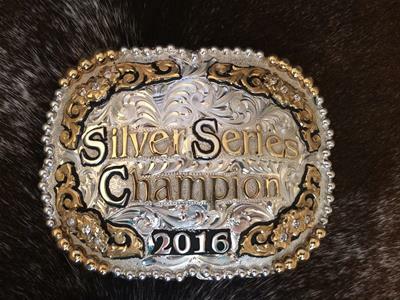 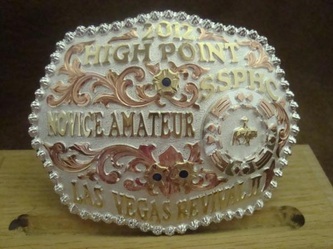 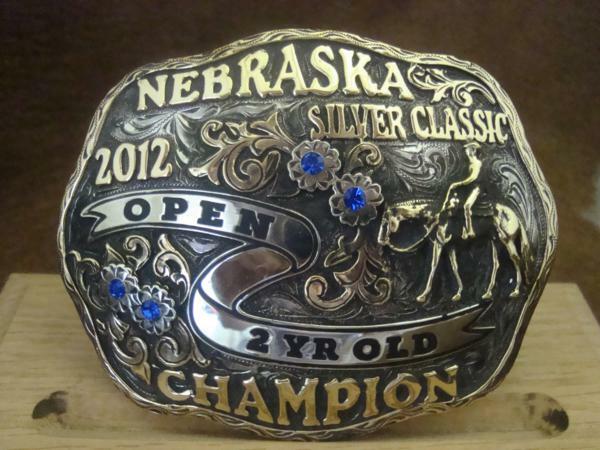 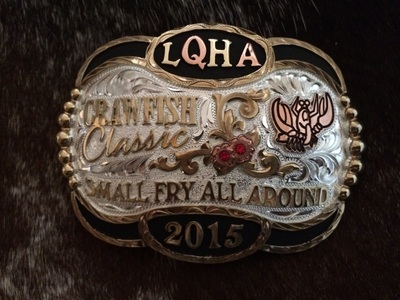 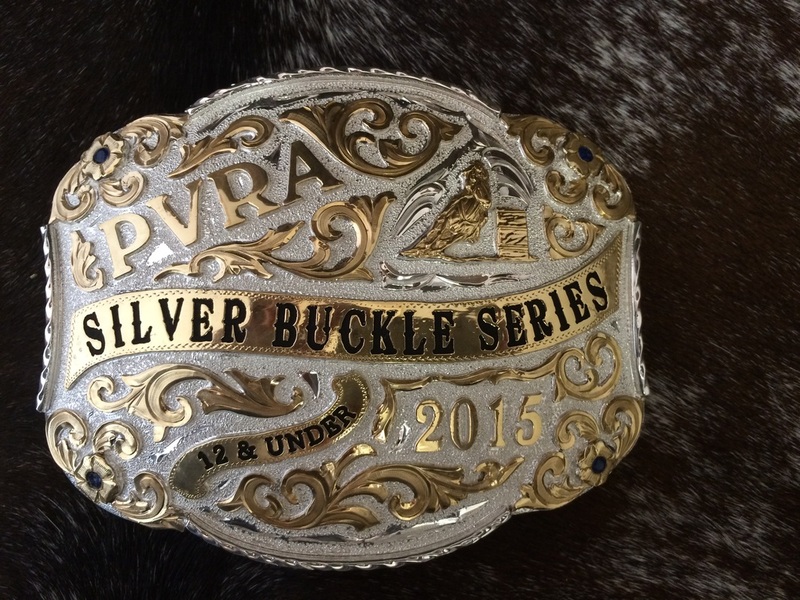 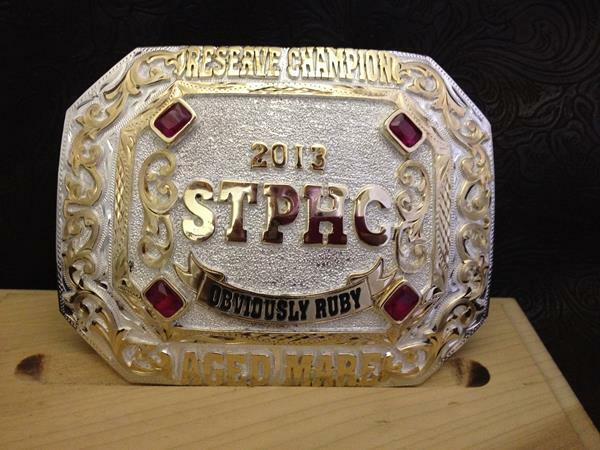 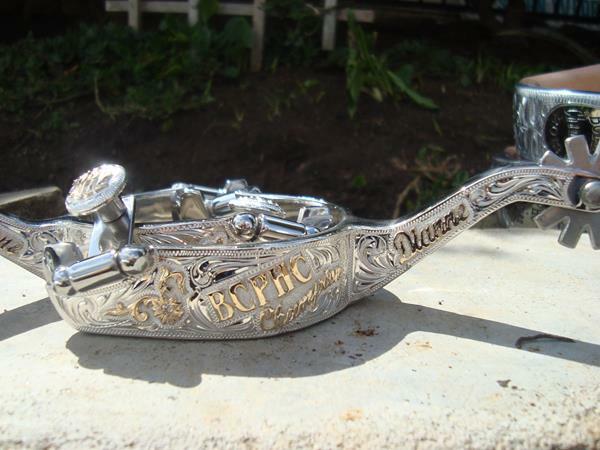 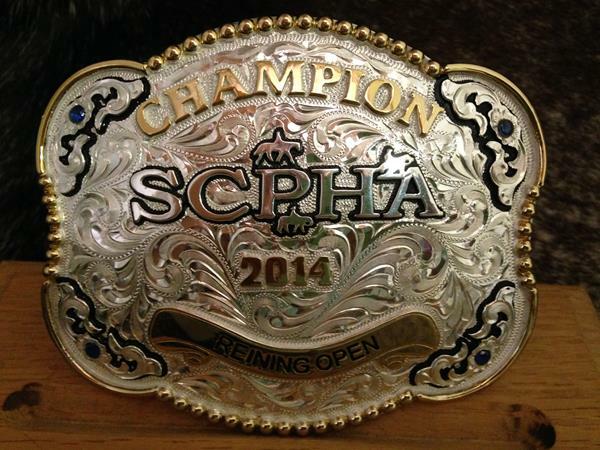 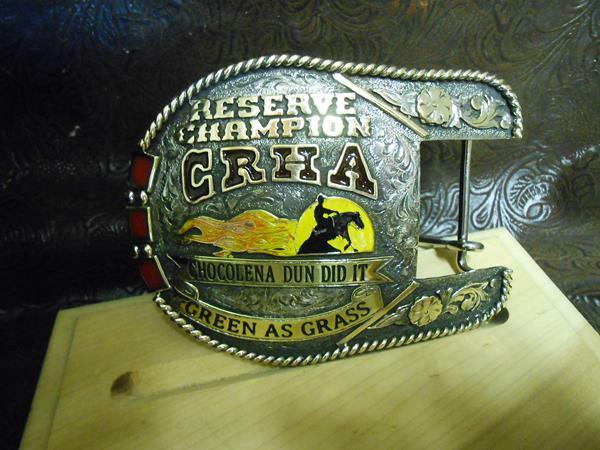 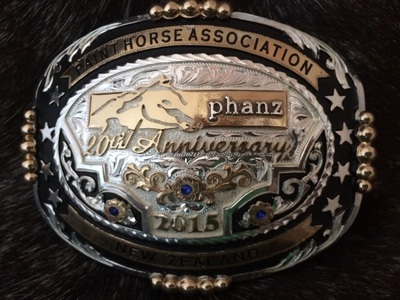 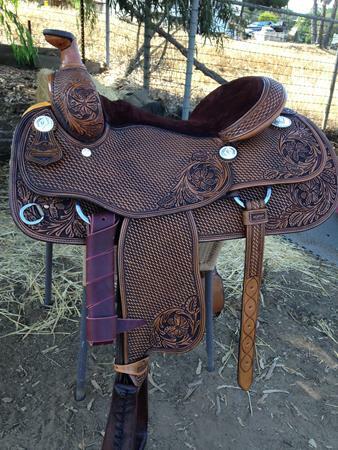 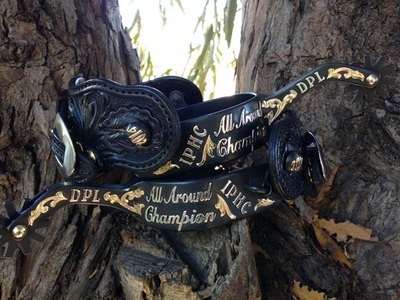 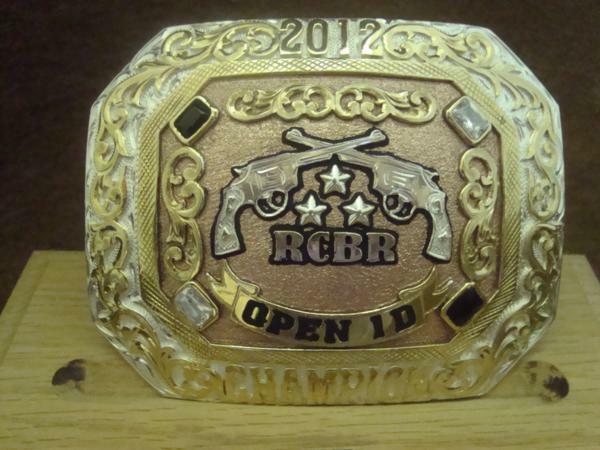 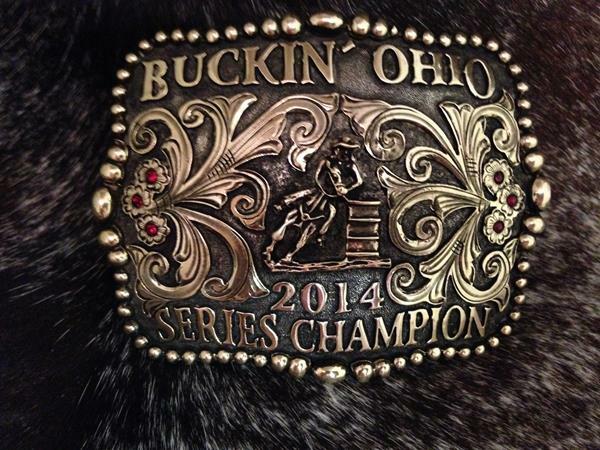 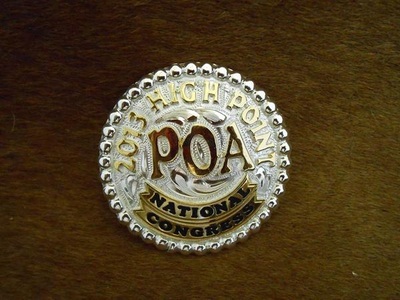 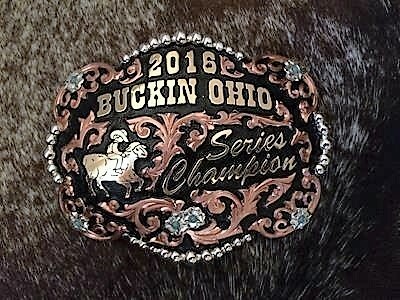 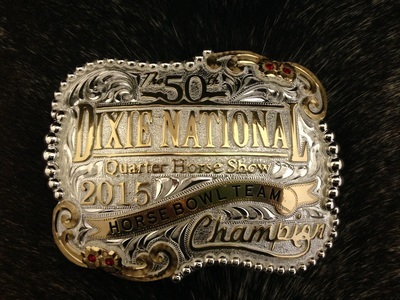 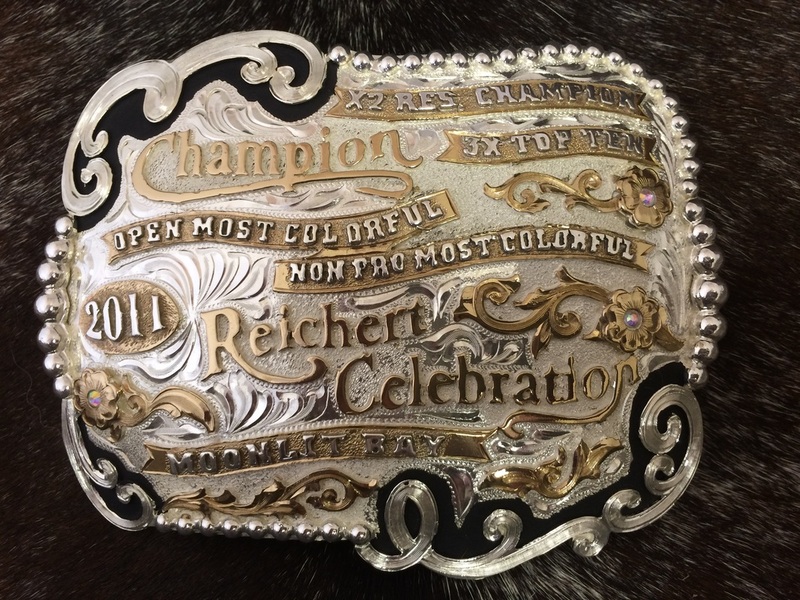 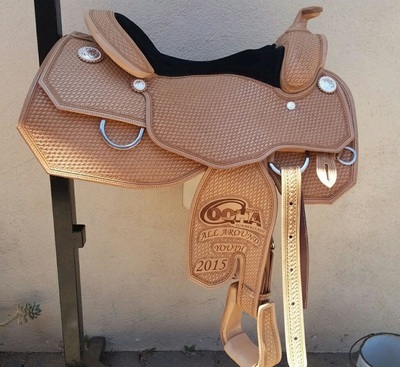 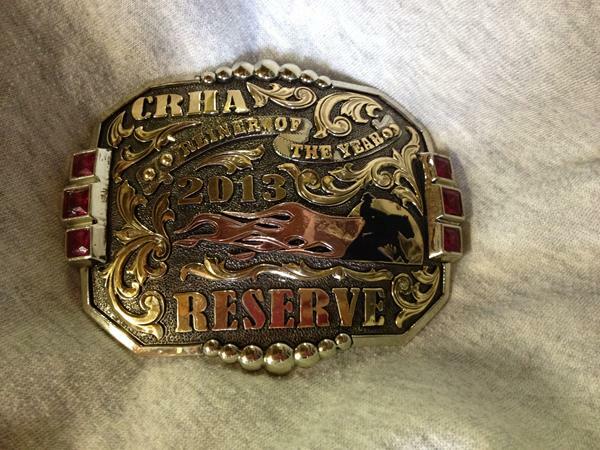 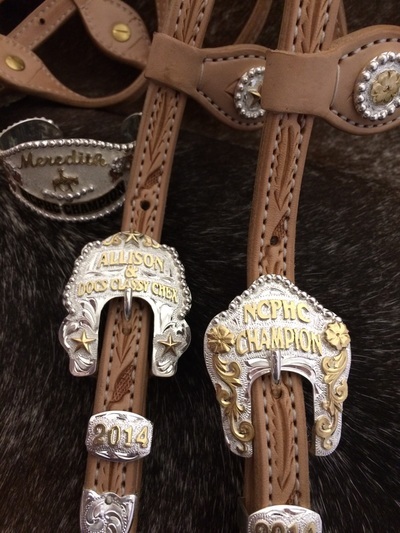 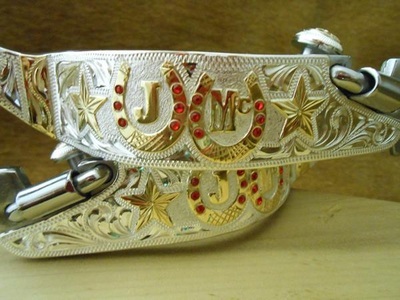 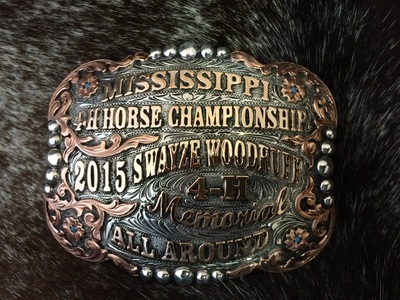 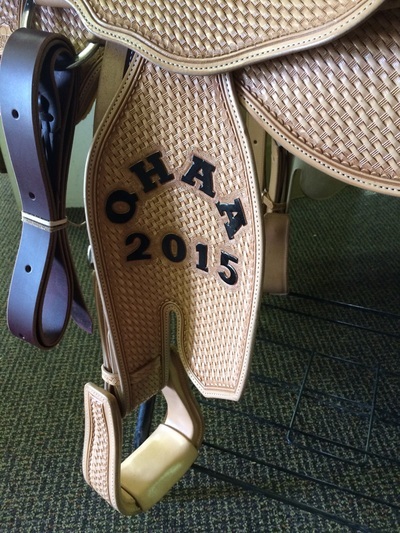 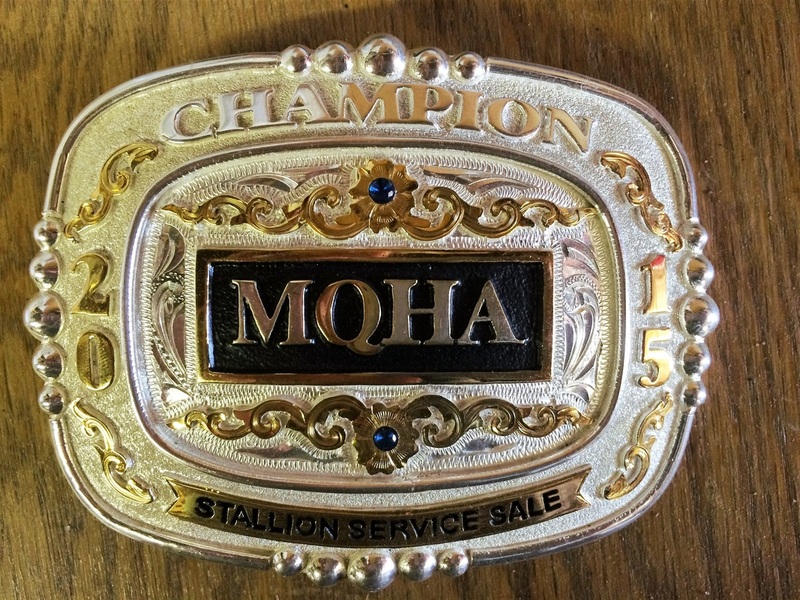 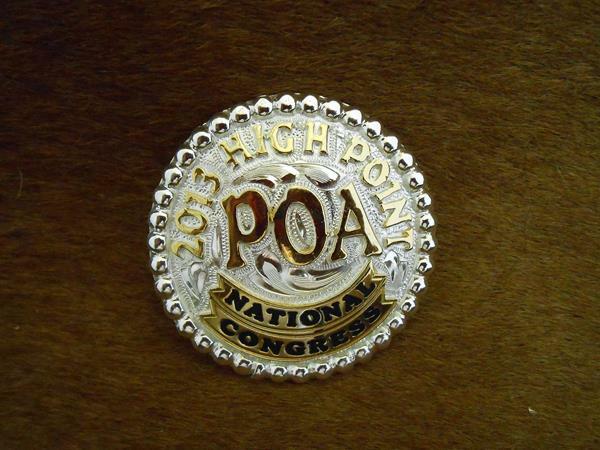 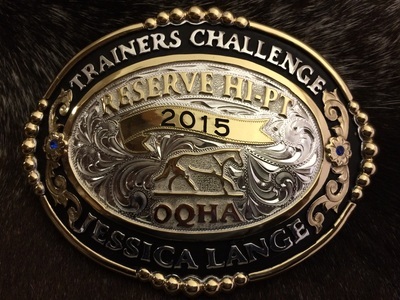 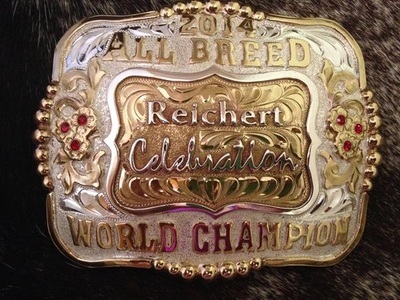 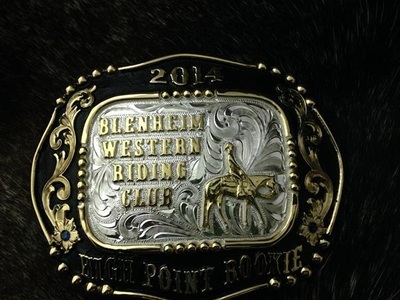 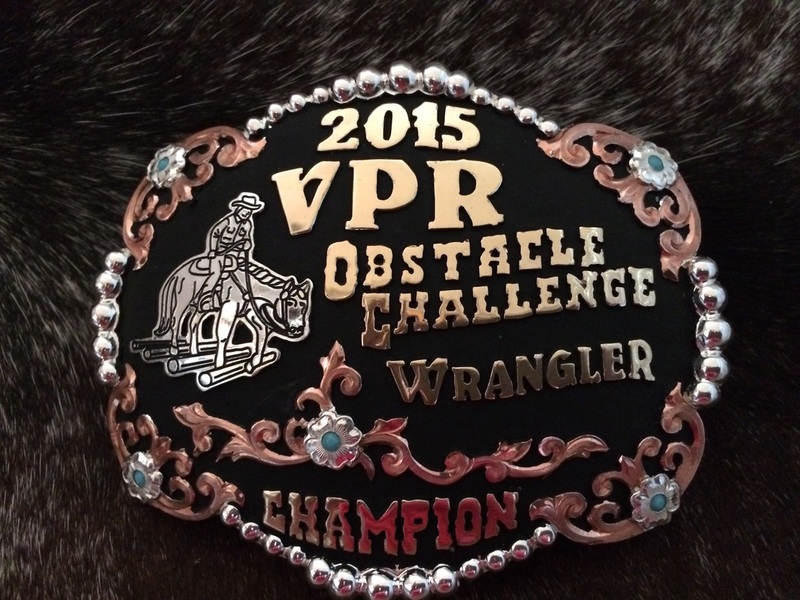 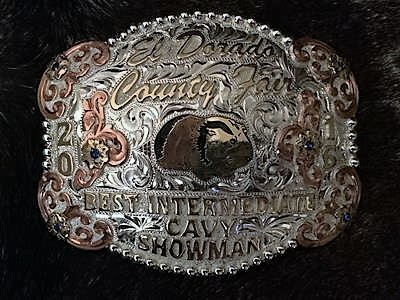 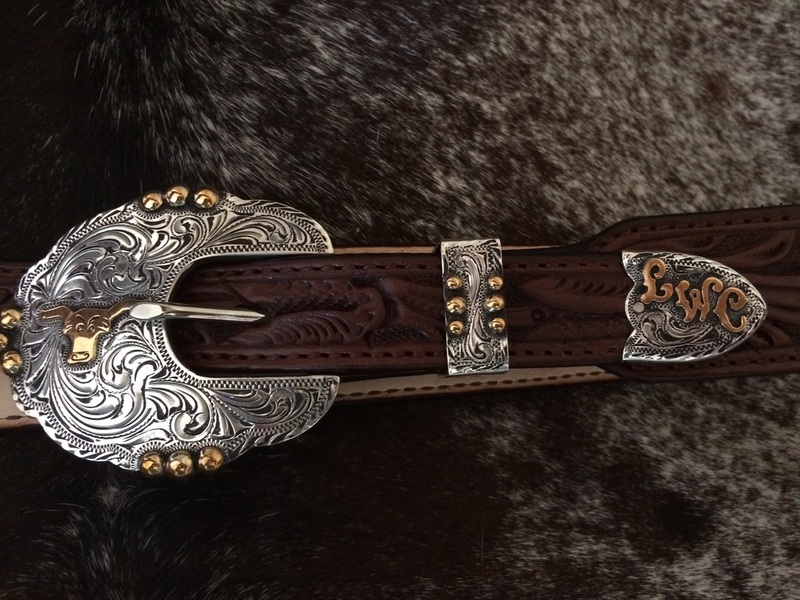 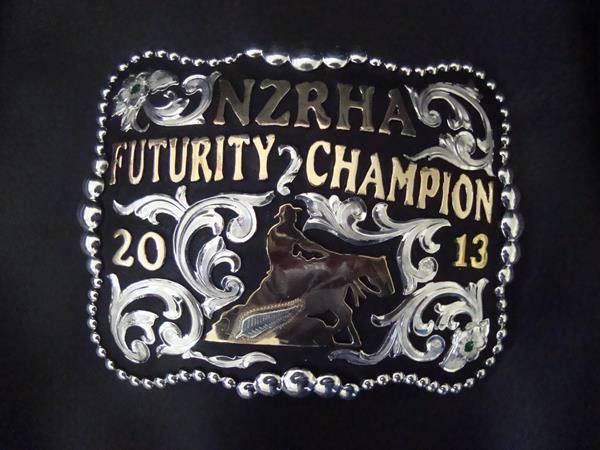 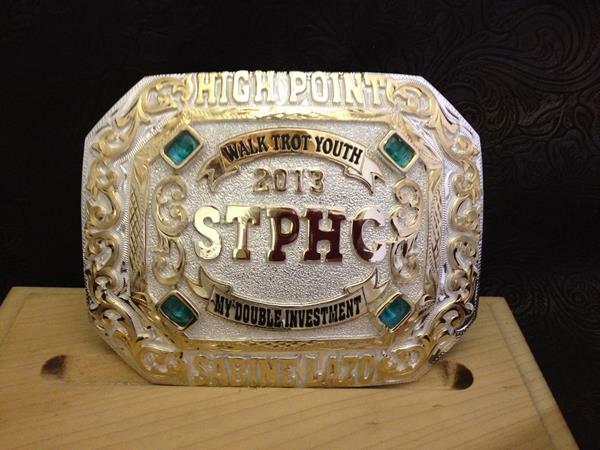 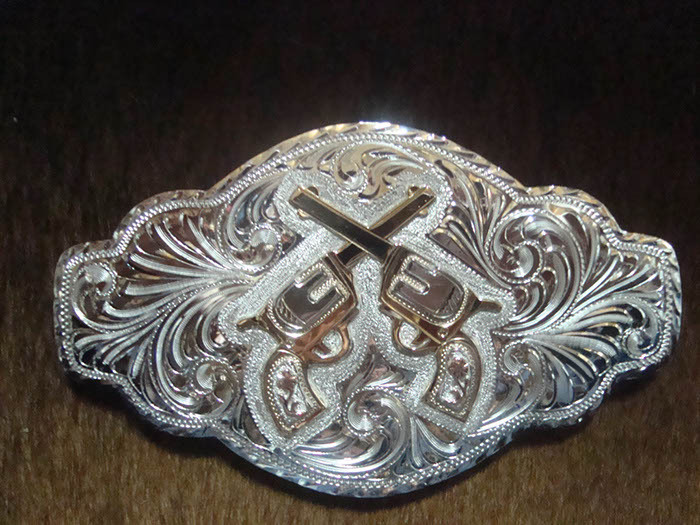 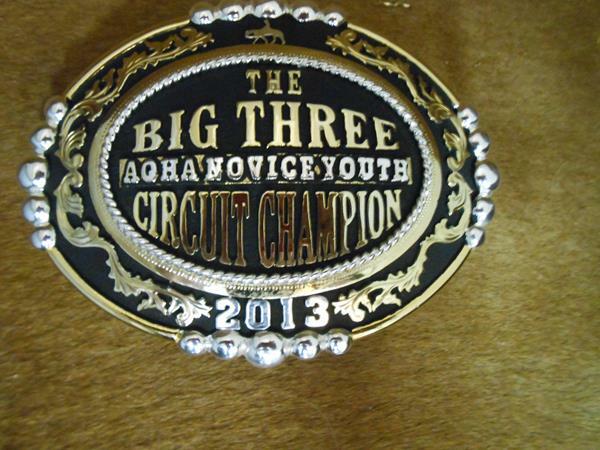 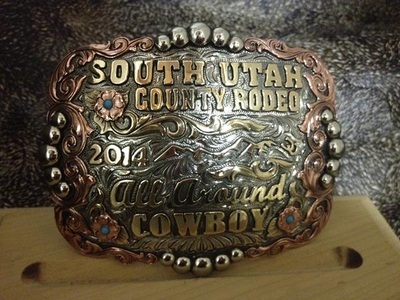 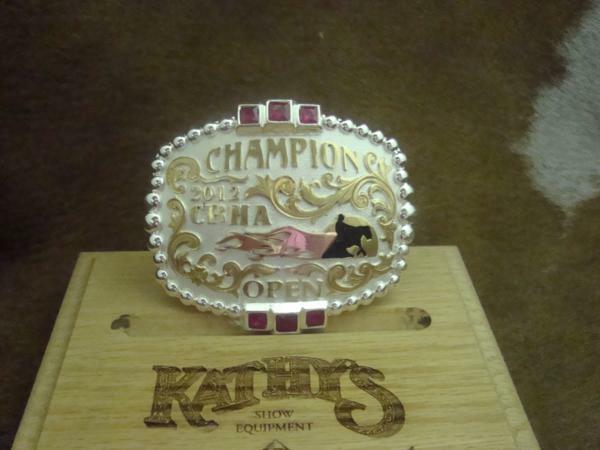 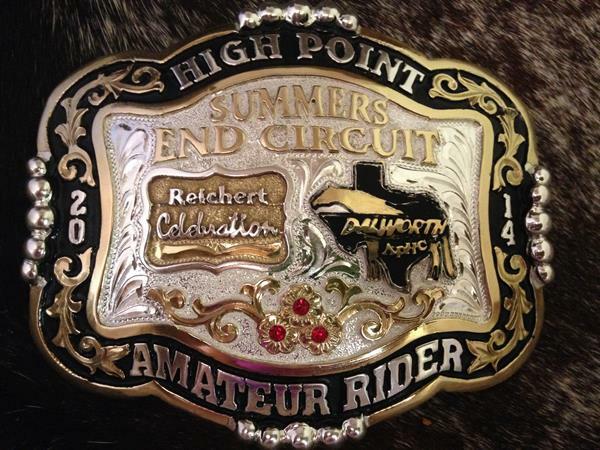 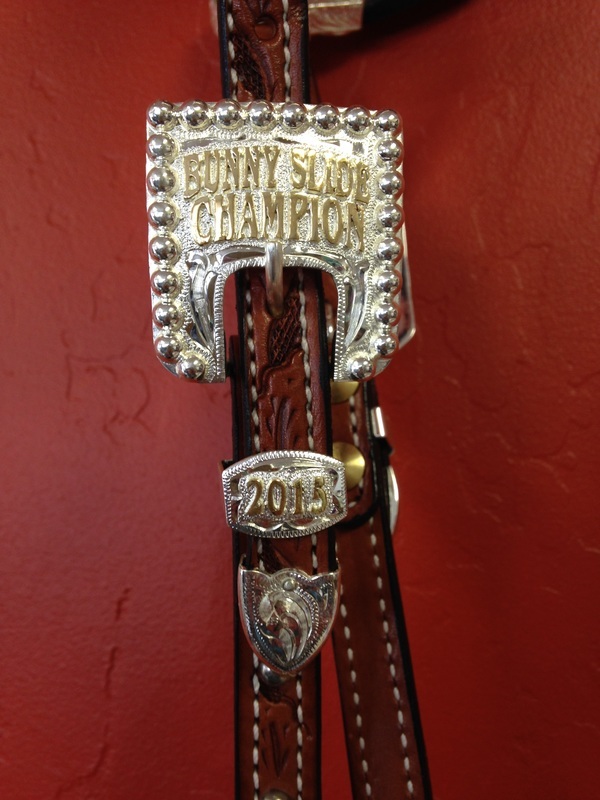 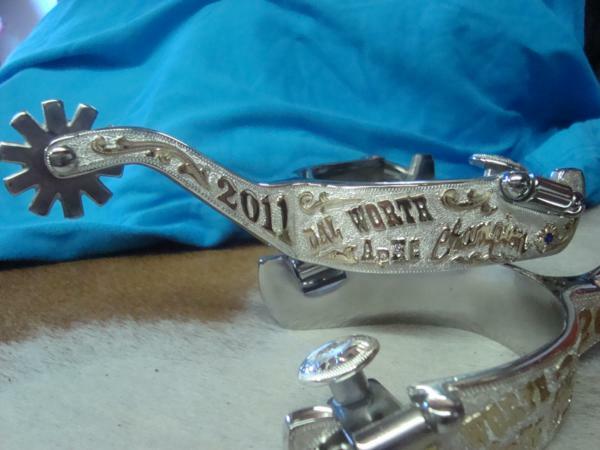 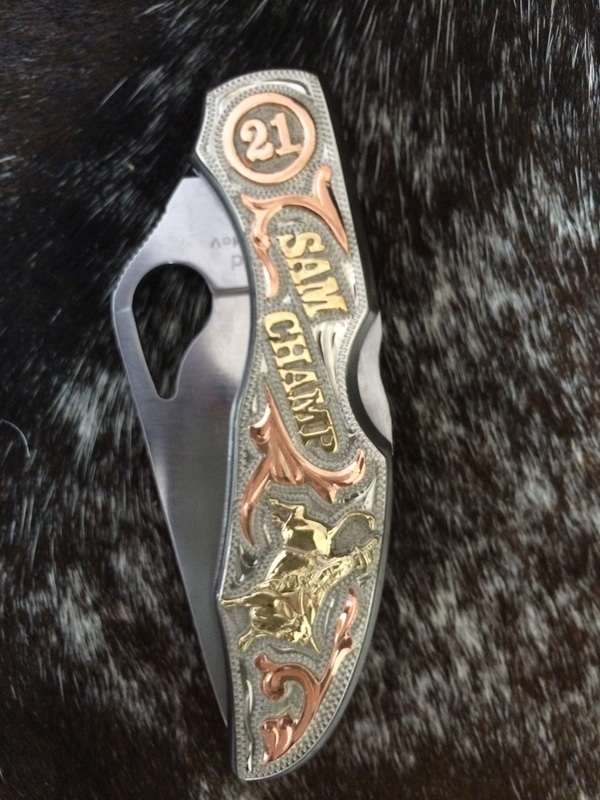 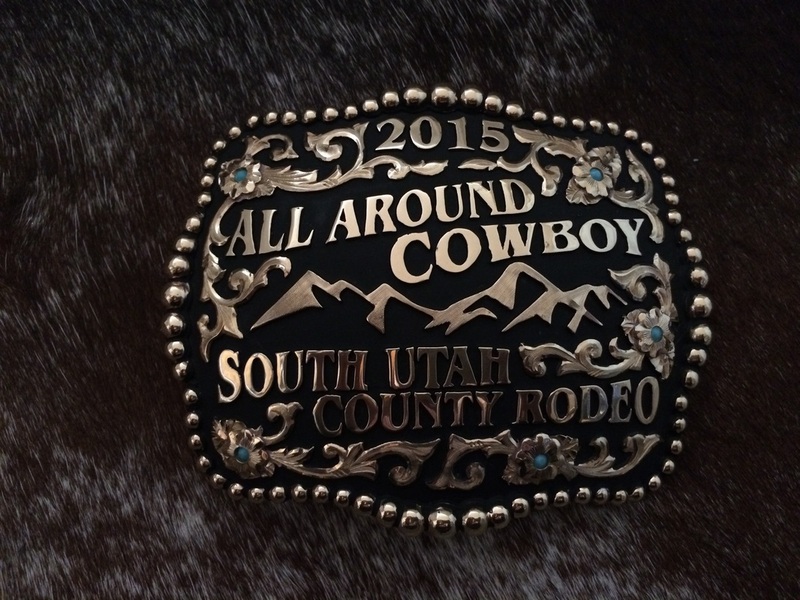 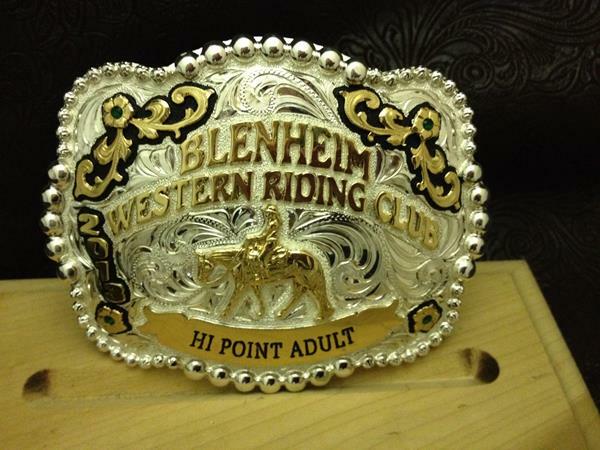 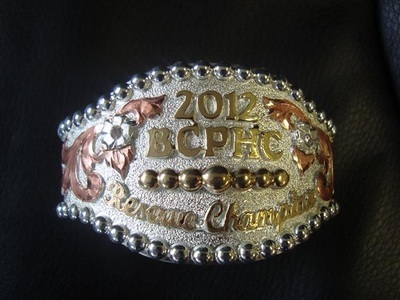 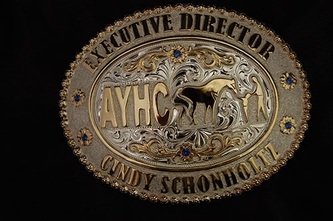 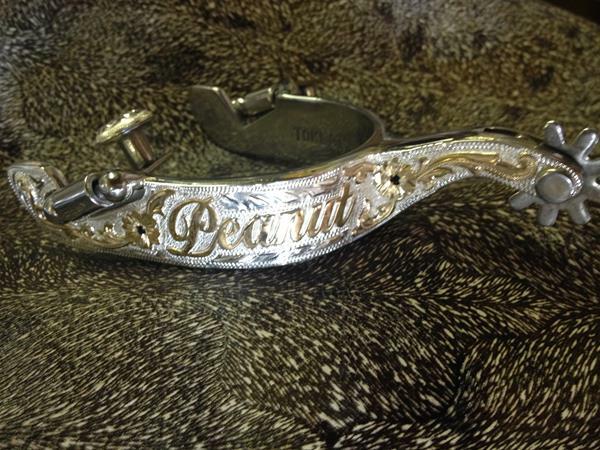 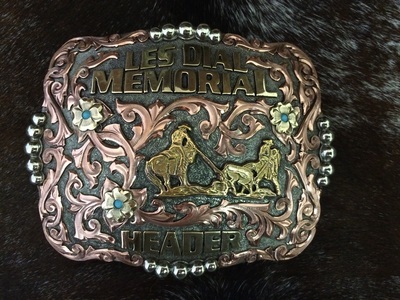 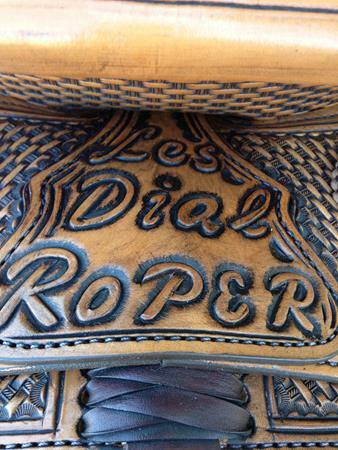 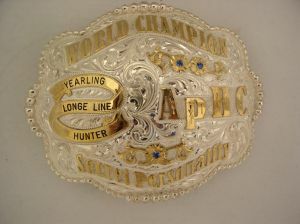 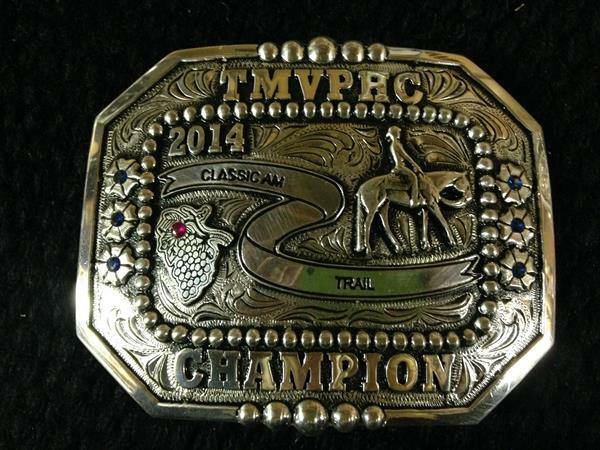 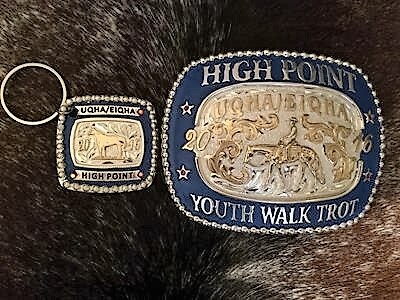 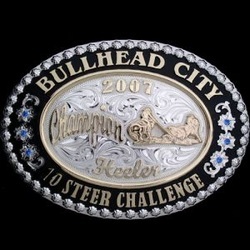 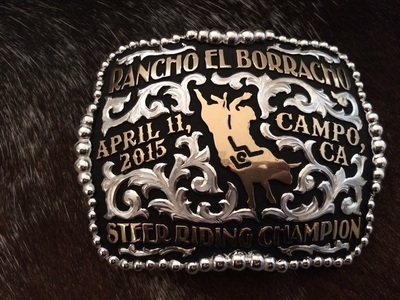 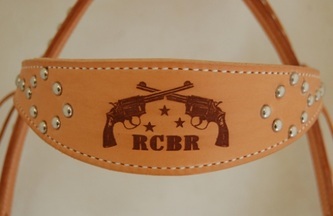 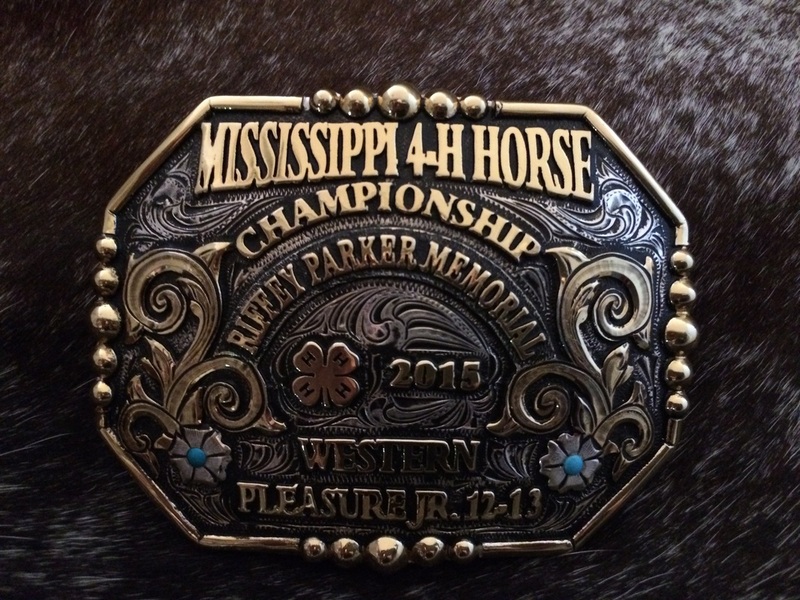 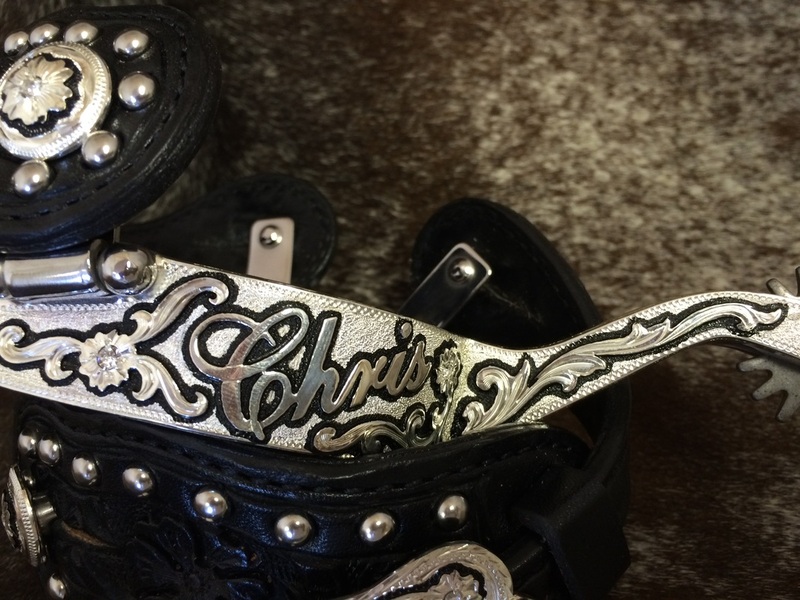 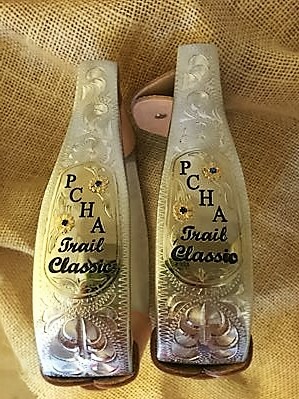 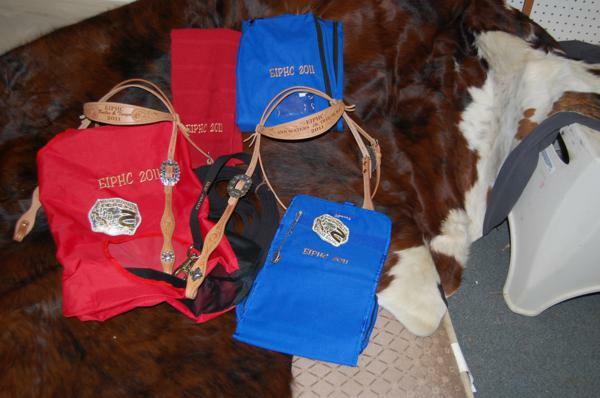 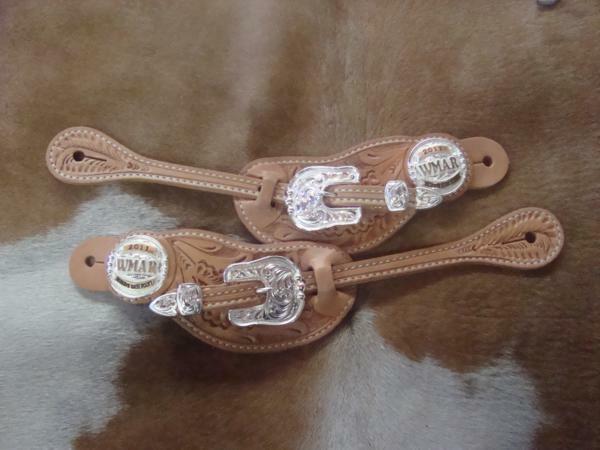 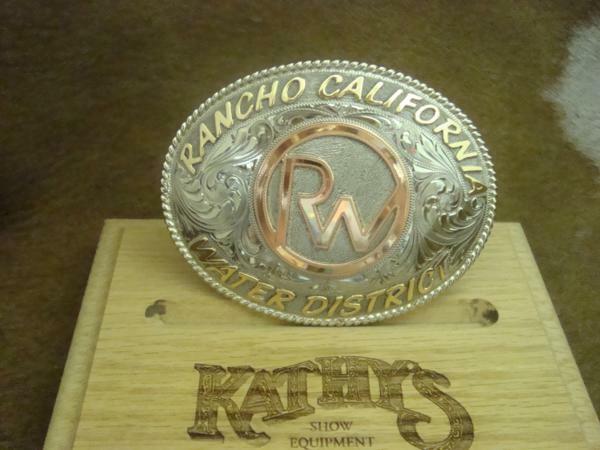 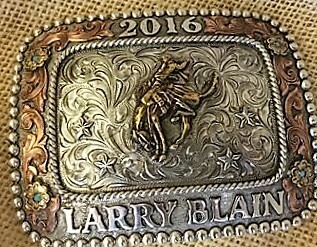 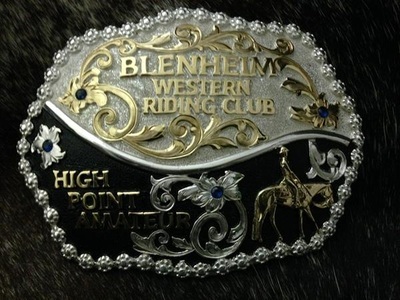 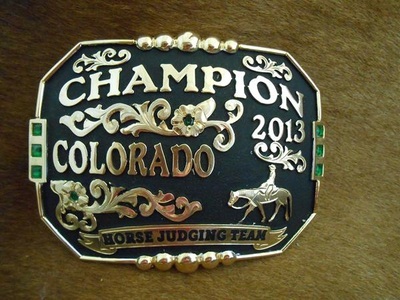 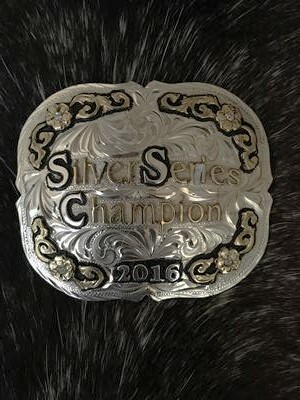 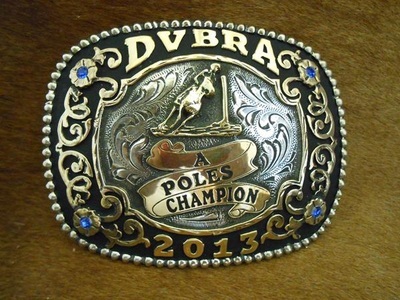 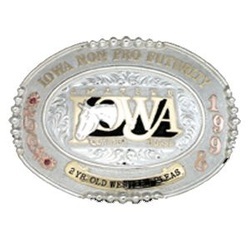 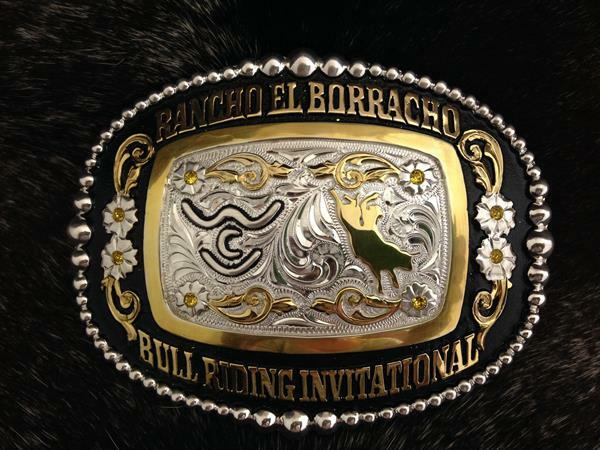 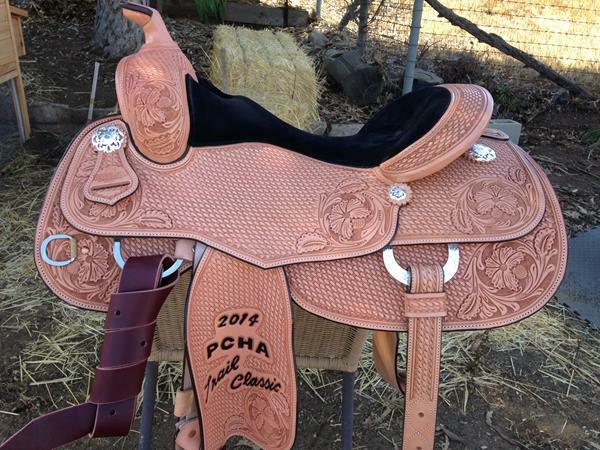 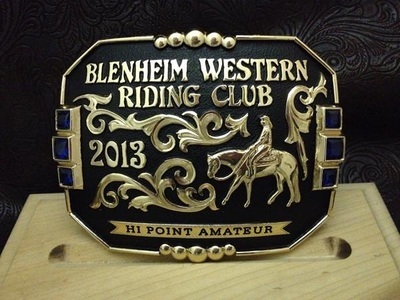 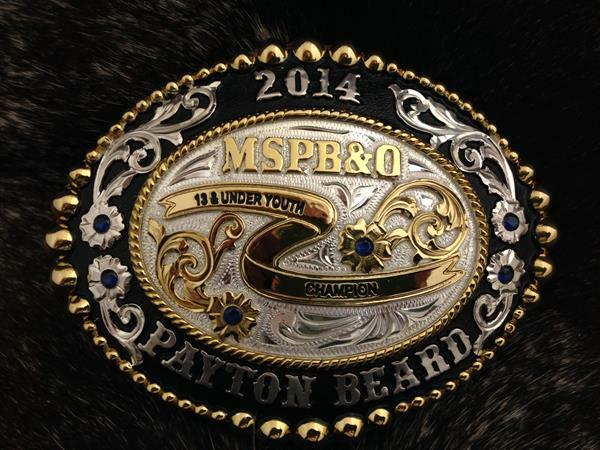 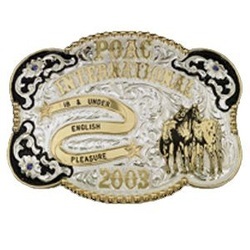 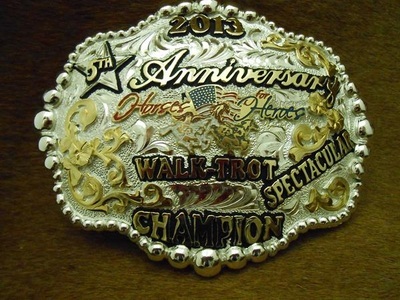 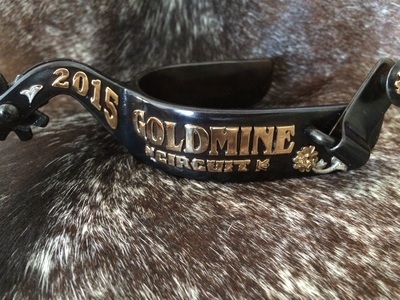 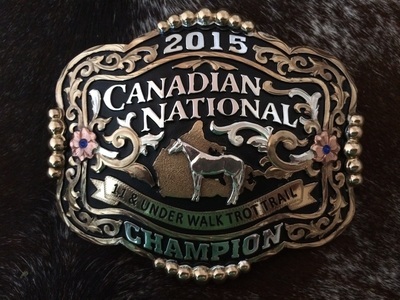 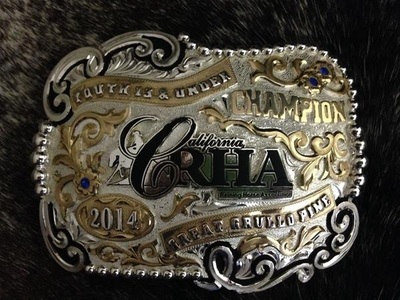 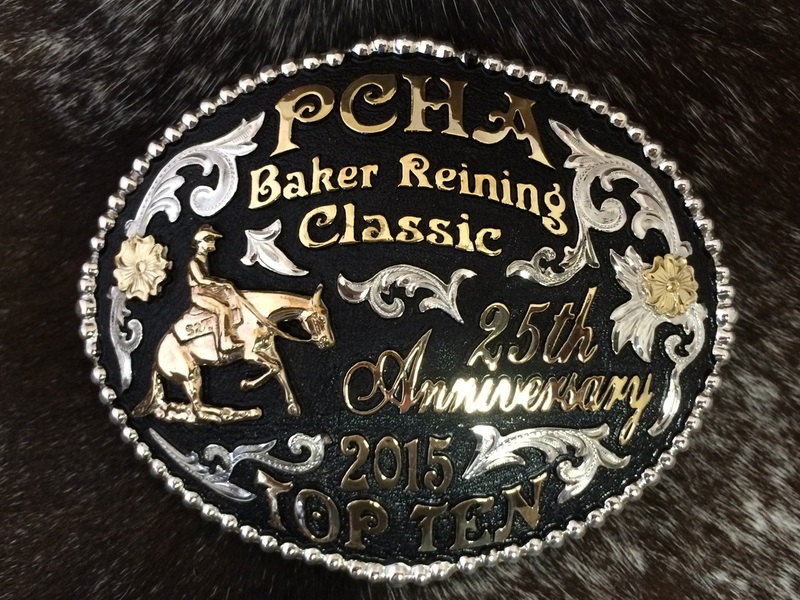 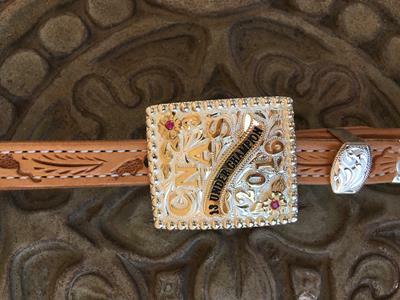 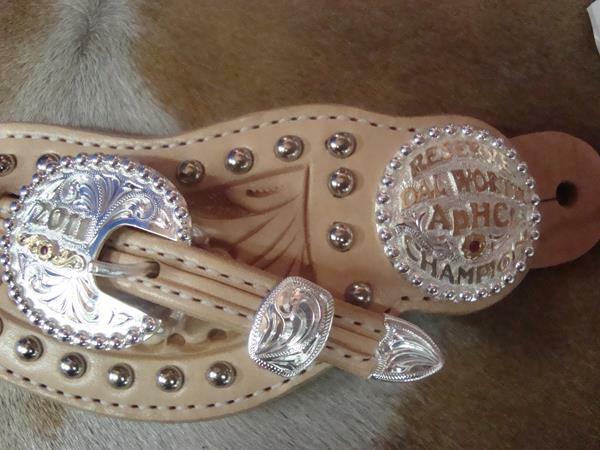 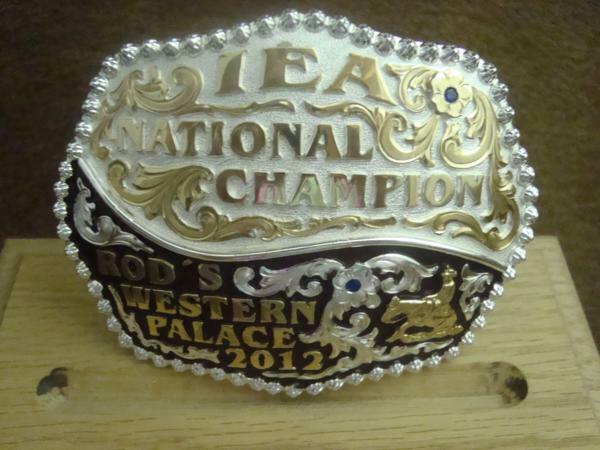 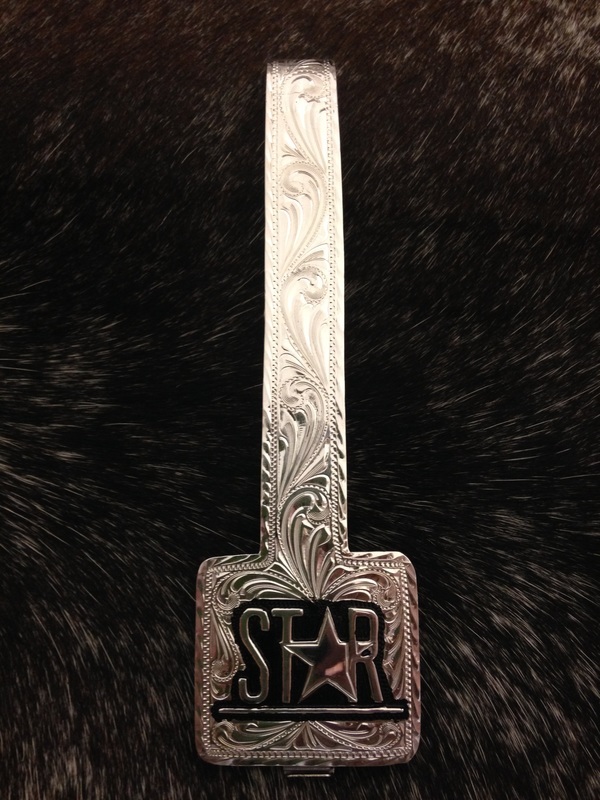 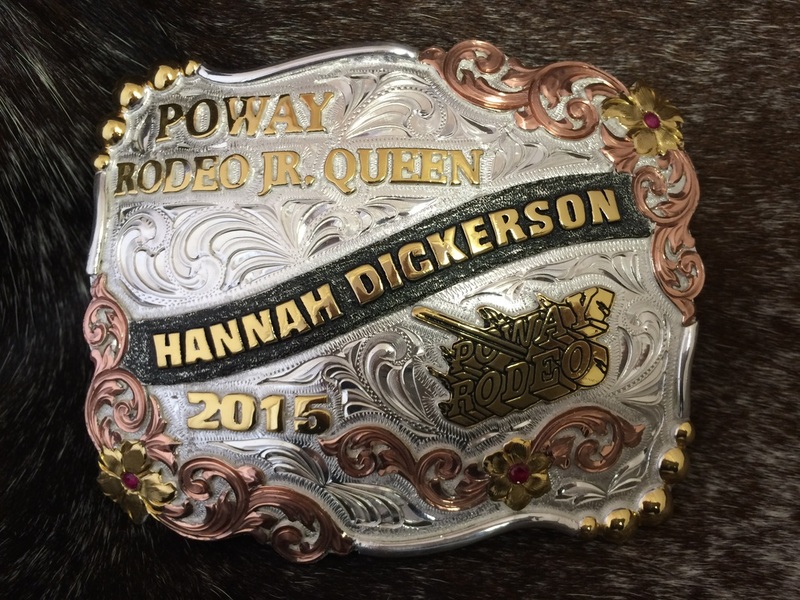 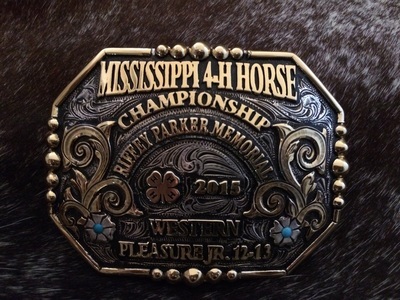 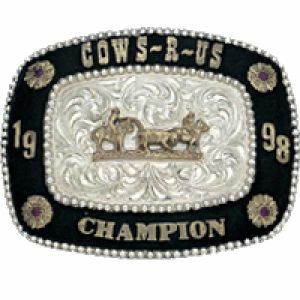 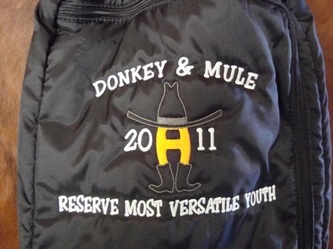 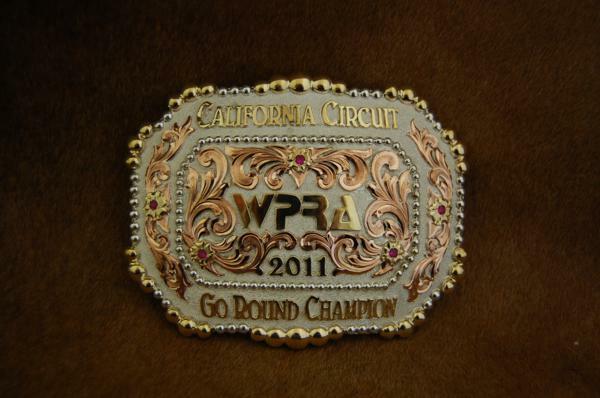 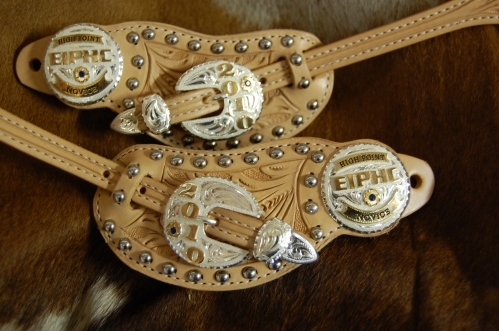 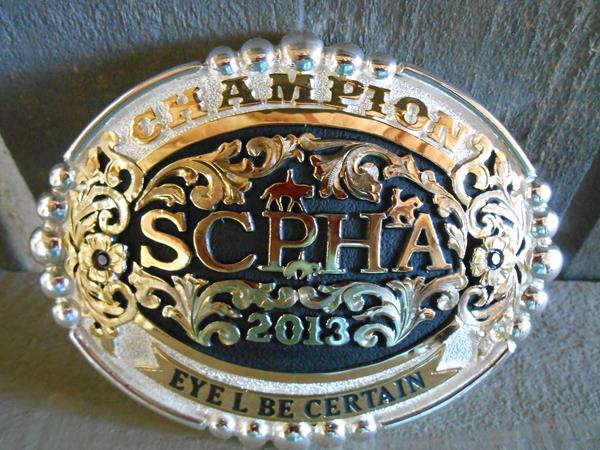 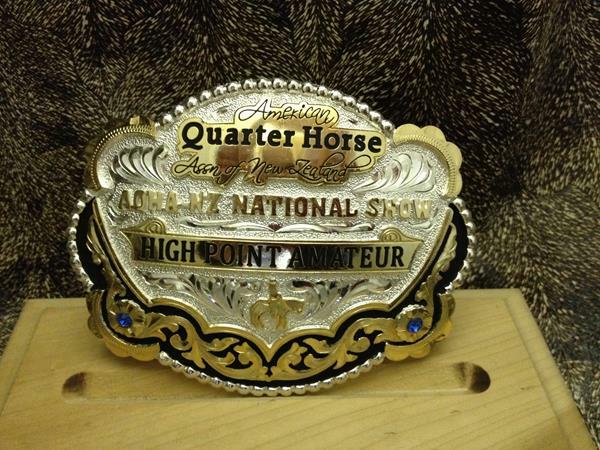 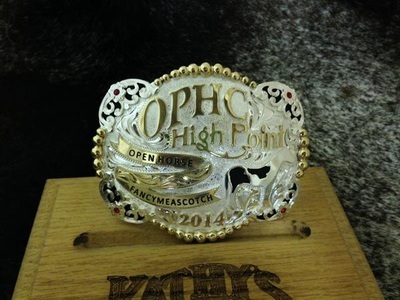 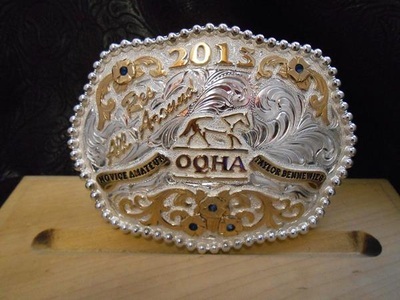 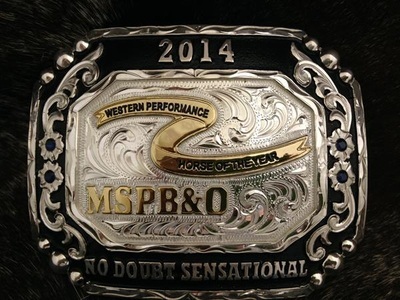 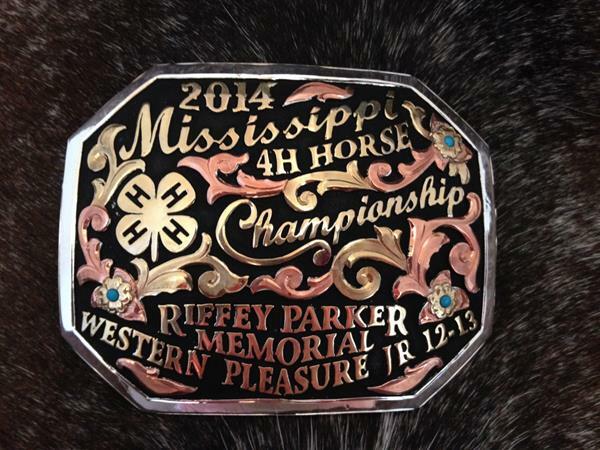 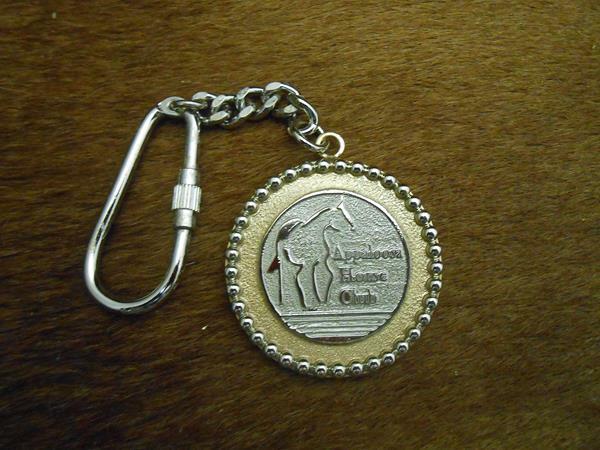 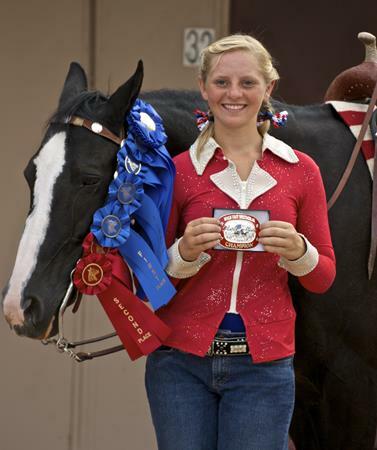 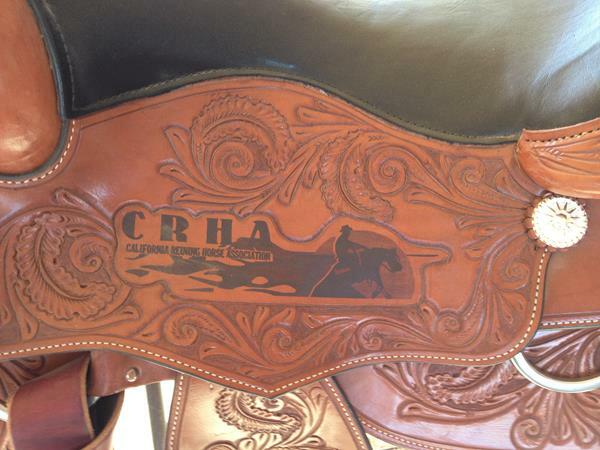 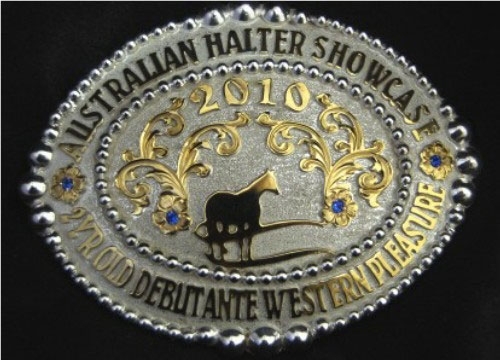 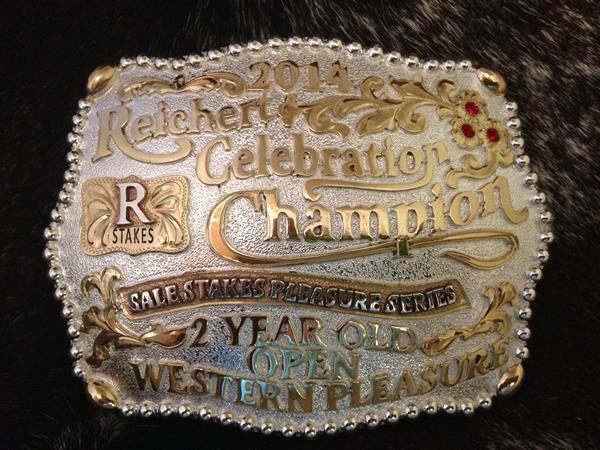 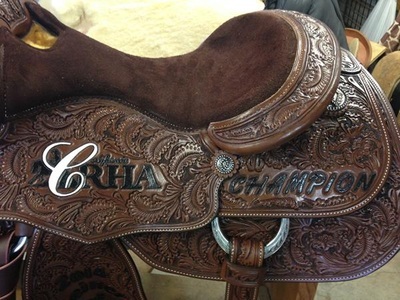 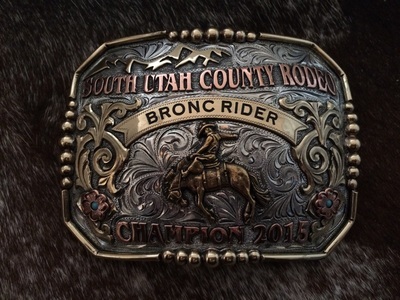 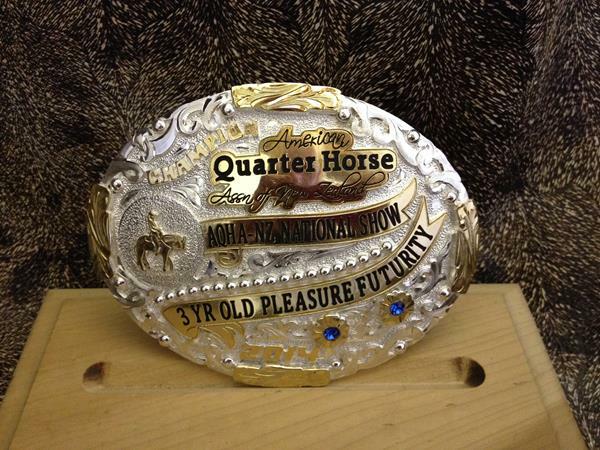 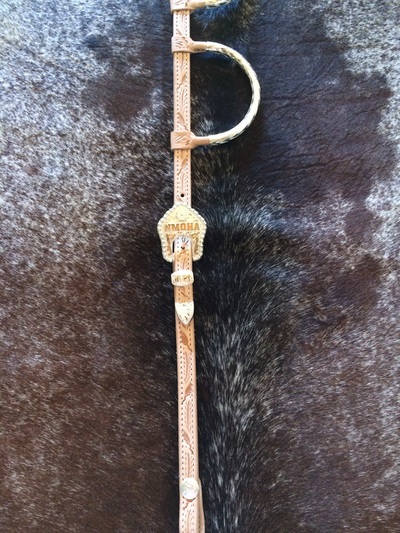 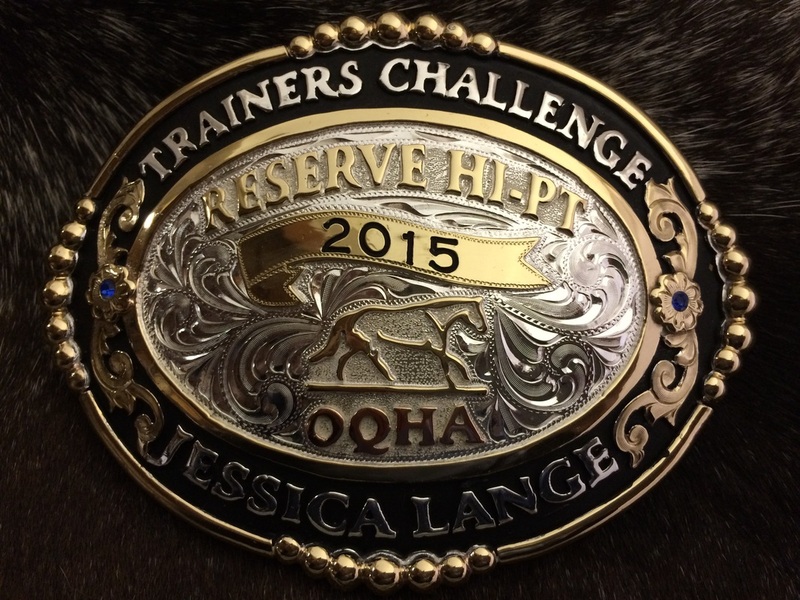 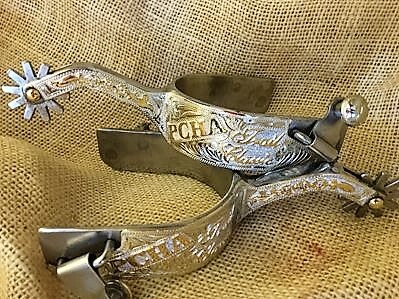 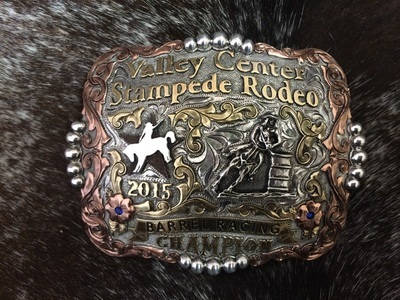 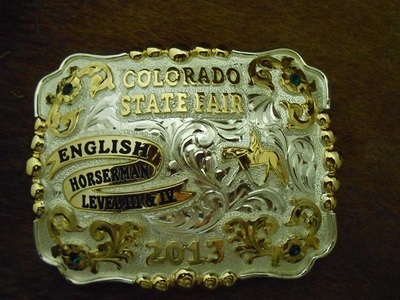 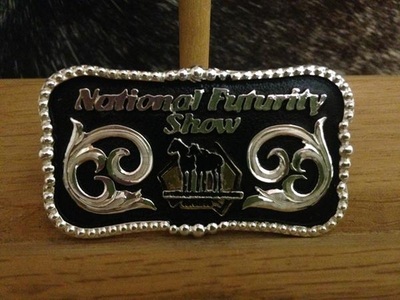 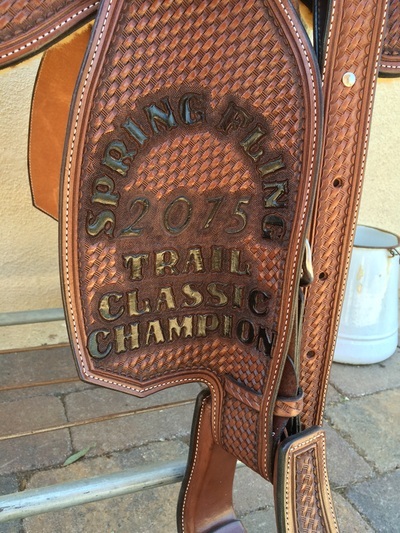 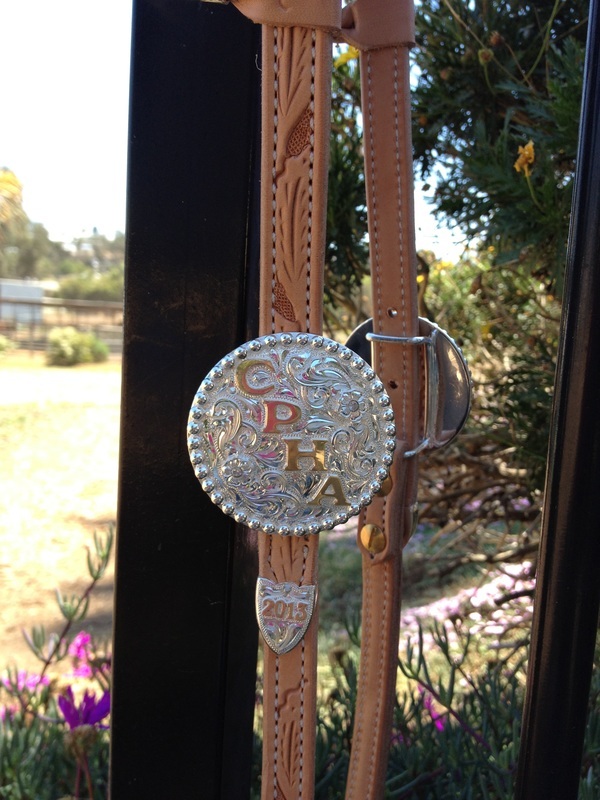 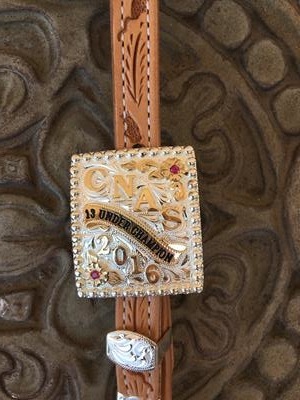 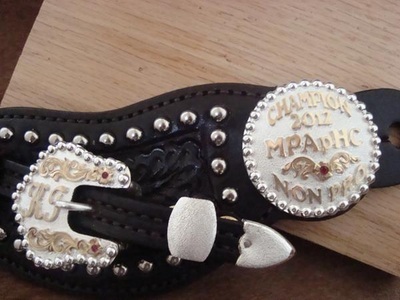 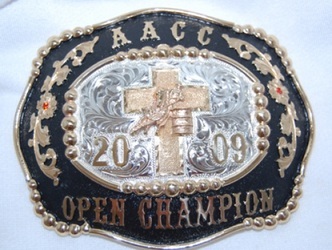 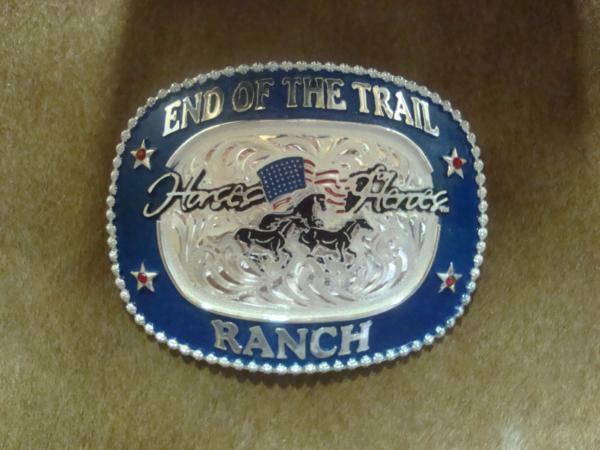 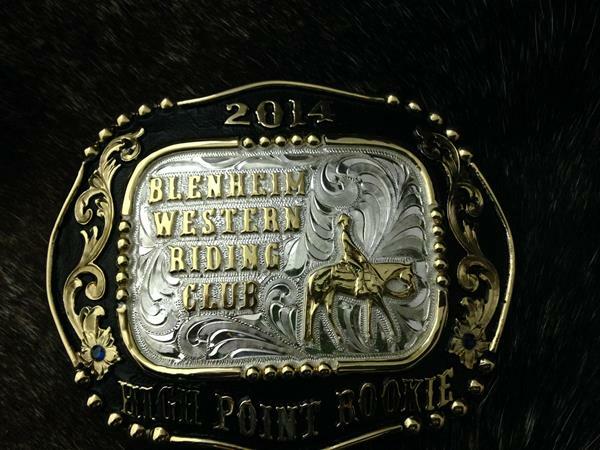 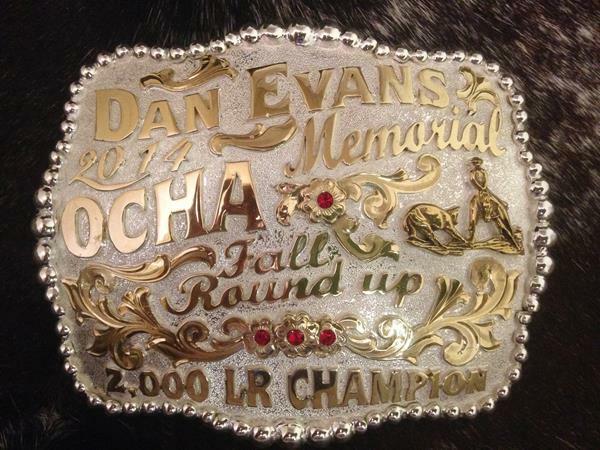 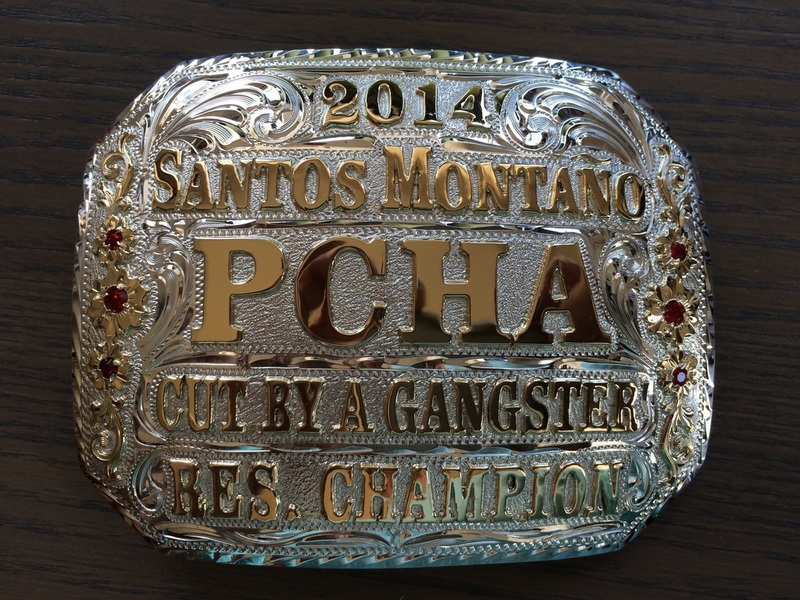 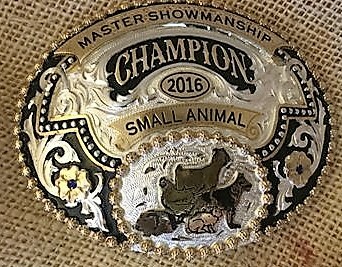 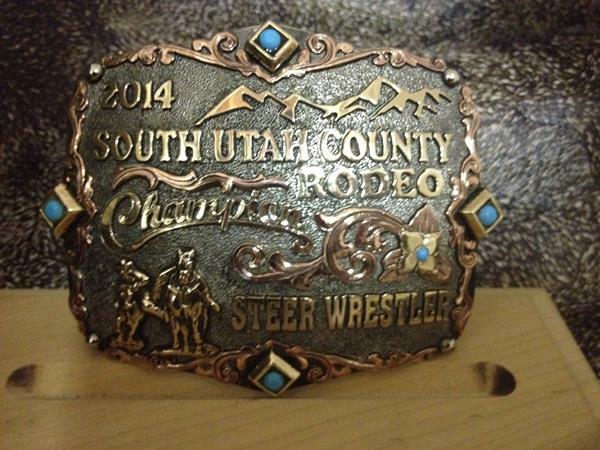 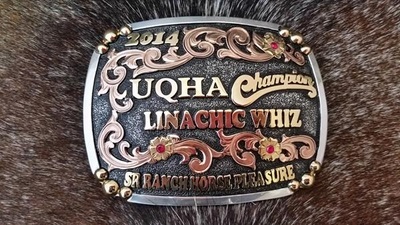 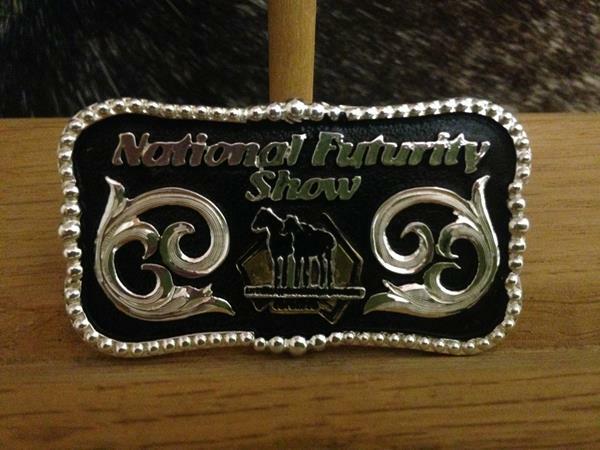 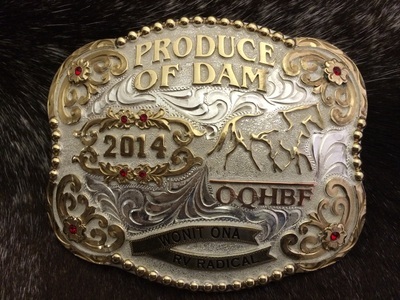 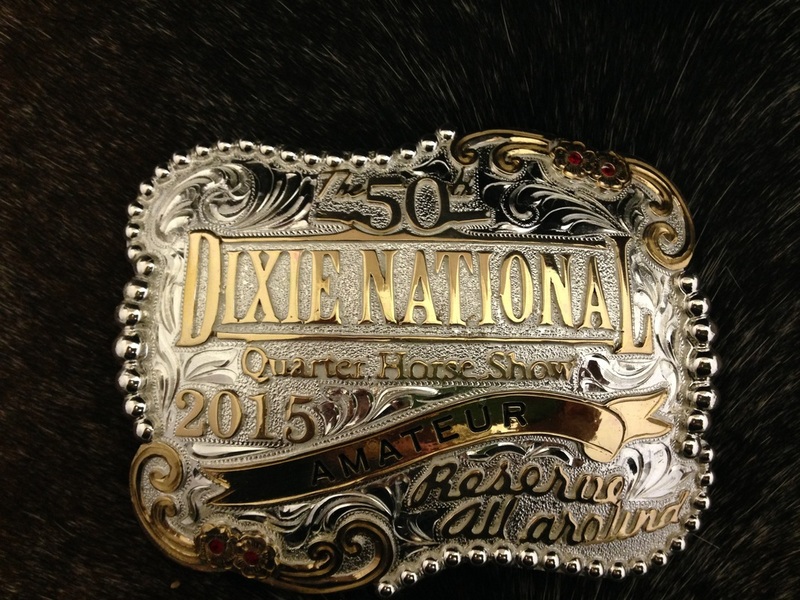 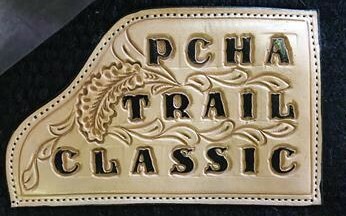 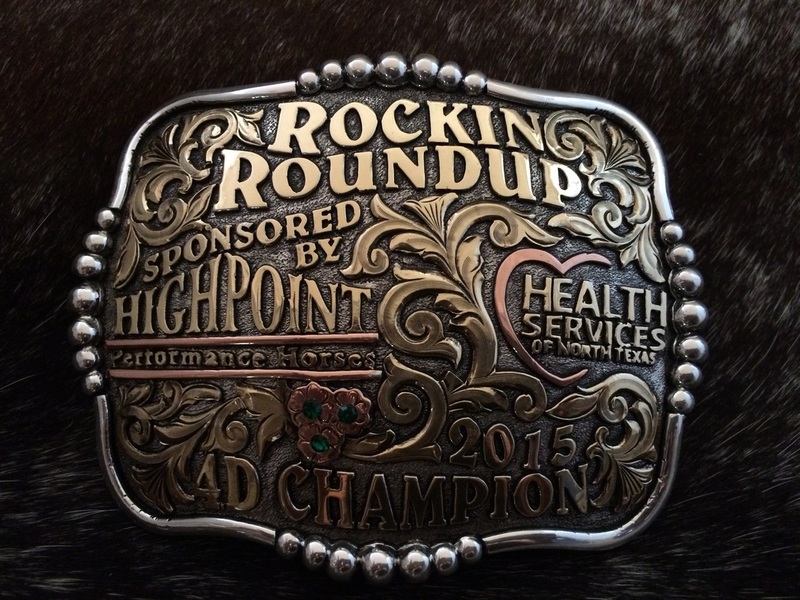 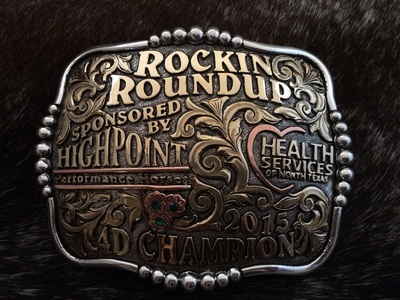 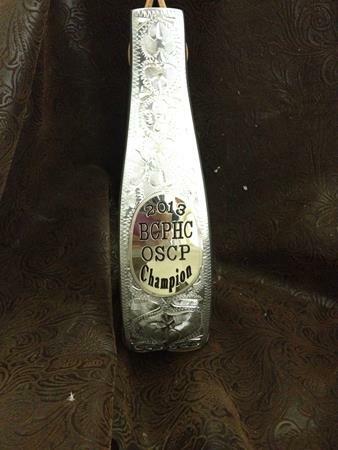 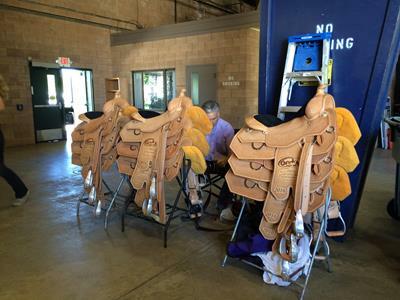 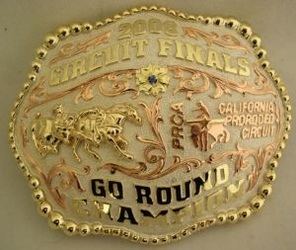 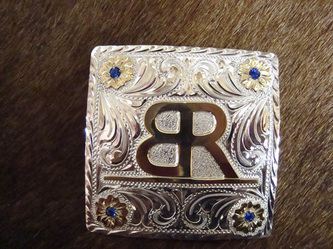 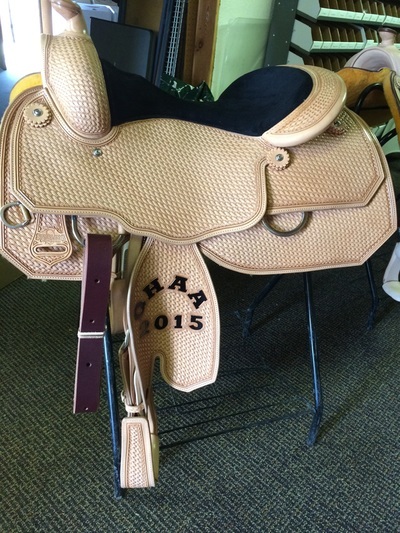 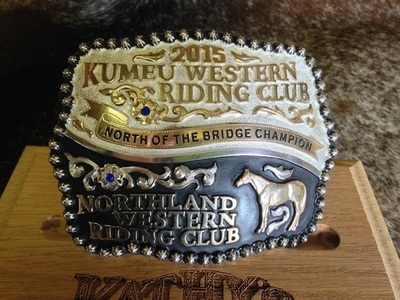 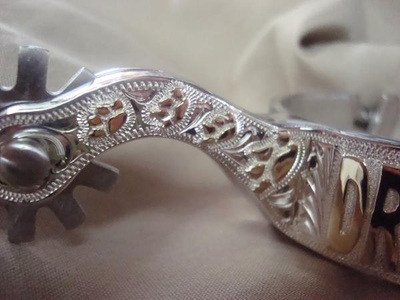 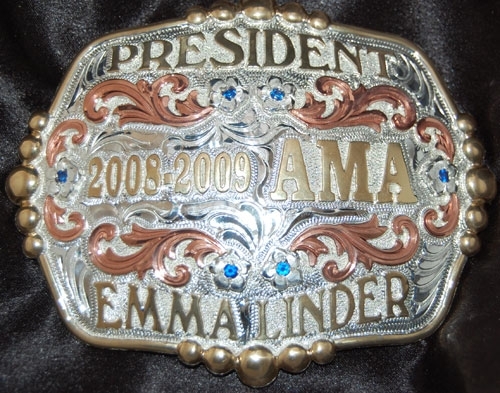 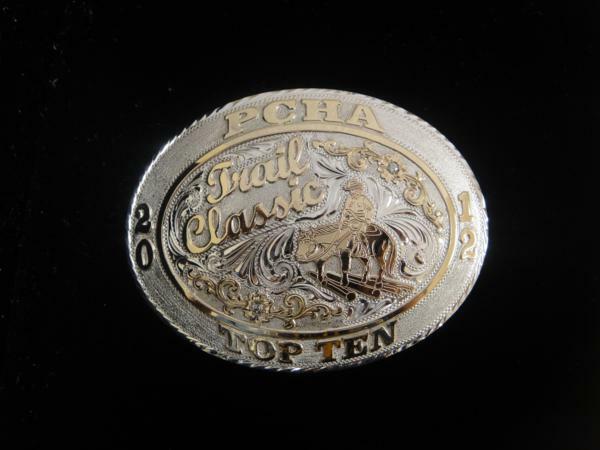 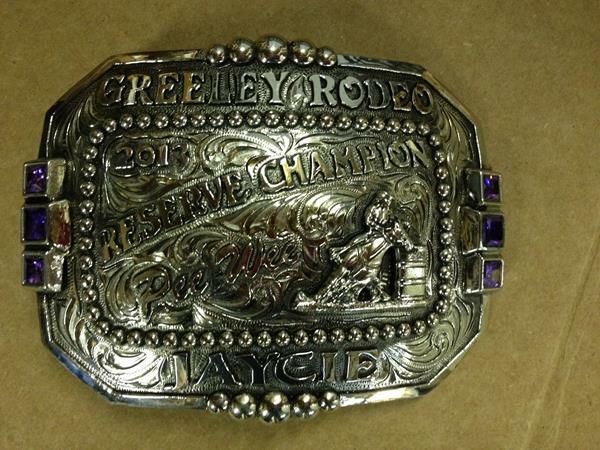 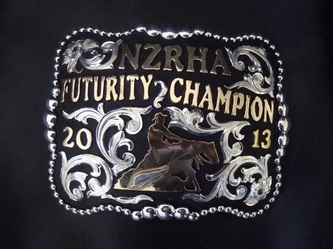 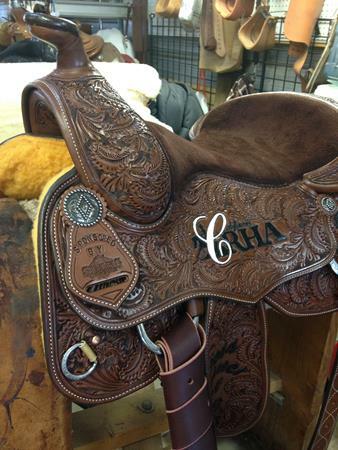 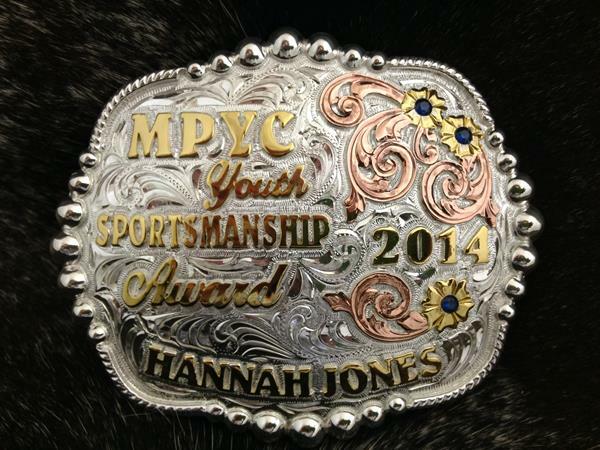 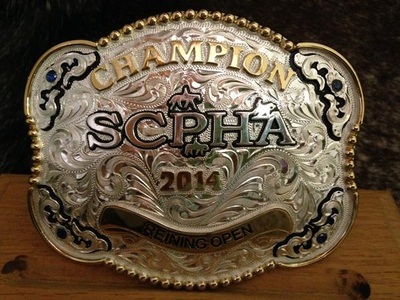 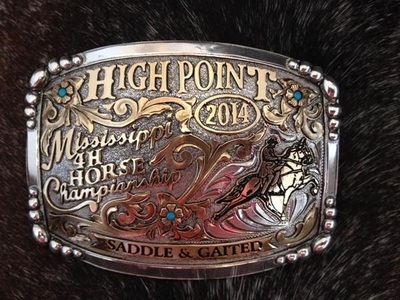 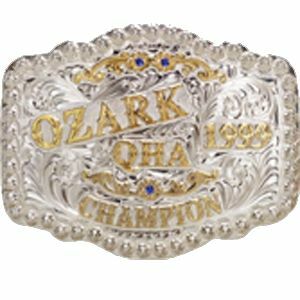 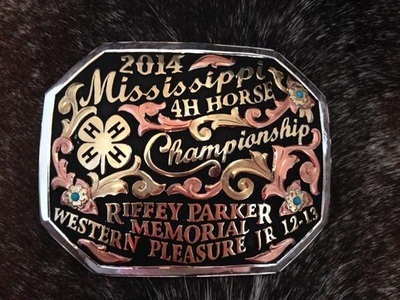 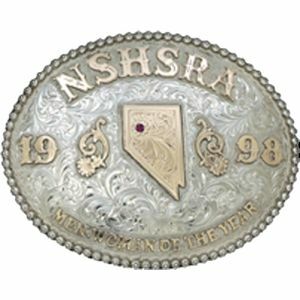 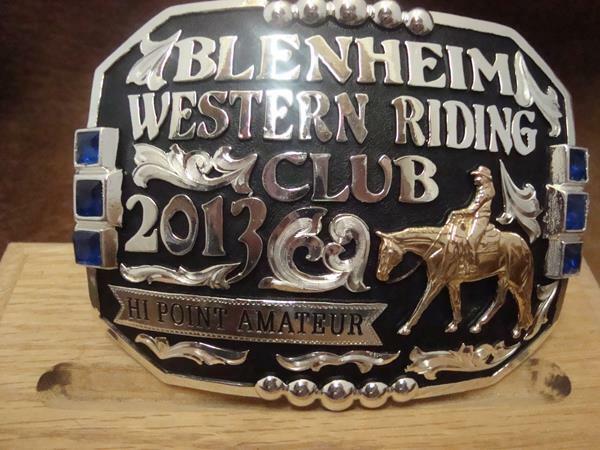 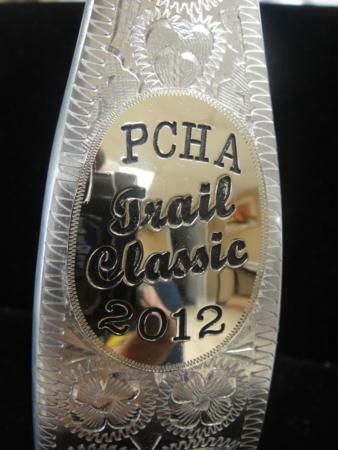 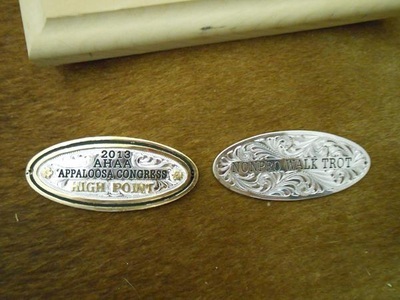 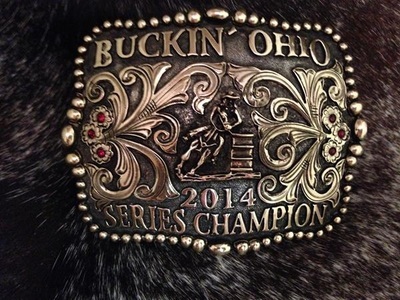 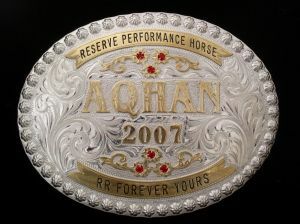 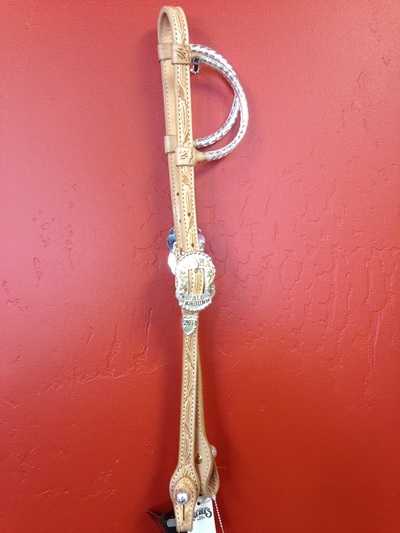 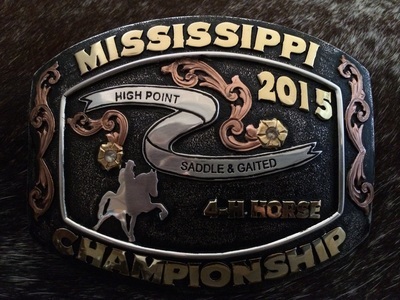 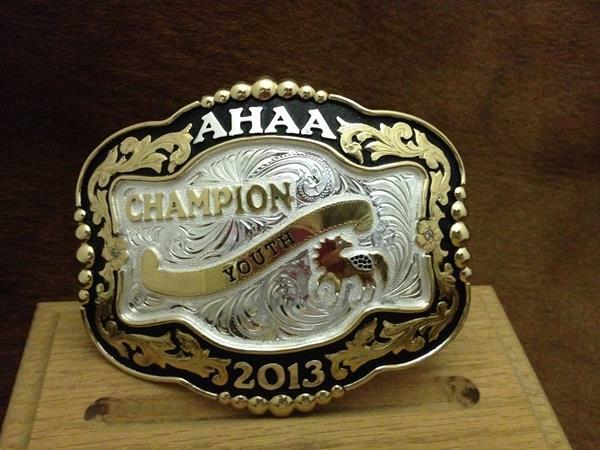 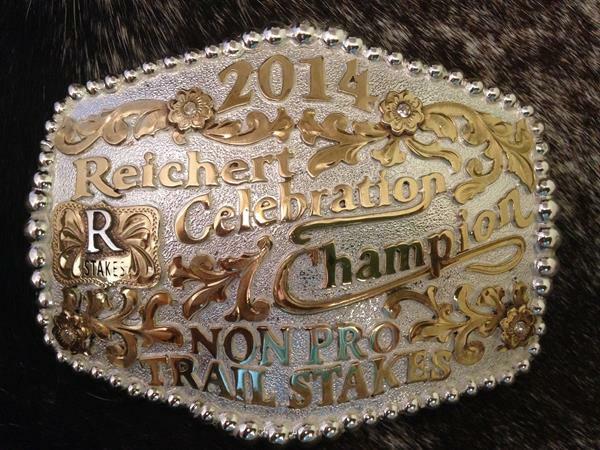 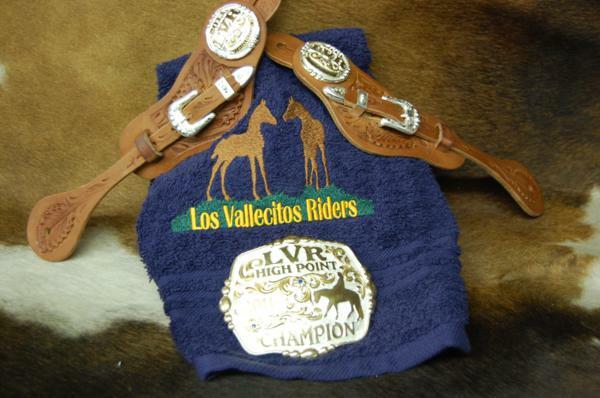 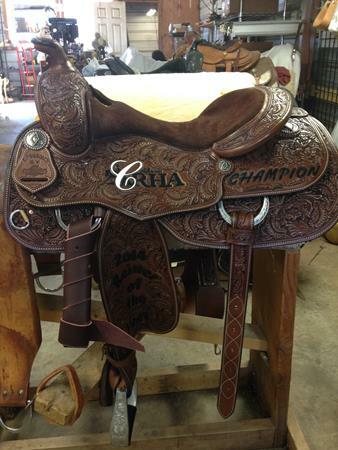 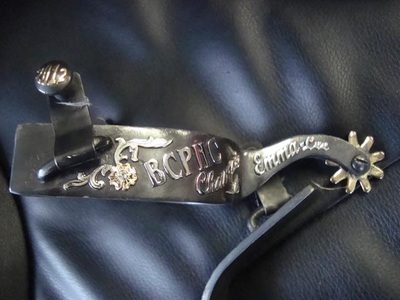 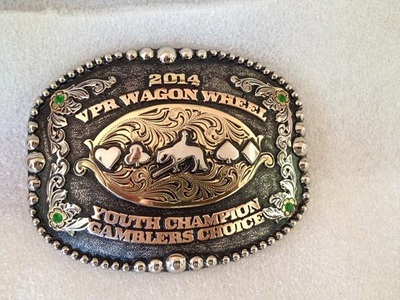 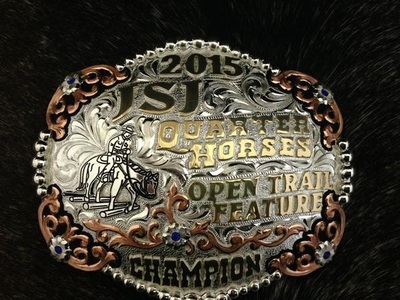 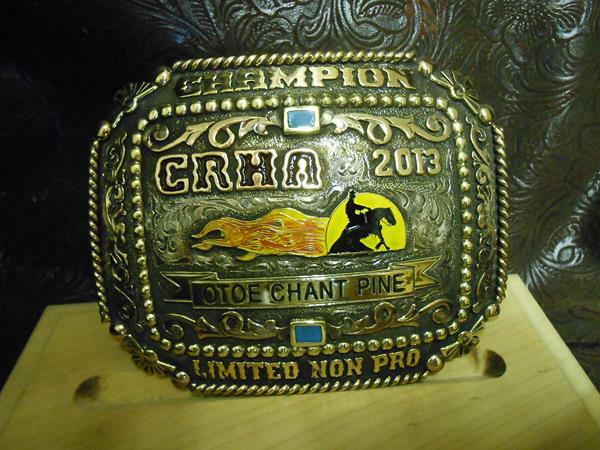 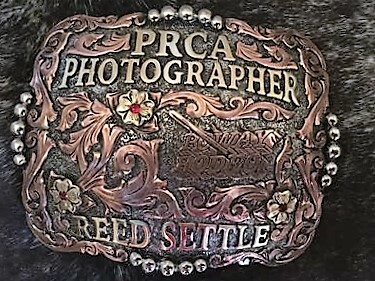 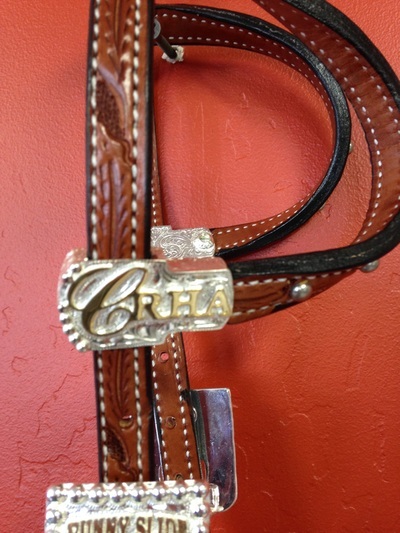 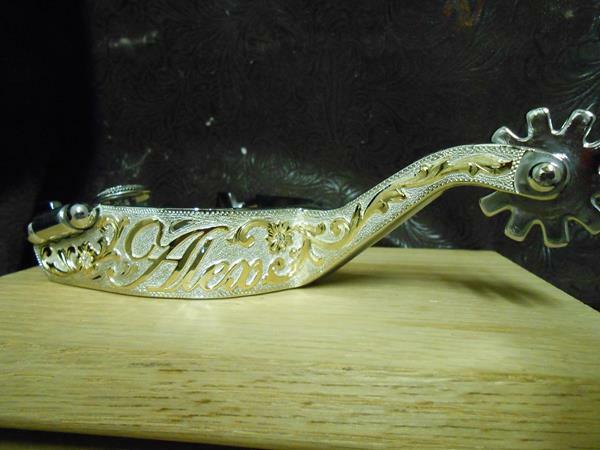 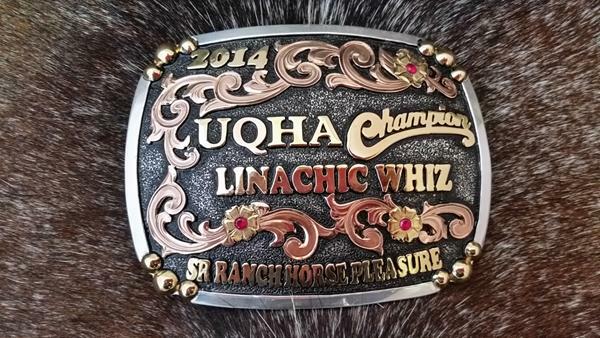 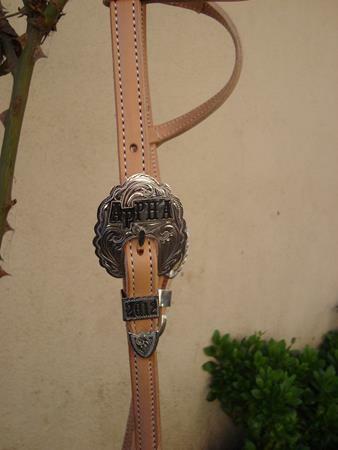 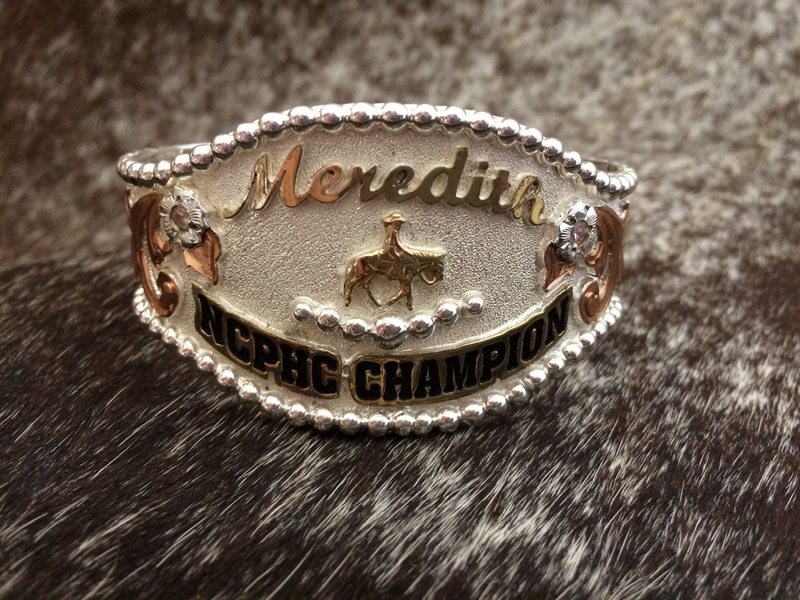 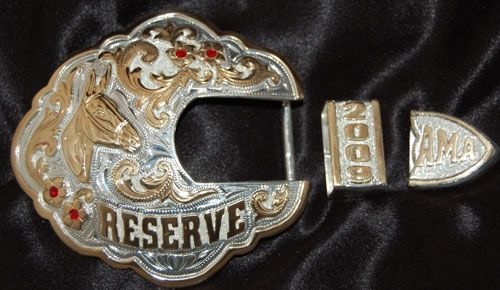 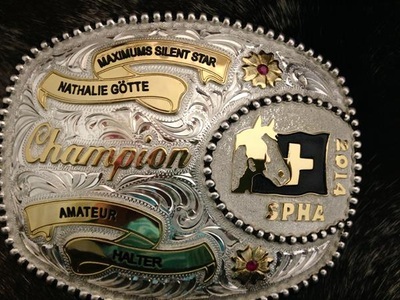 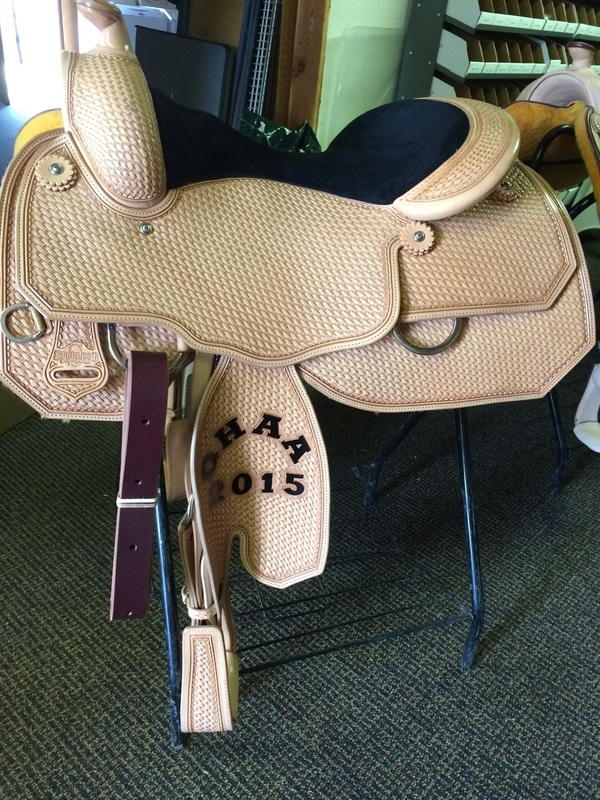 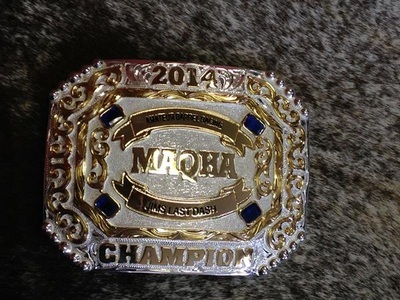 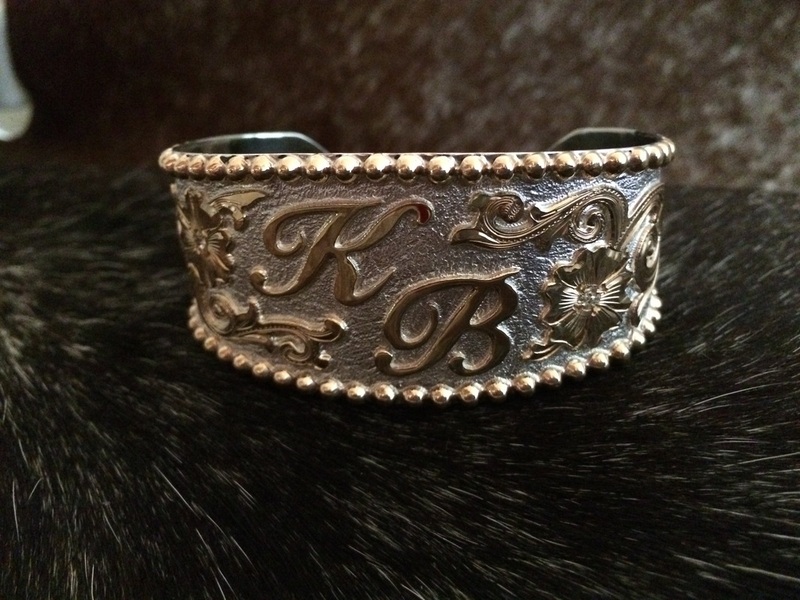 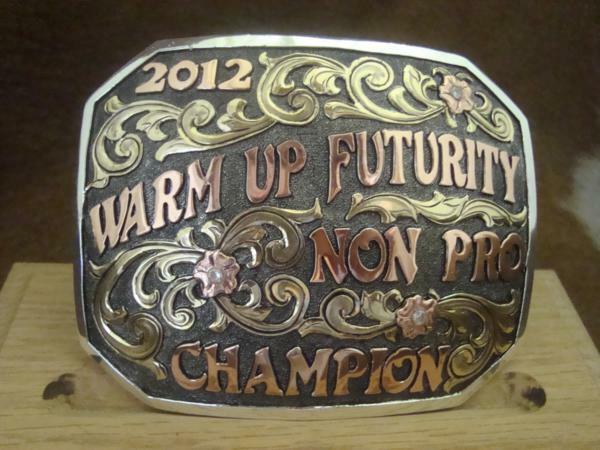 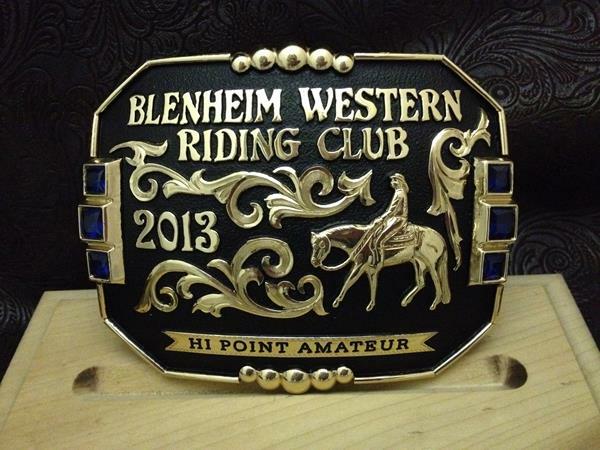 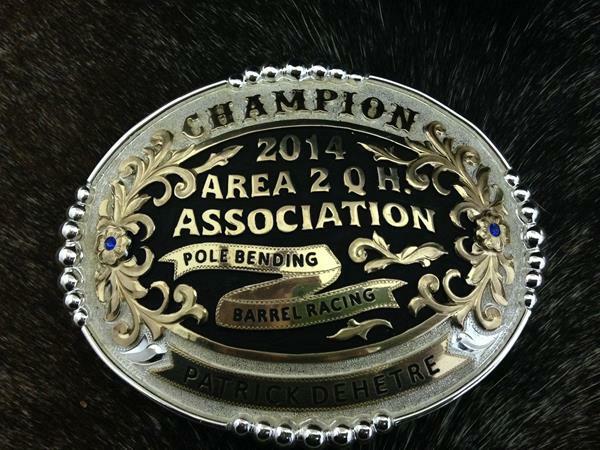 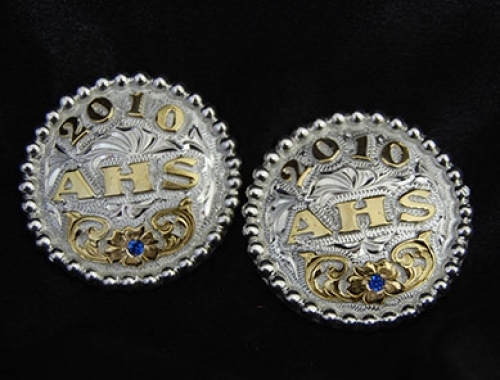 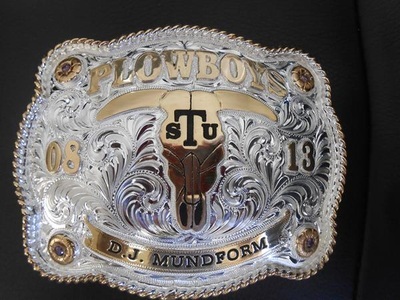 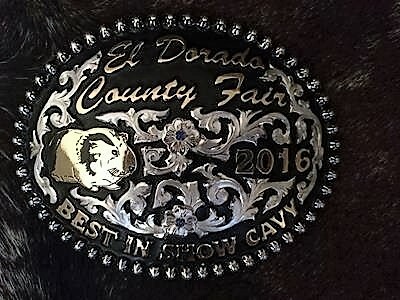 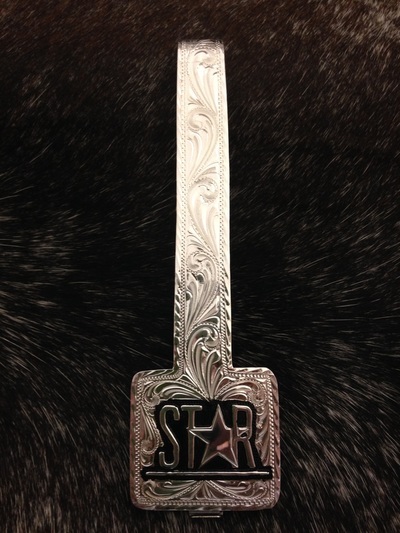 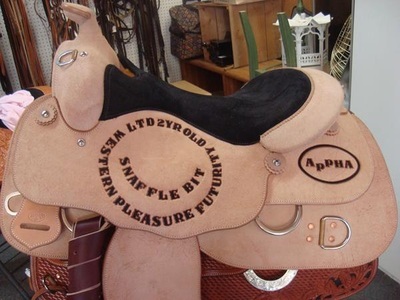 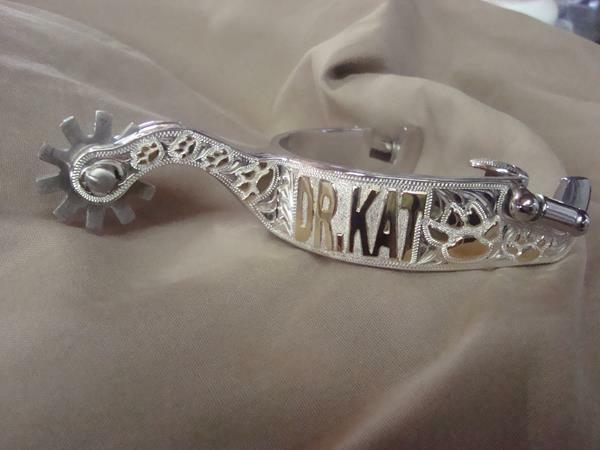 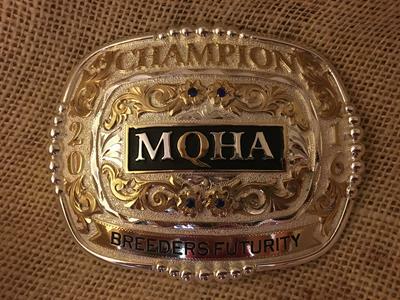 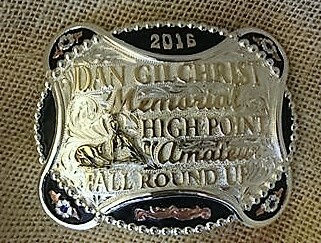 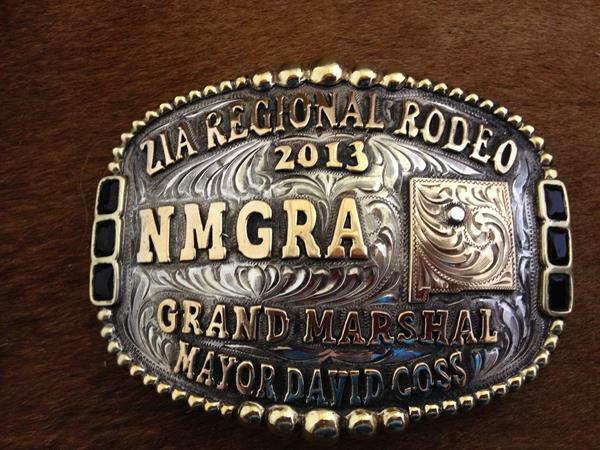 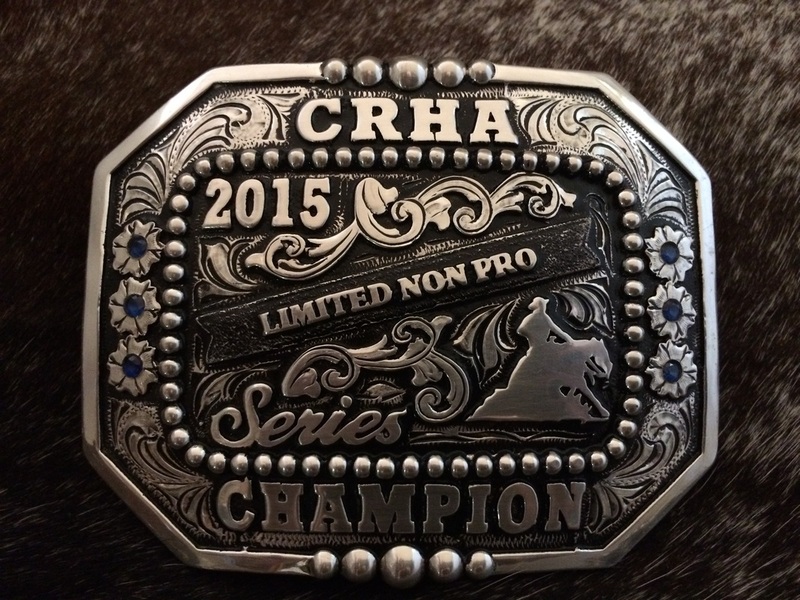 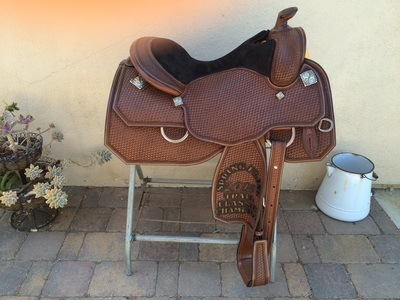 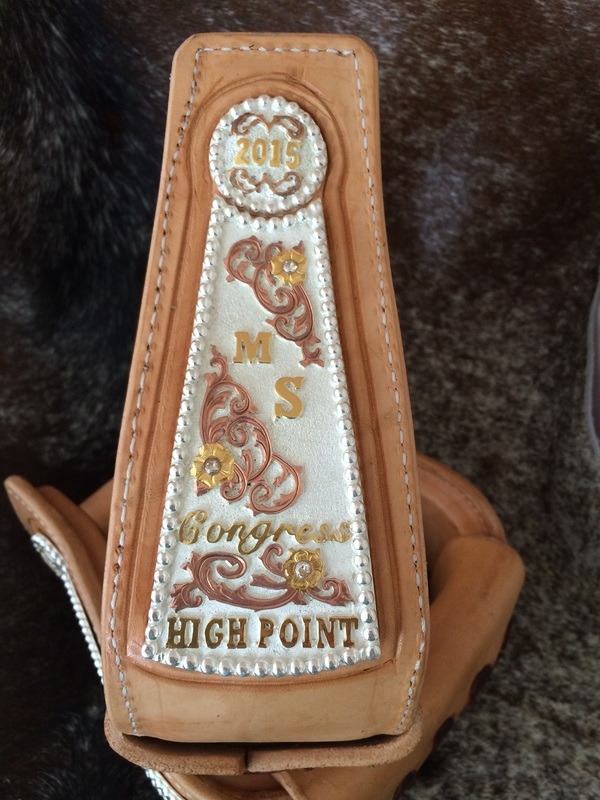 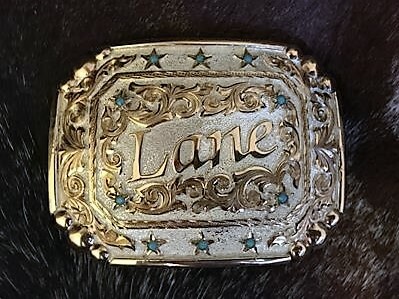 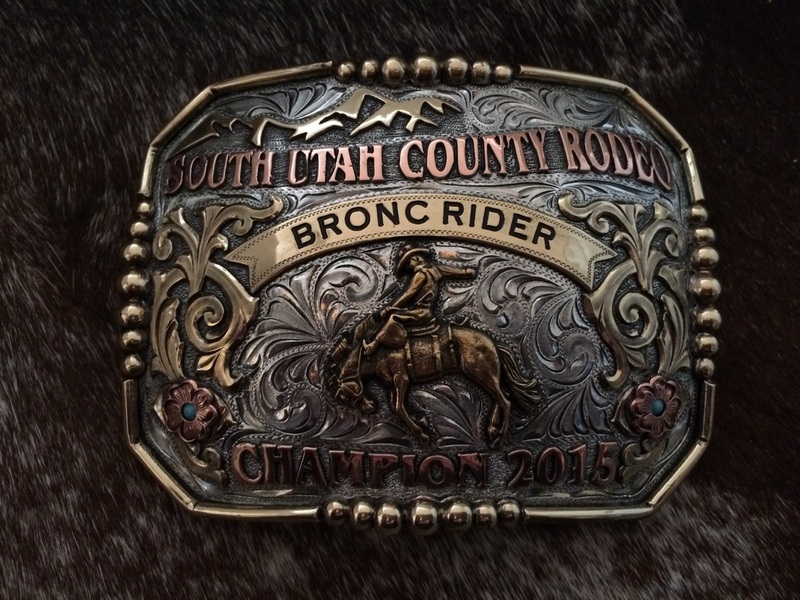 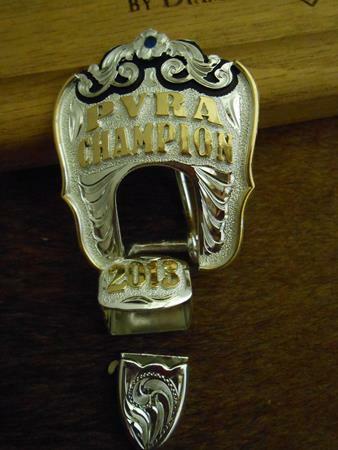 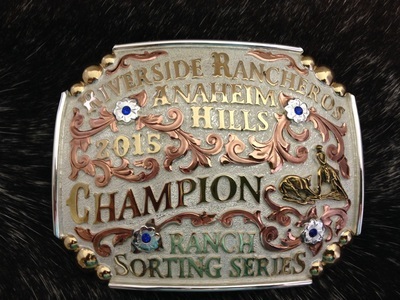 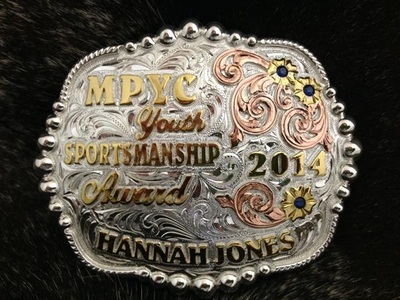 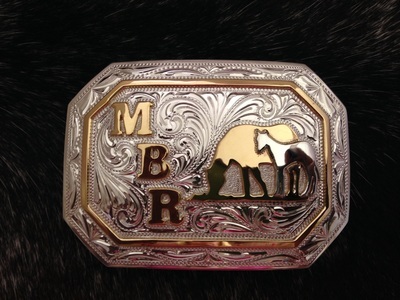 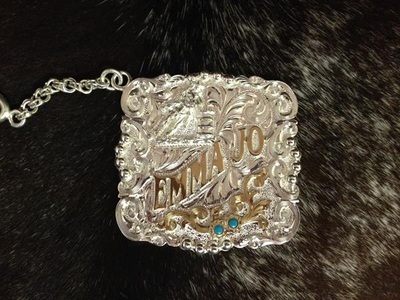 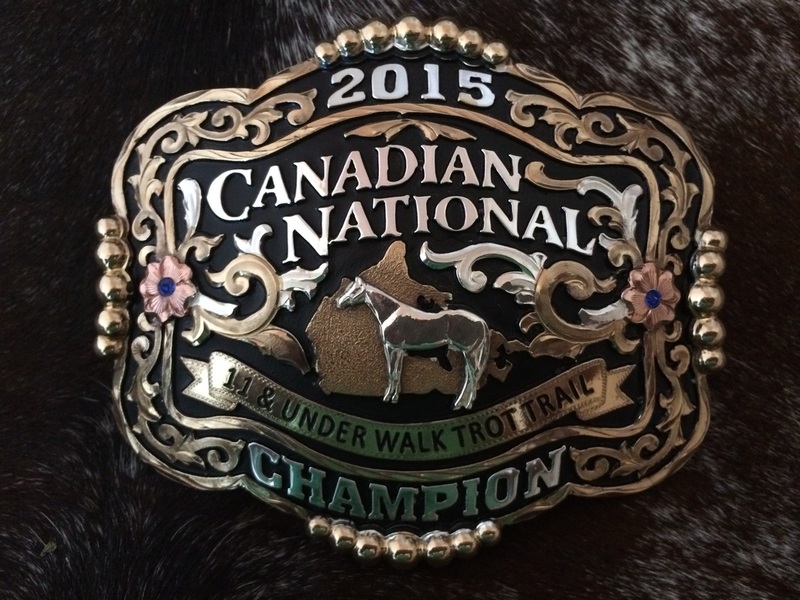 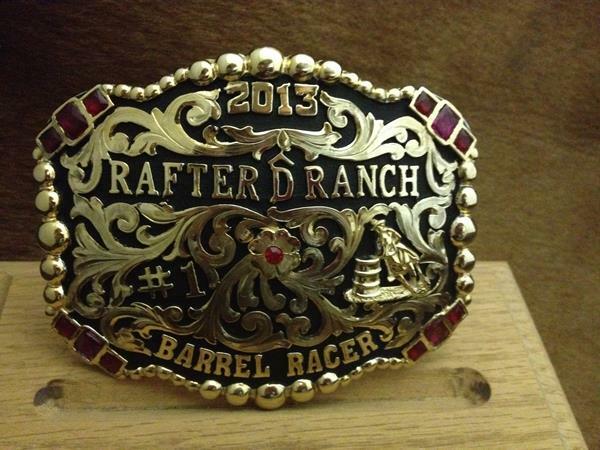 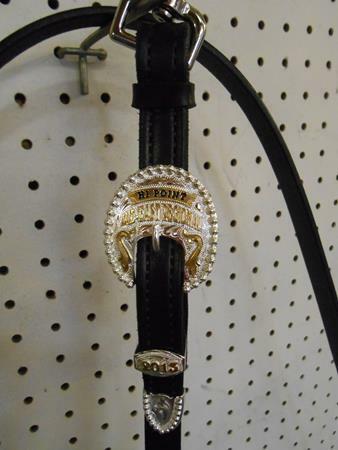 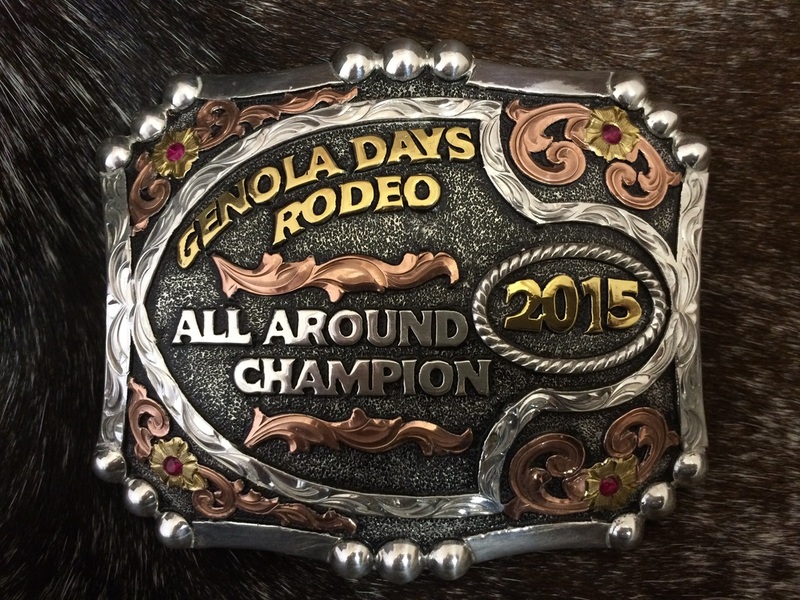 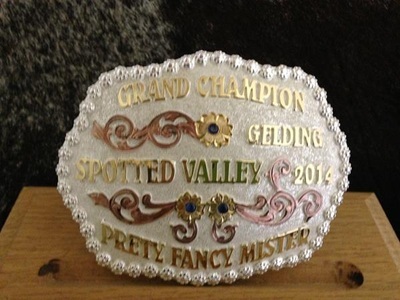 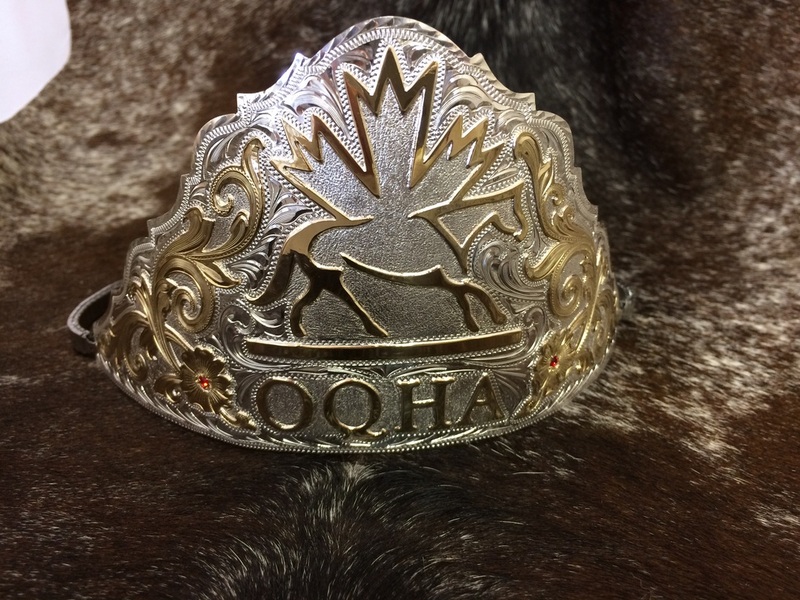 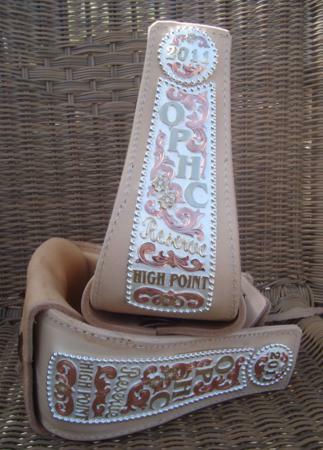 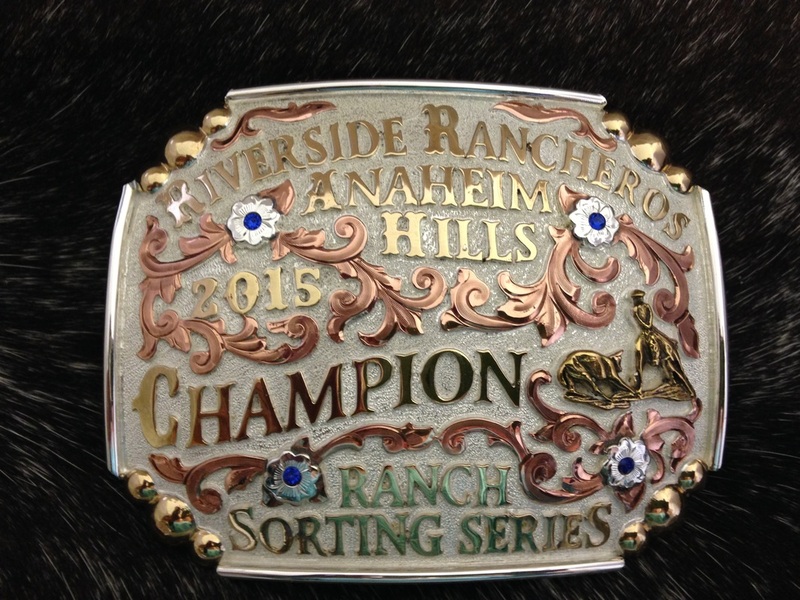 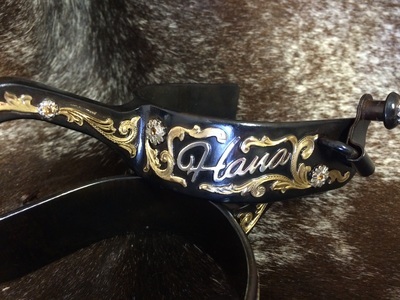 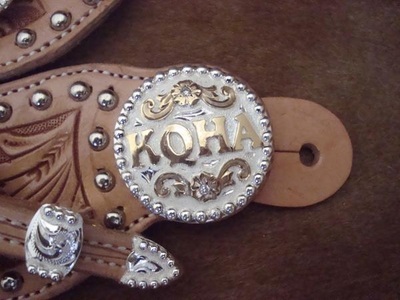 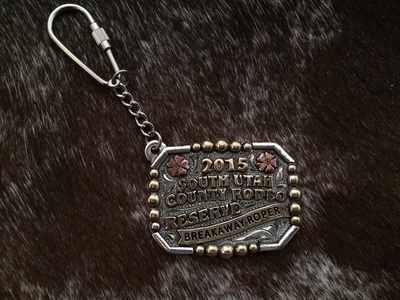 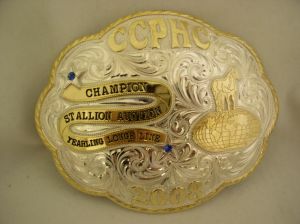 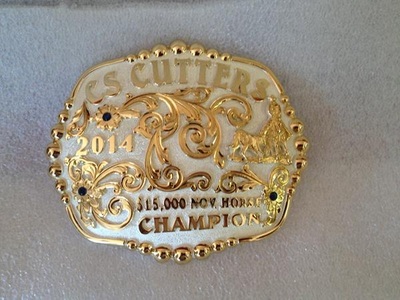 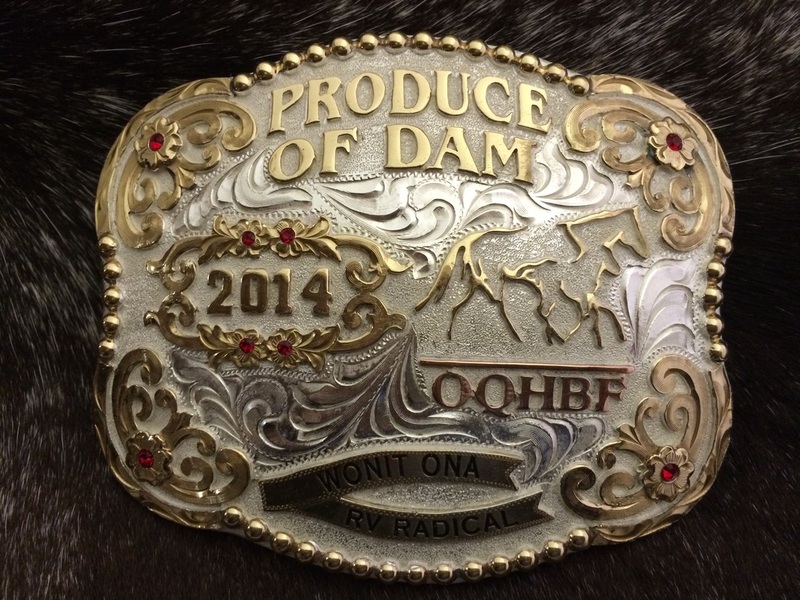 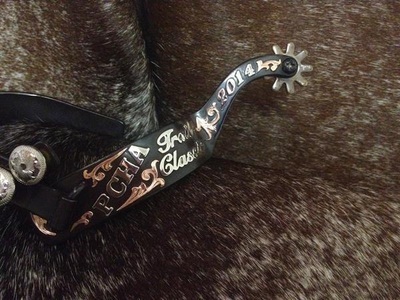 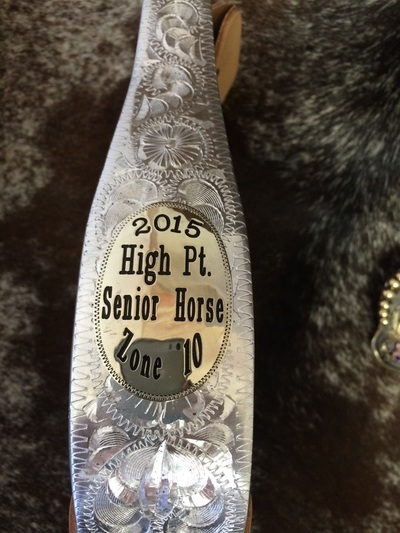 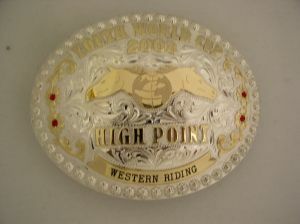 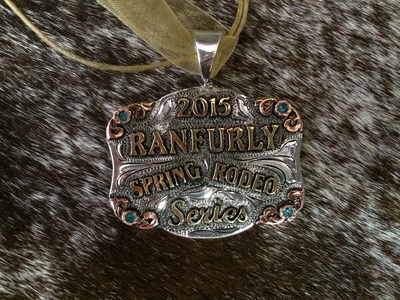 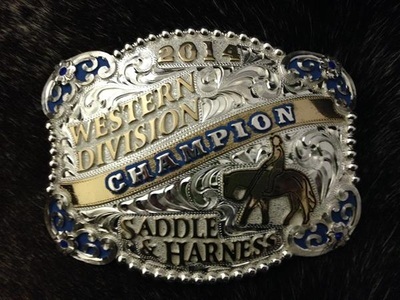 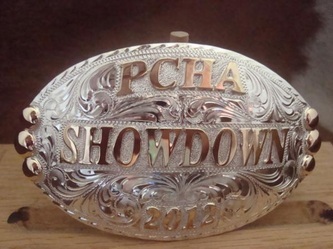 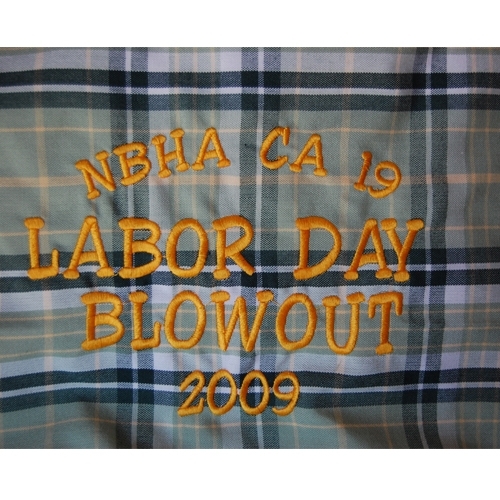 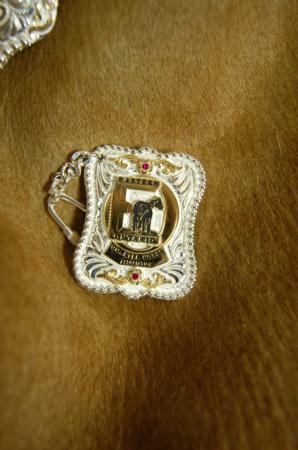 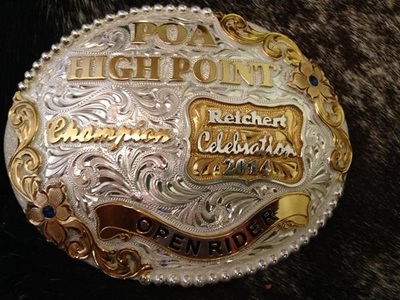 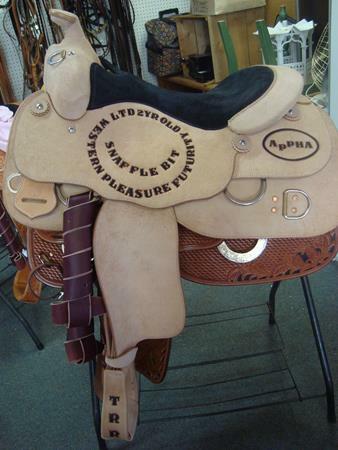 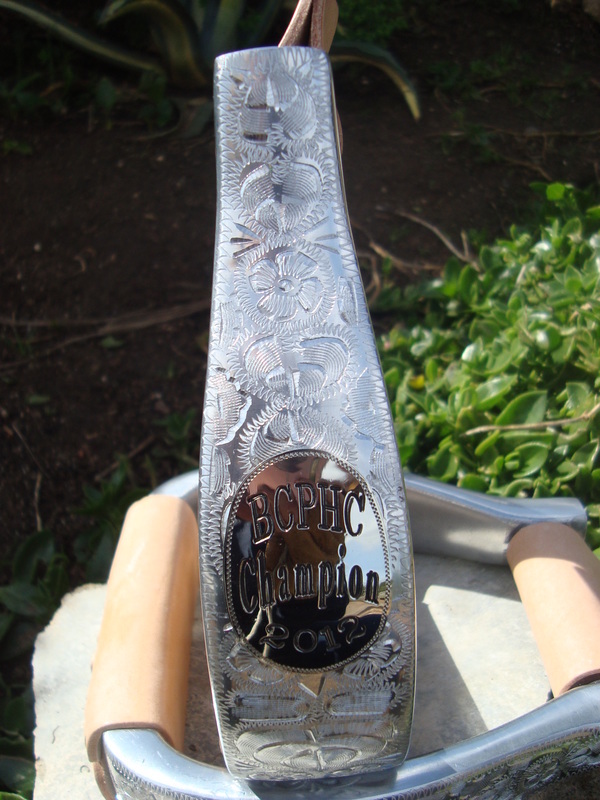 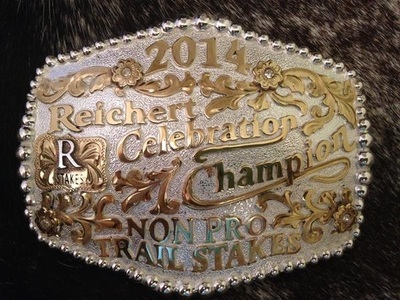 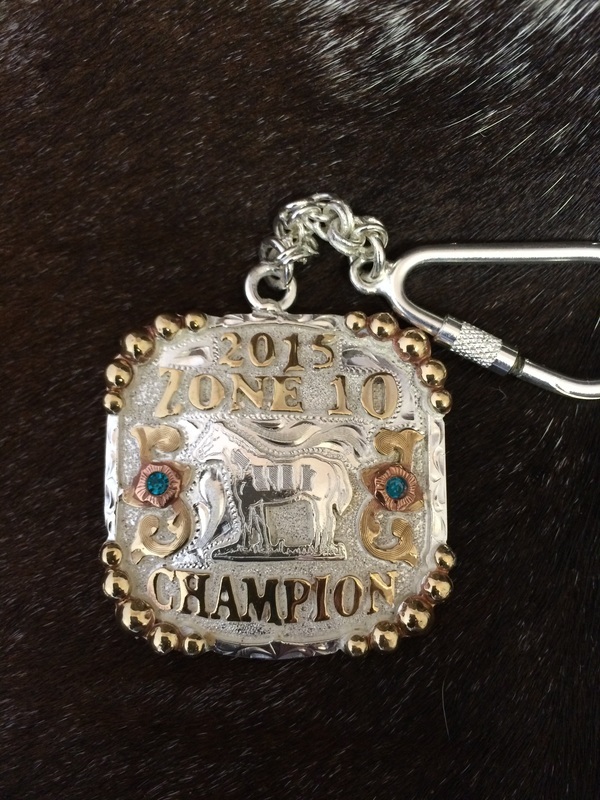 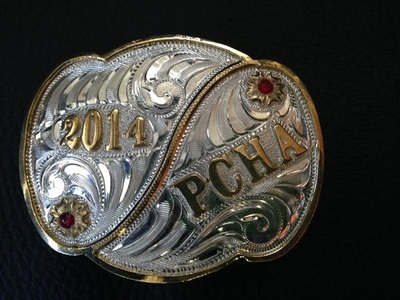 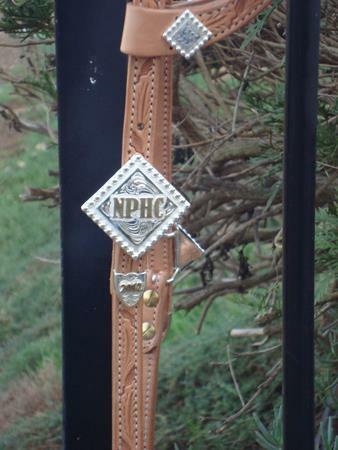 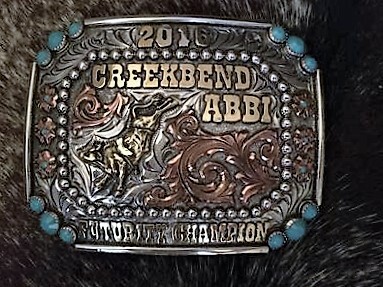 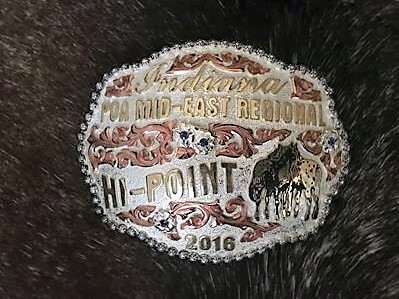 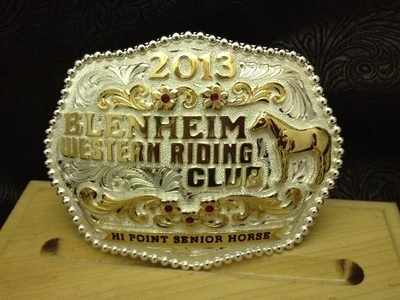 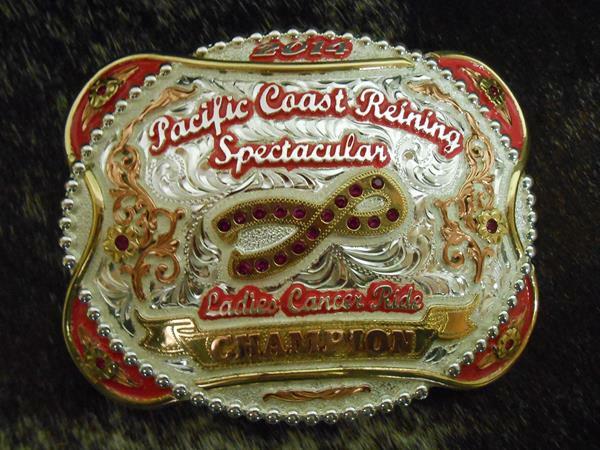 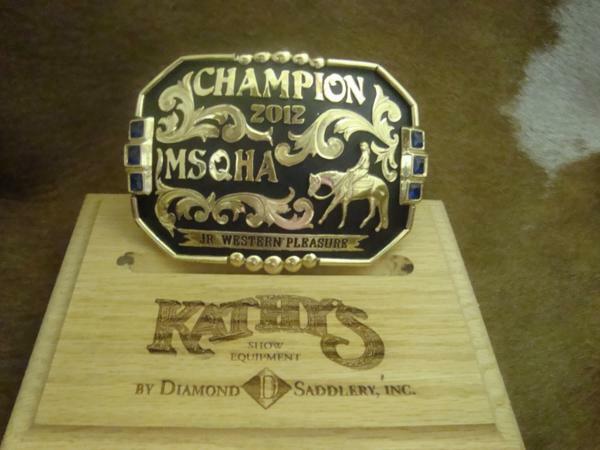 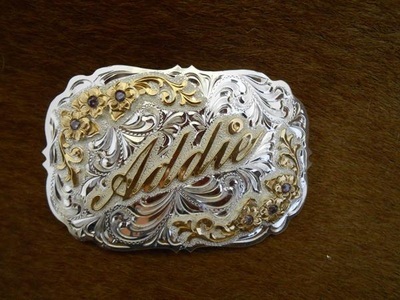 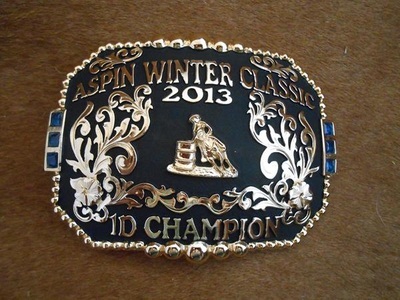 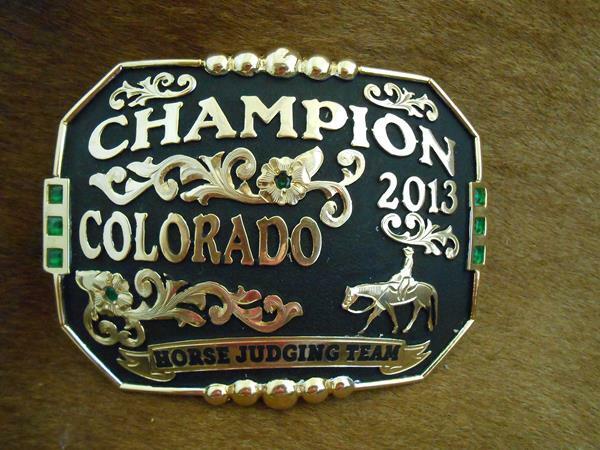 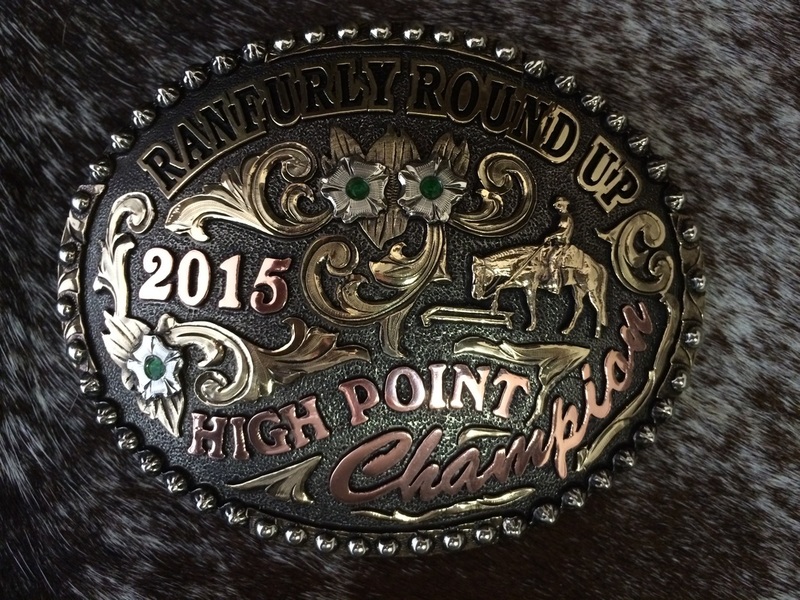 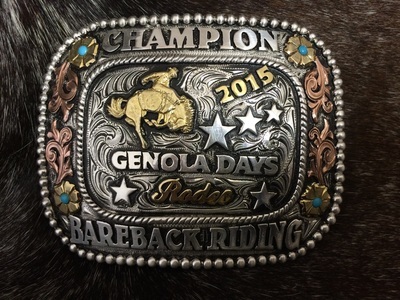 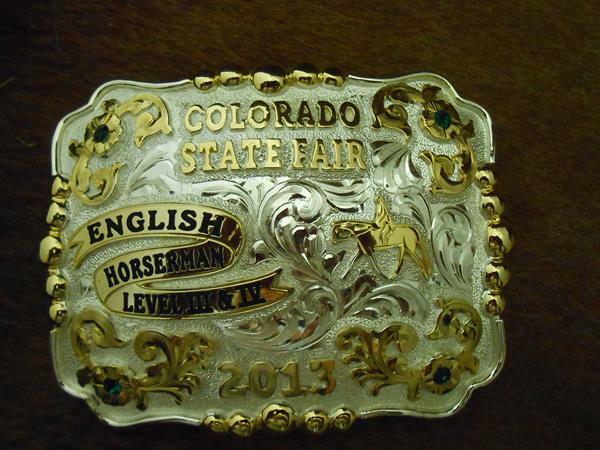 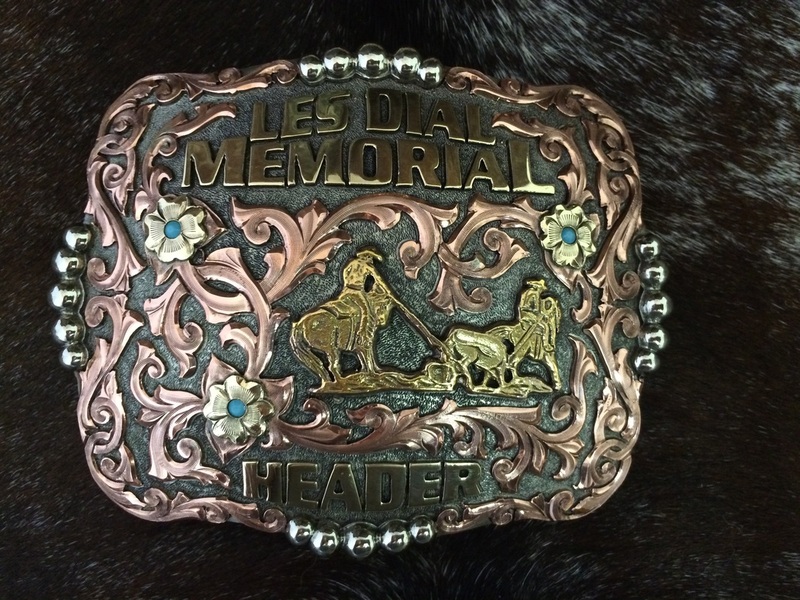 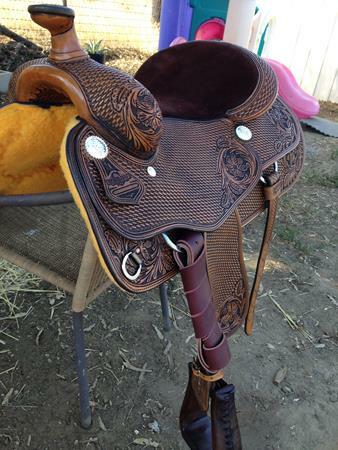 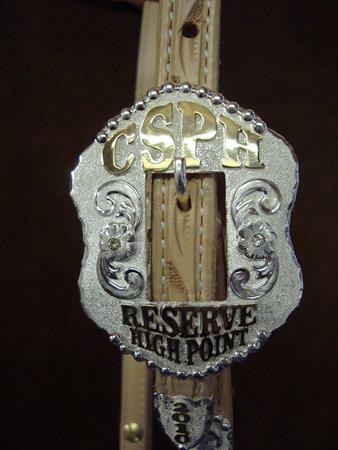 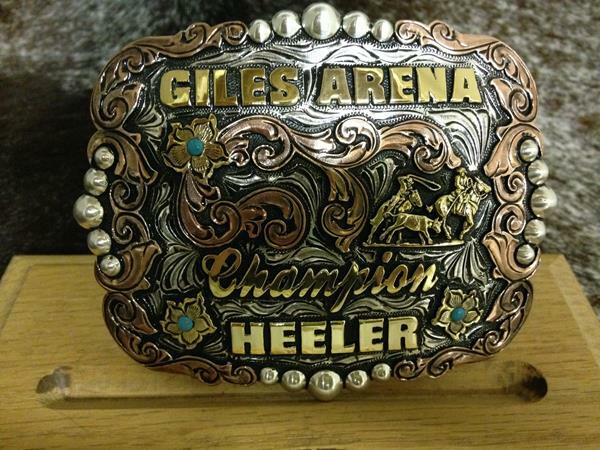 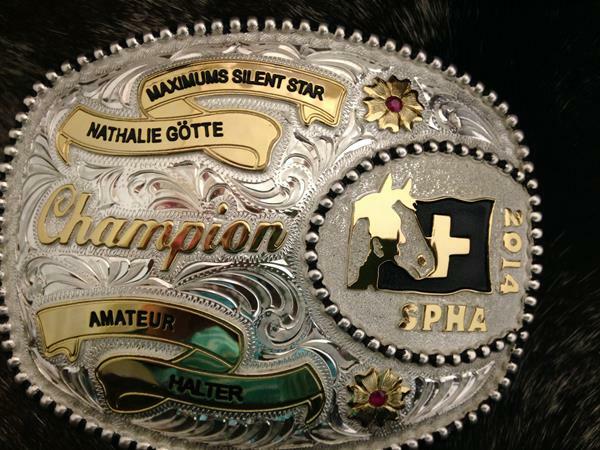 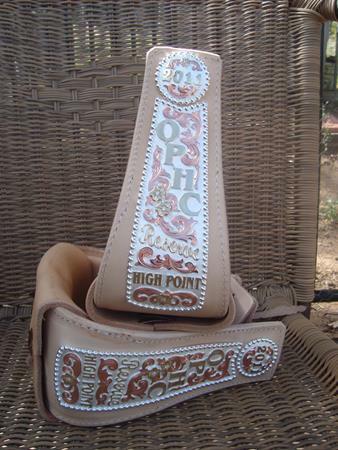 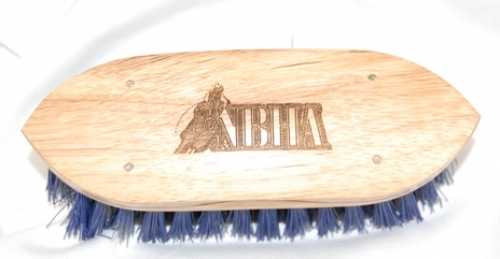 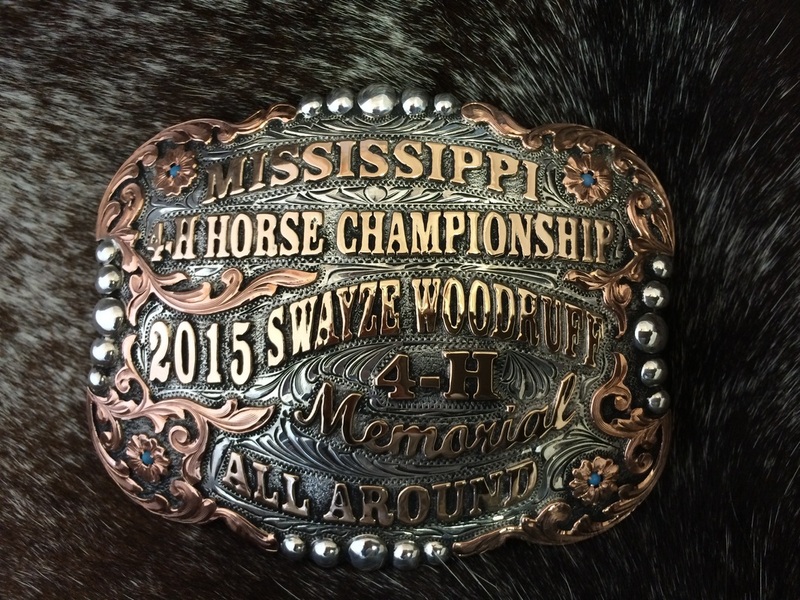 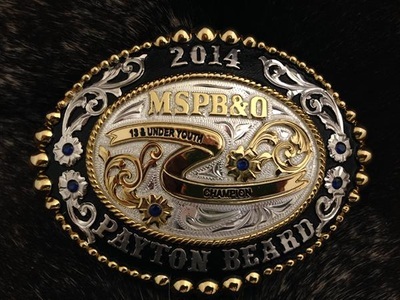 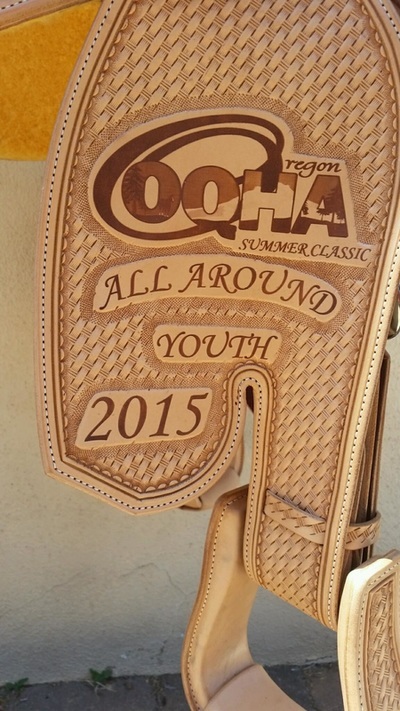 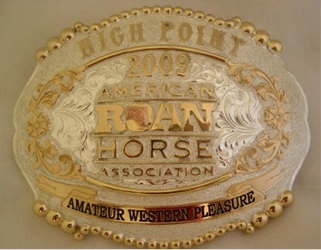 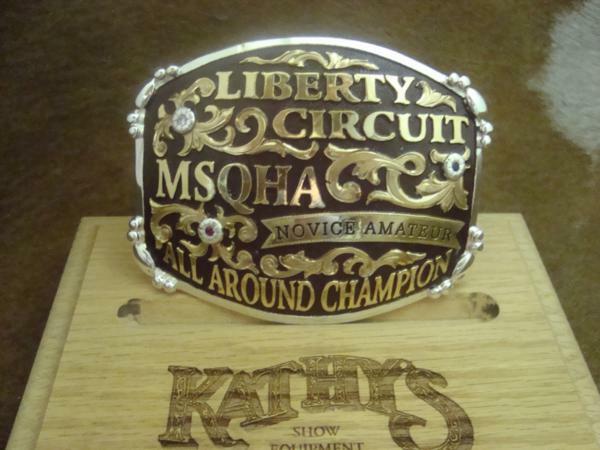 We have custom trophy buckles, , spur straps, custom silver stirrups, silver knifes, silver engraved key chains, specialty personal buckles, hand painted items, engraved awards and embroidery items to pick from. 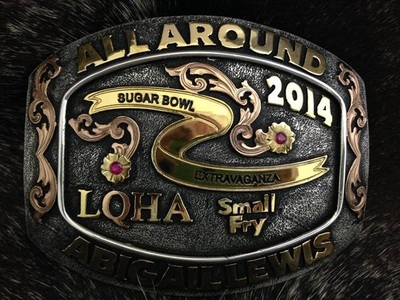 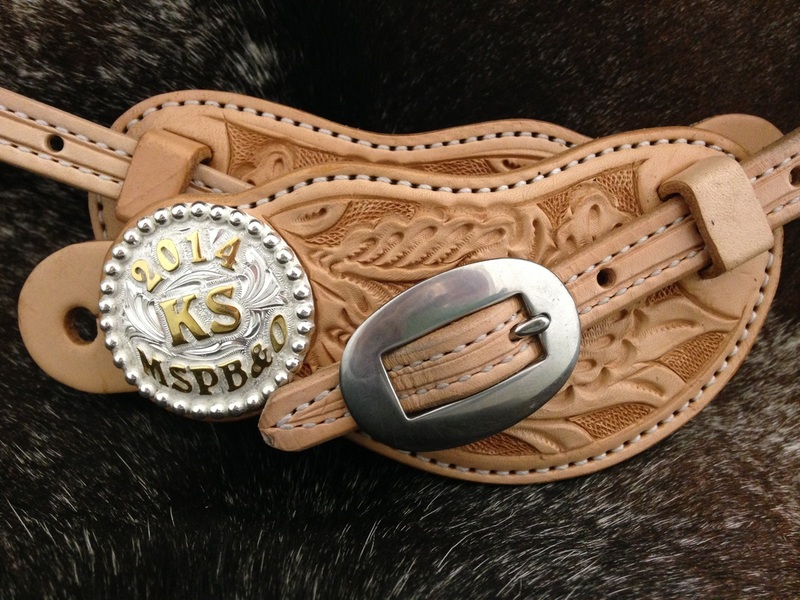 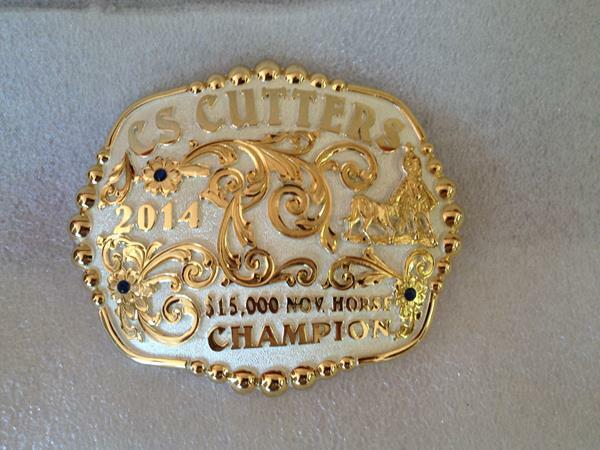 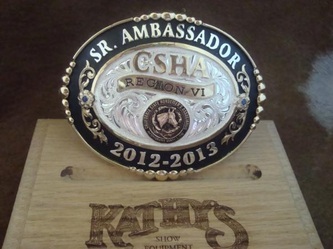 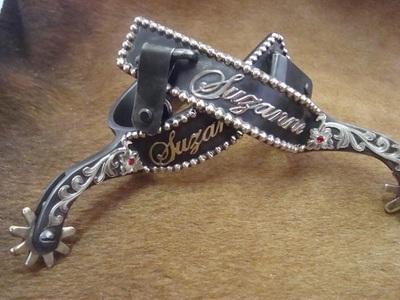 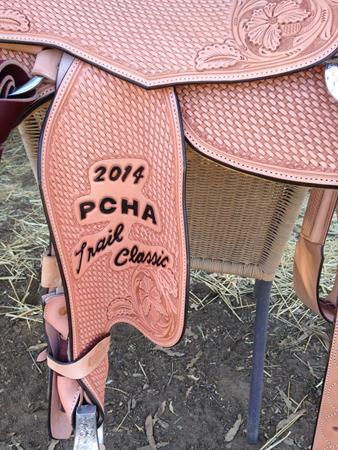 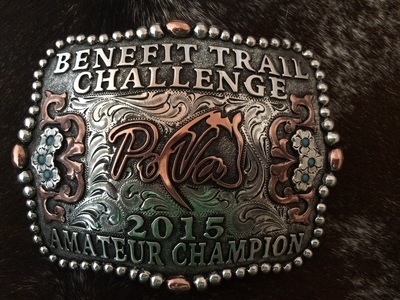 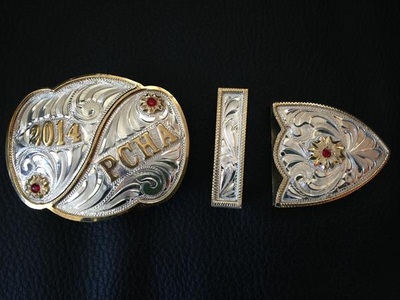 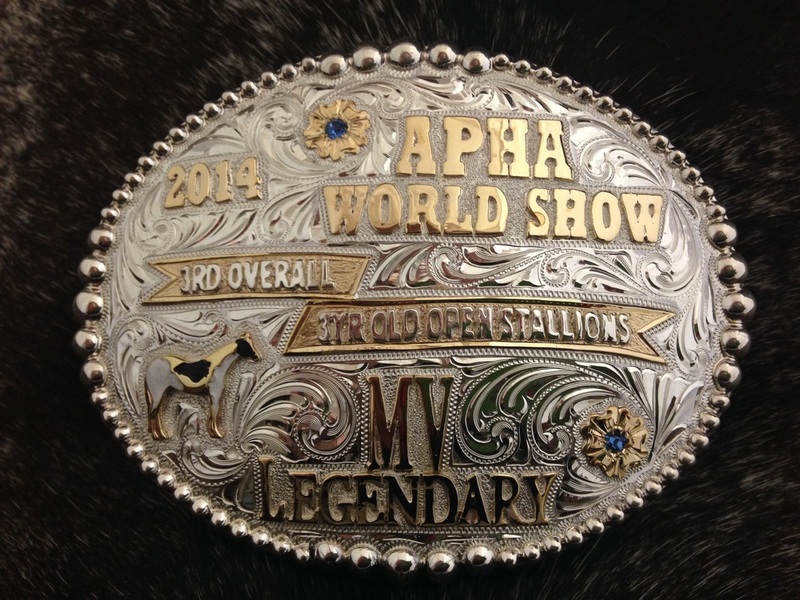 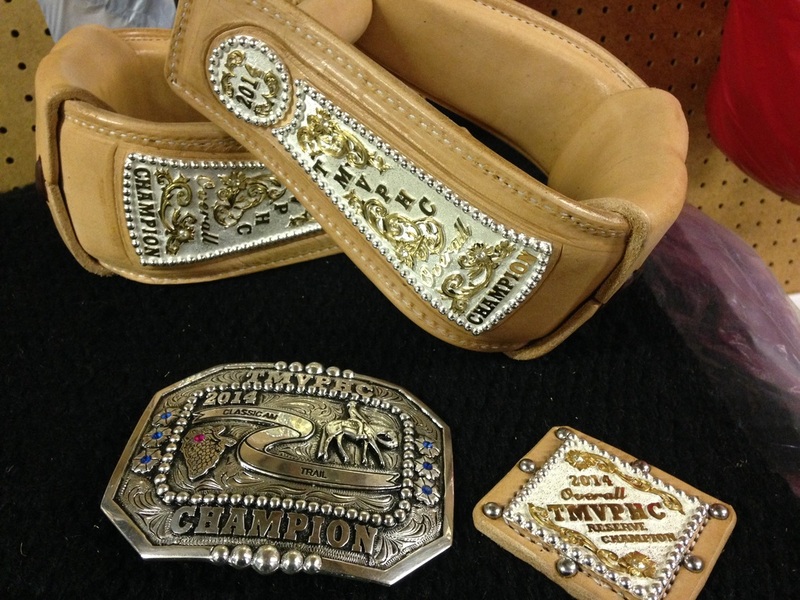 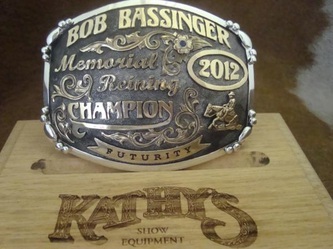 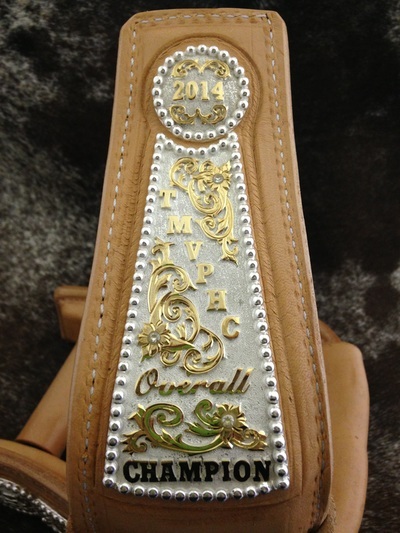 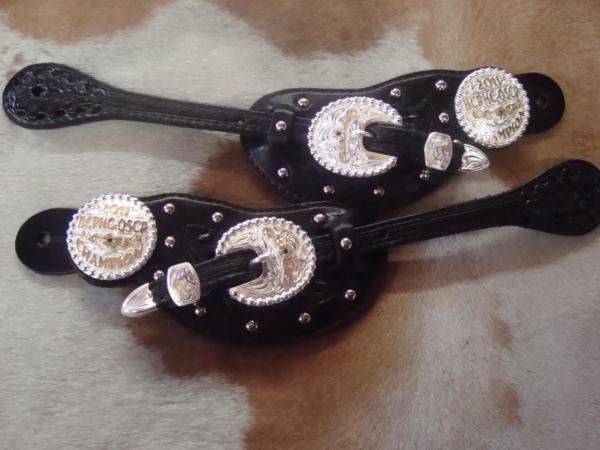 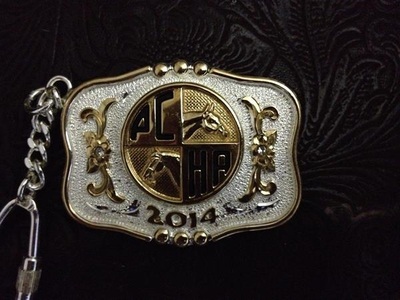 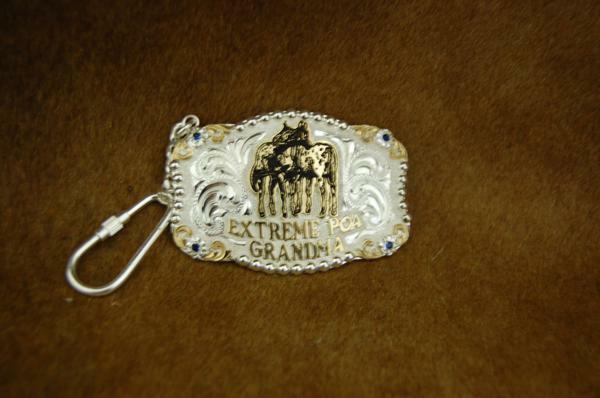 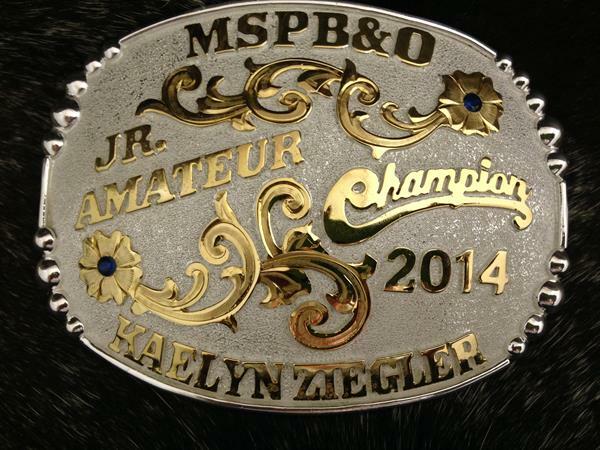 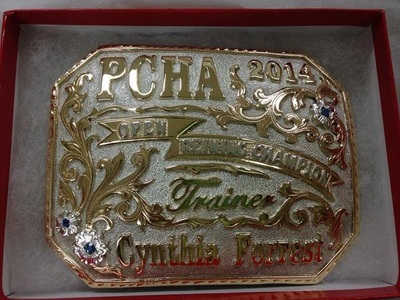 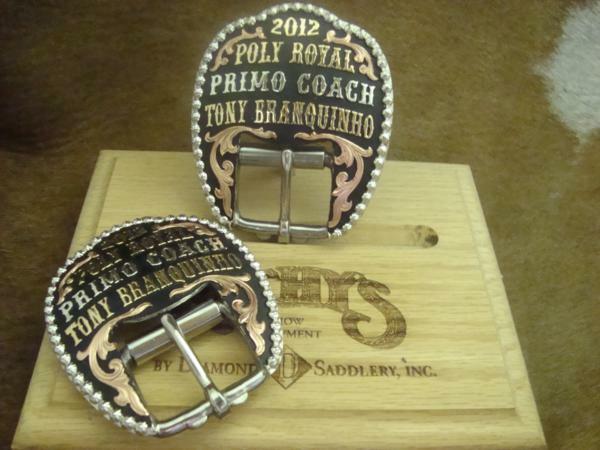 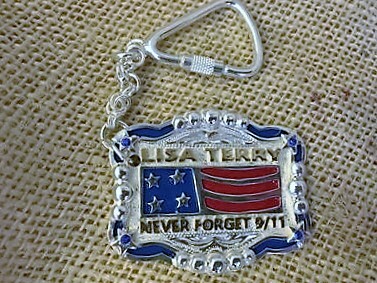 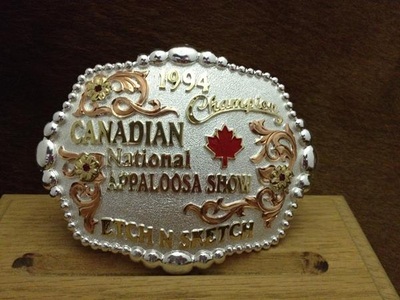 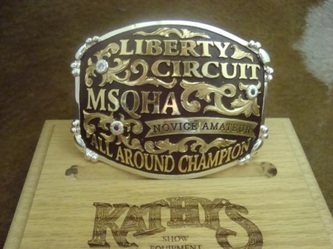 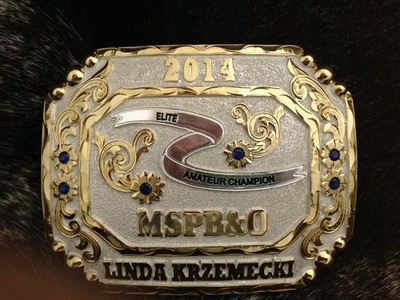 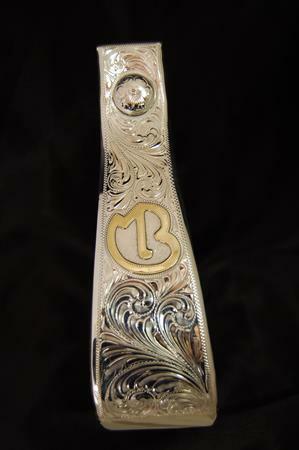 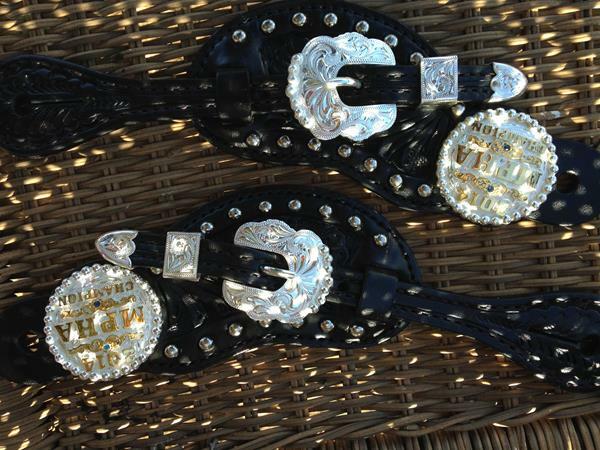 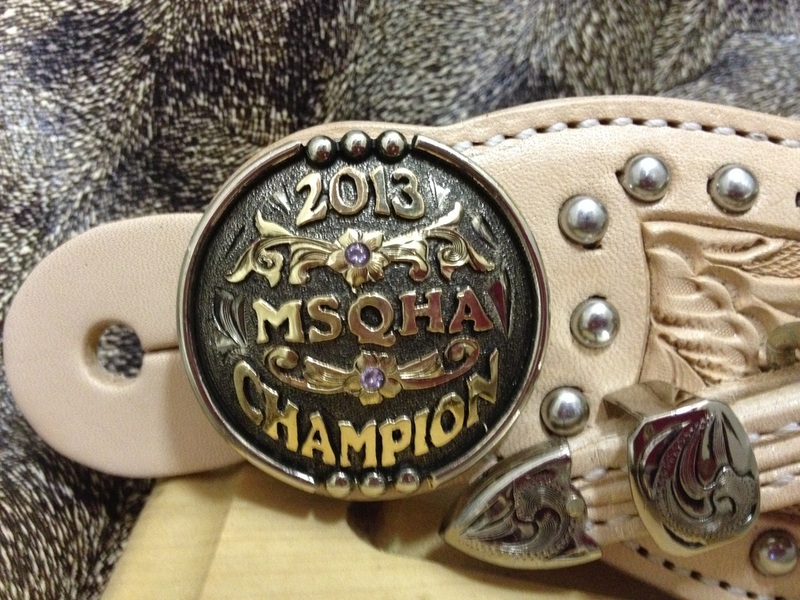 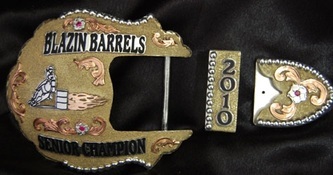 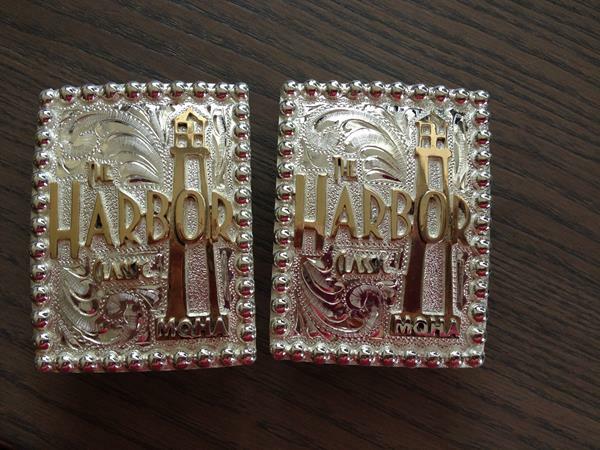 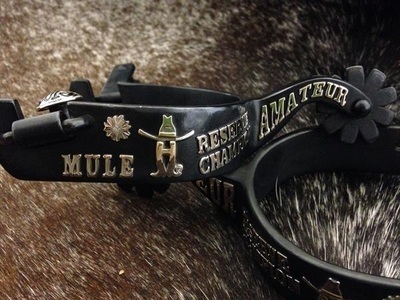 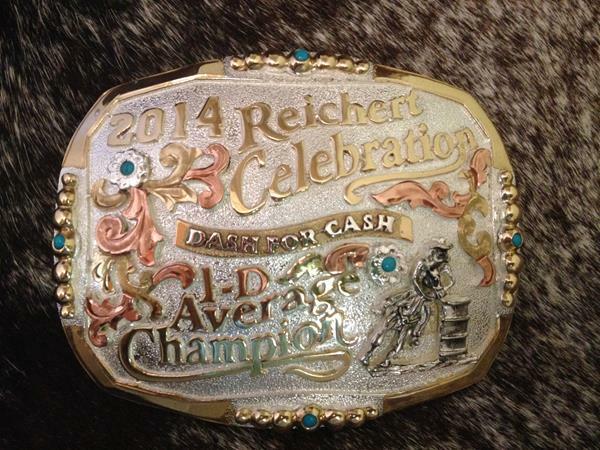 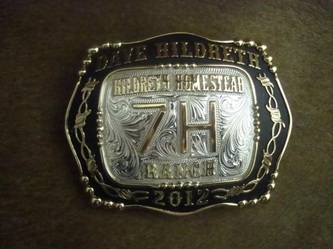 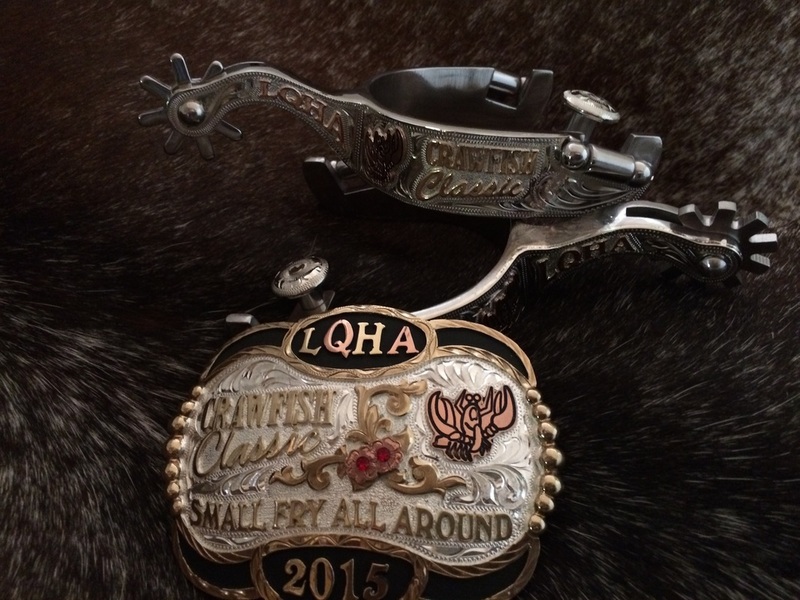 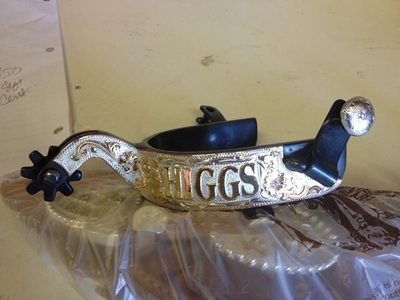 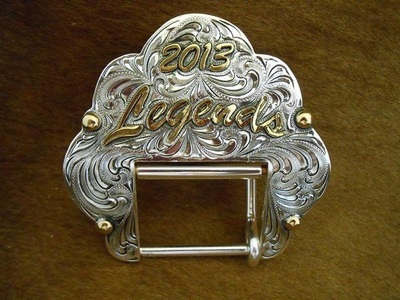 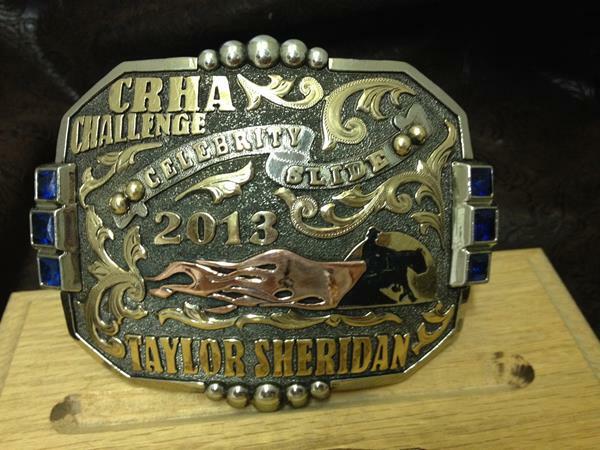 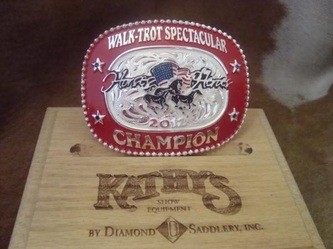 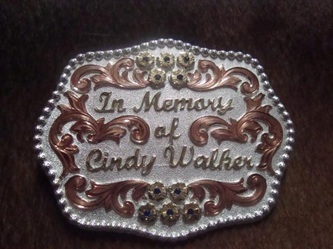 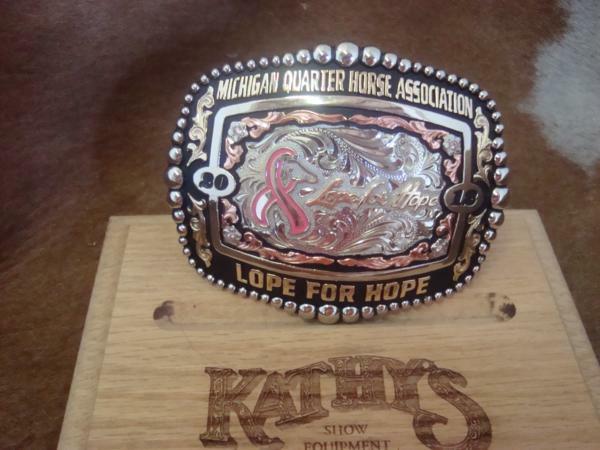 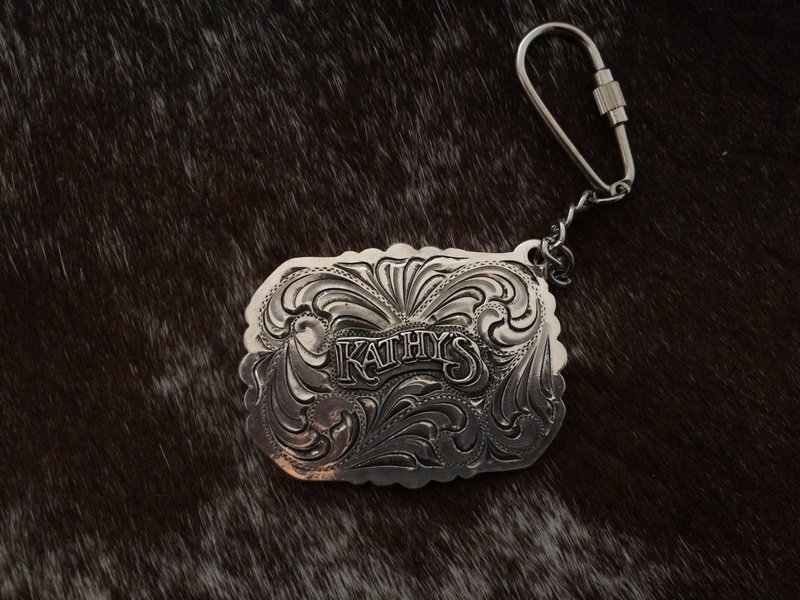 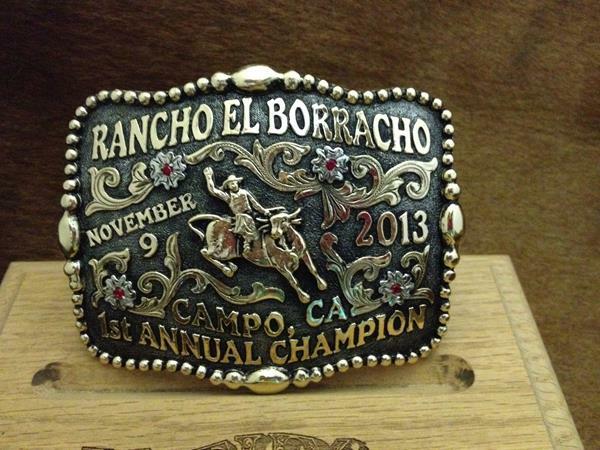 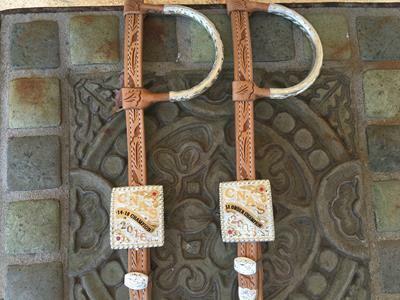 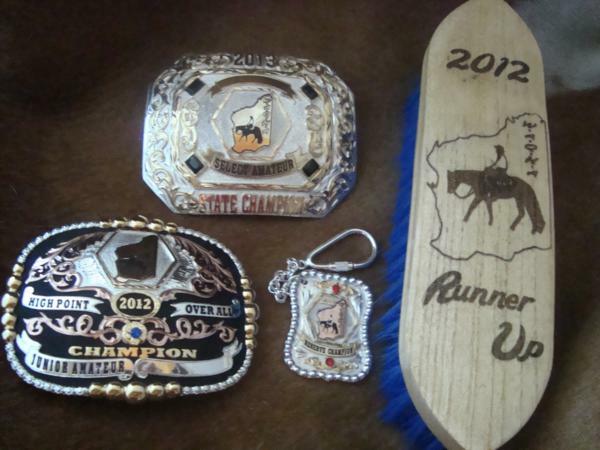 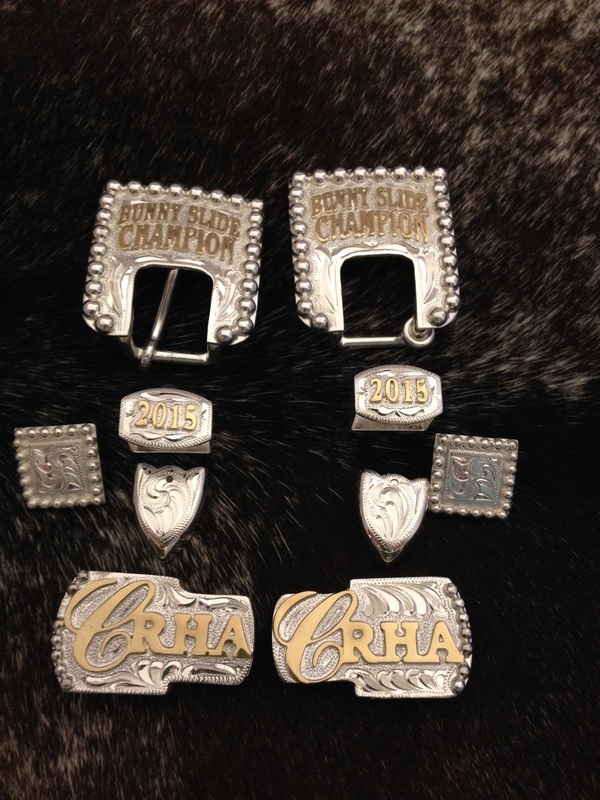 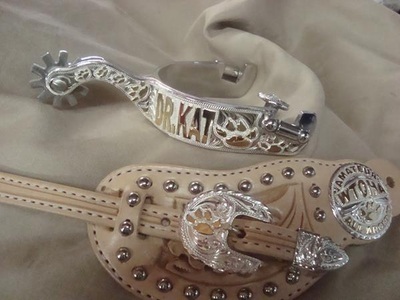 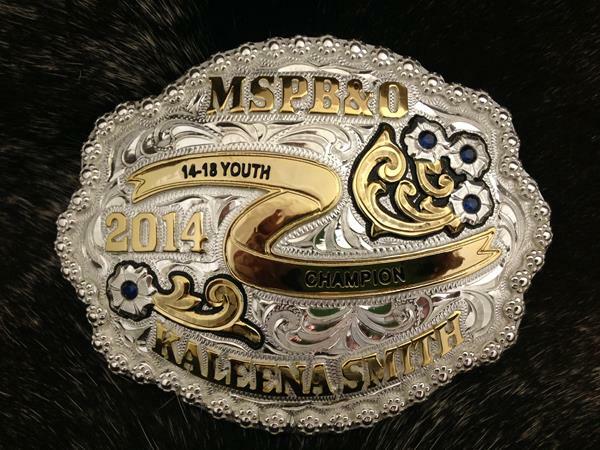 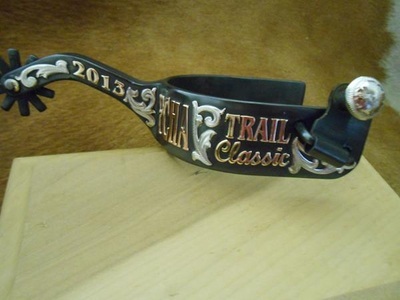 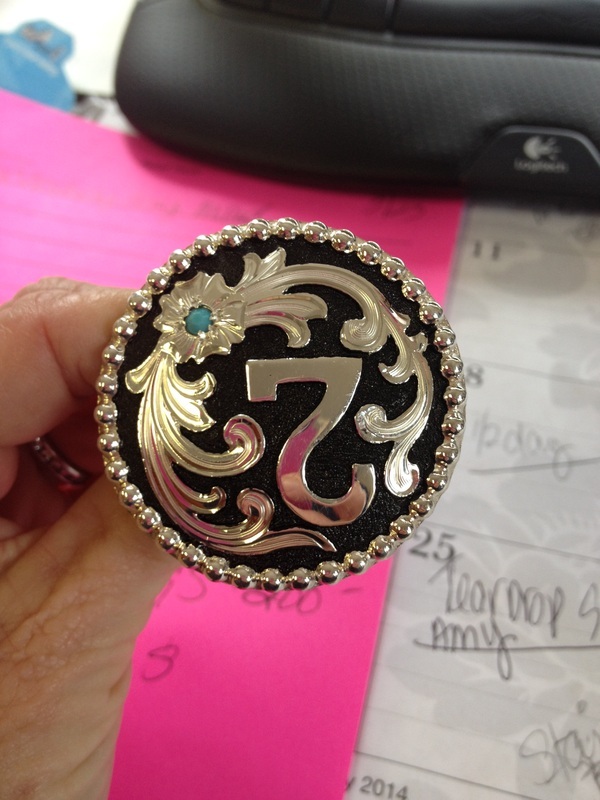 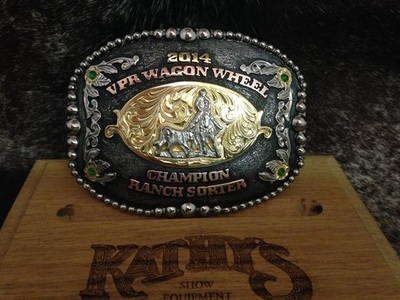 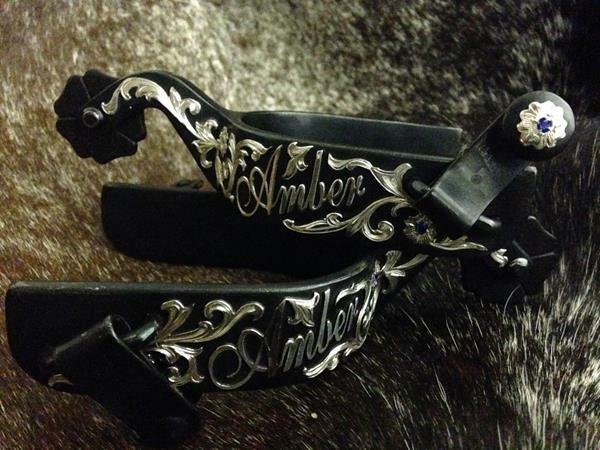 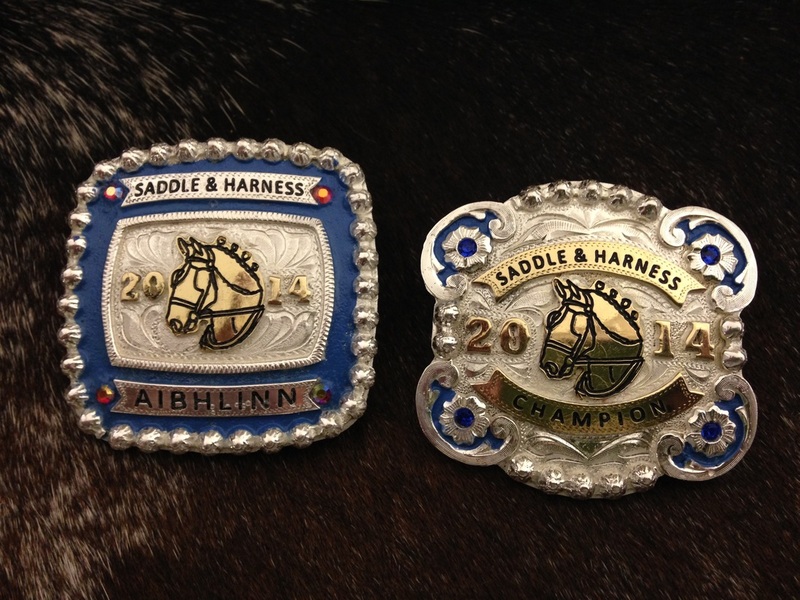 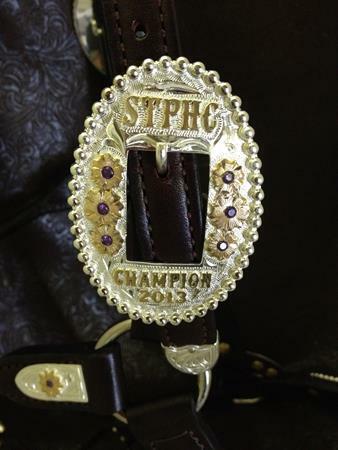 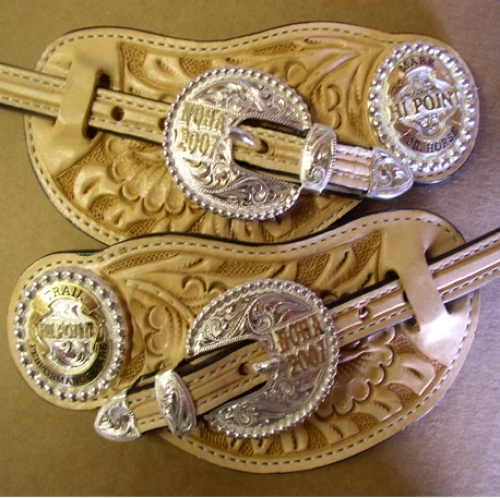 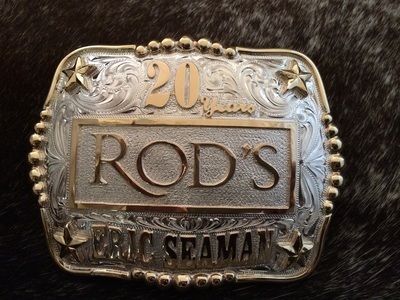 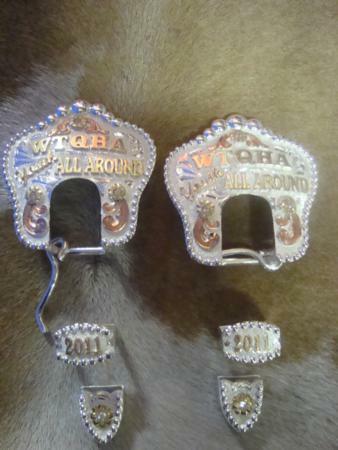 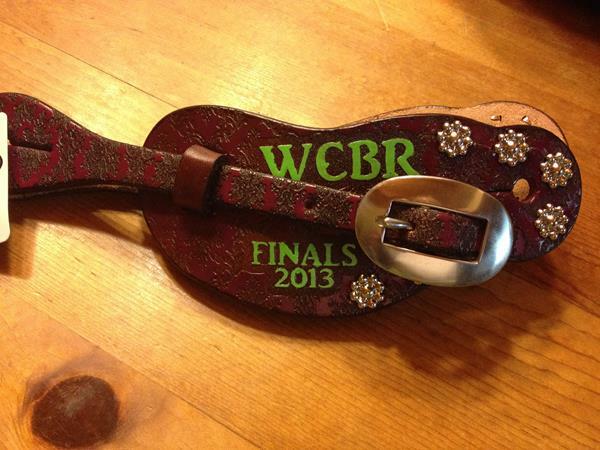 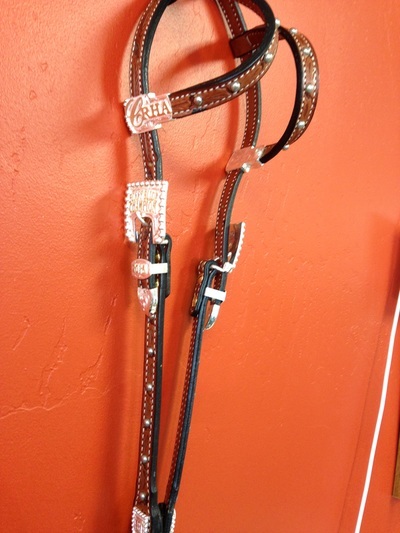 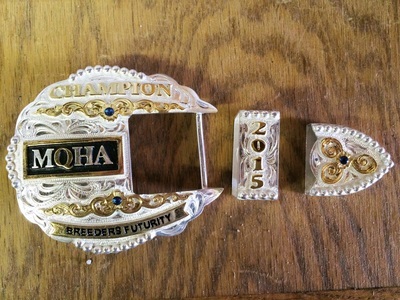 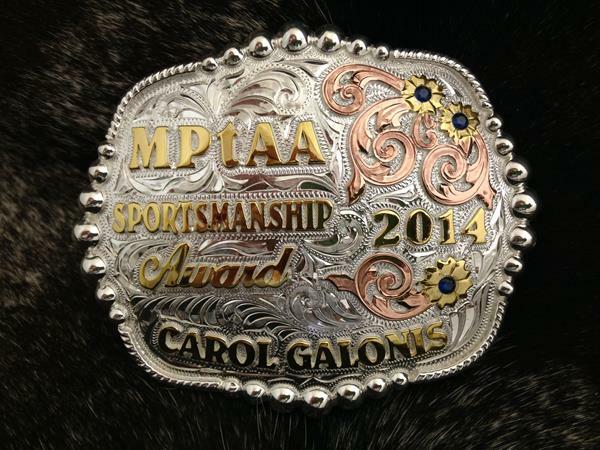 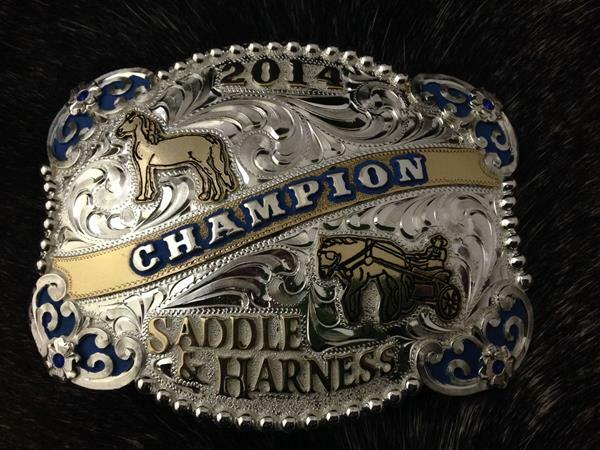 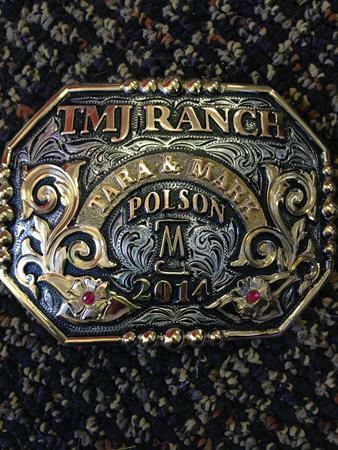 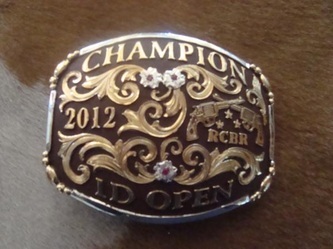 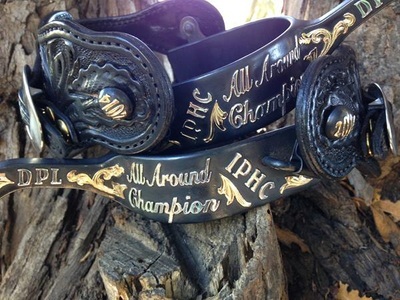 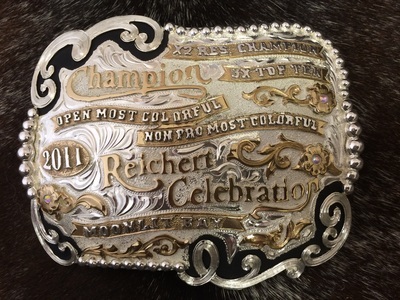 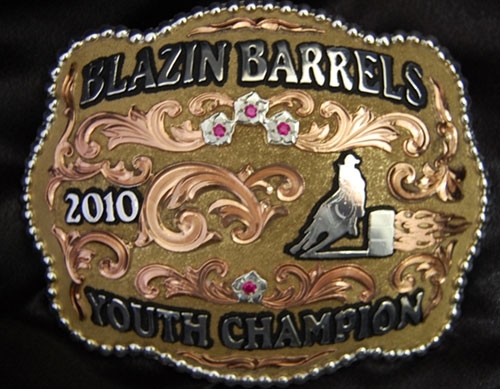 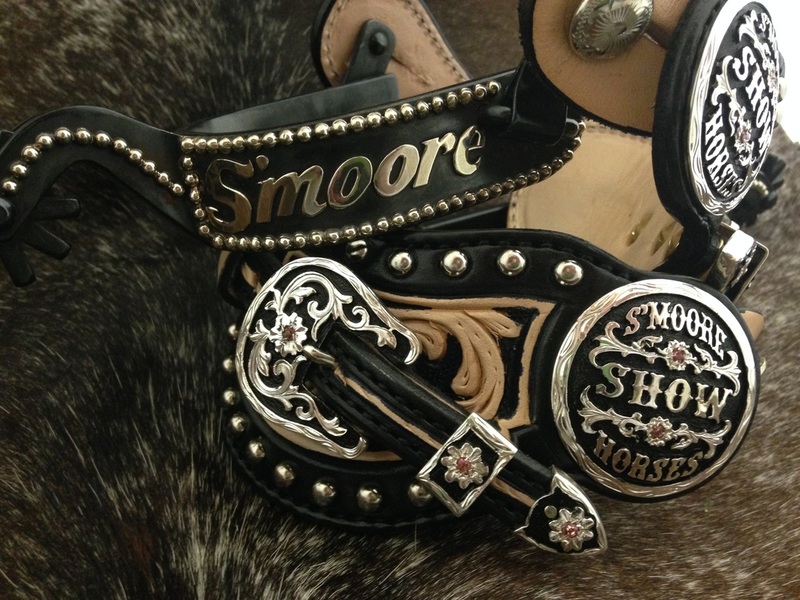 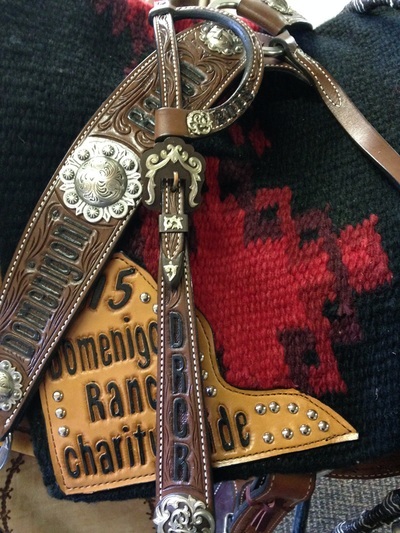 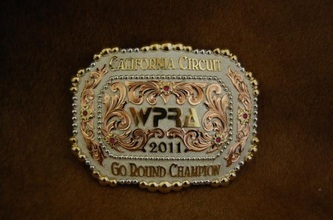 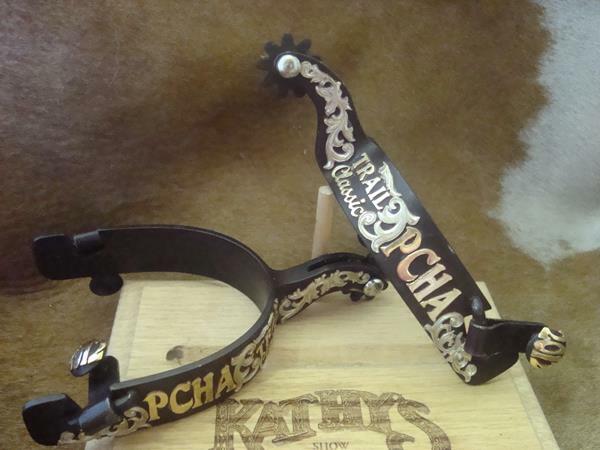 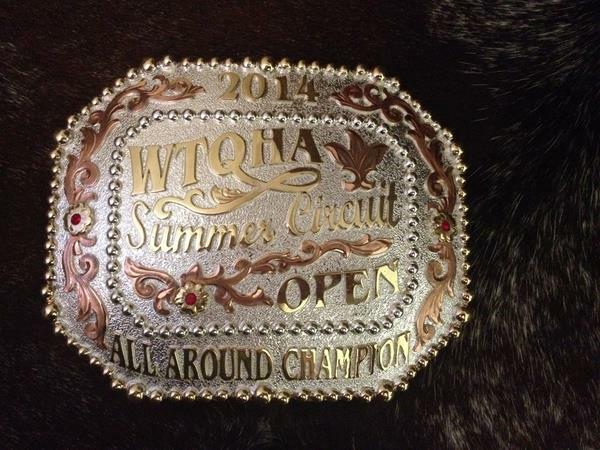 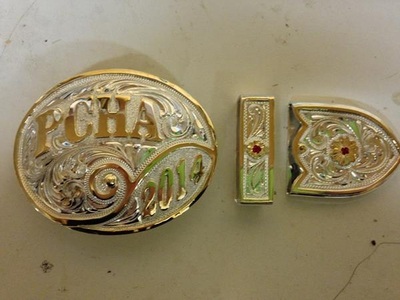 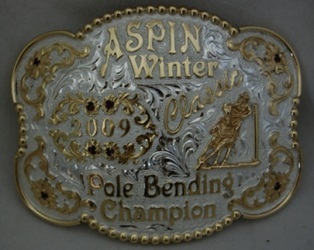 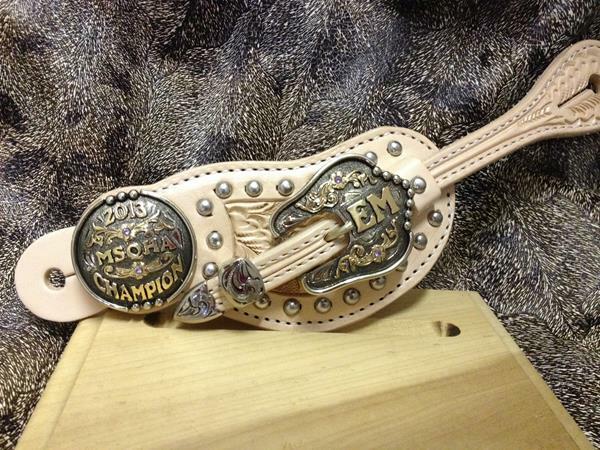 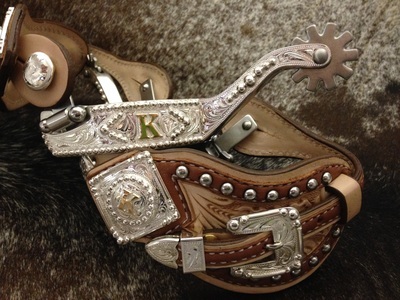 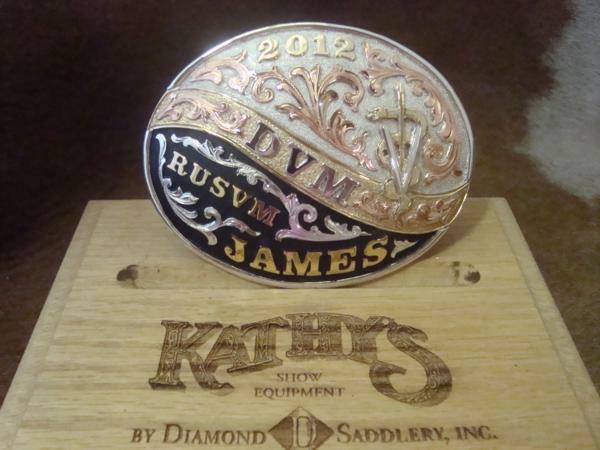 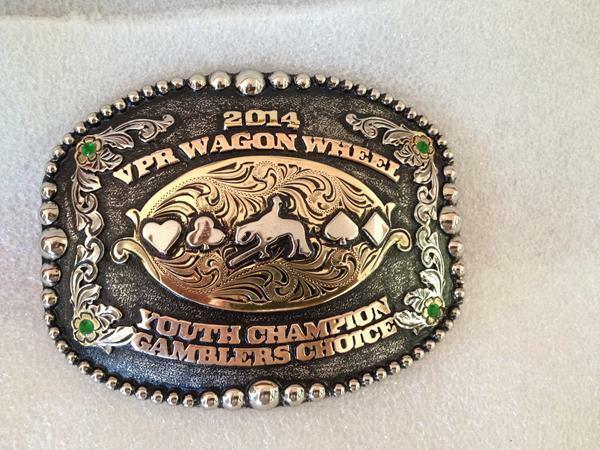 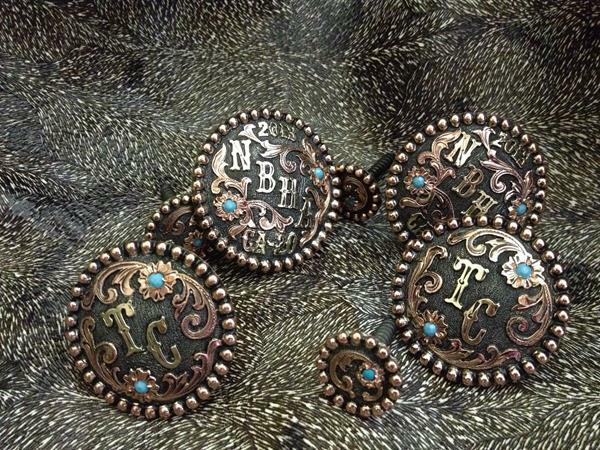 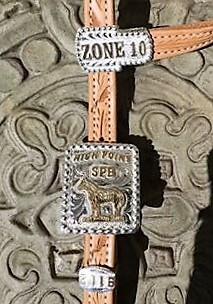 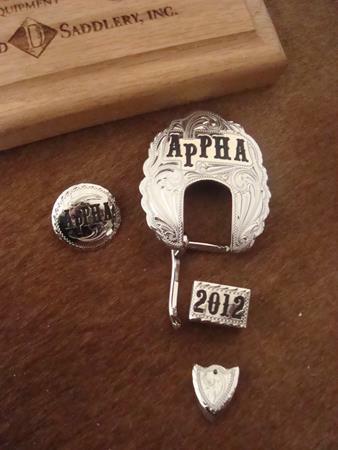 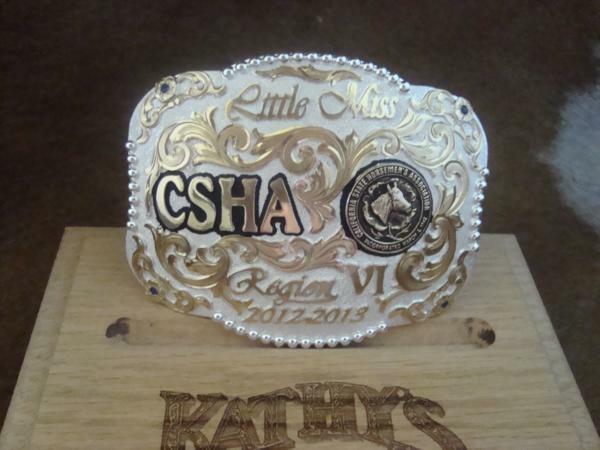 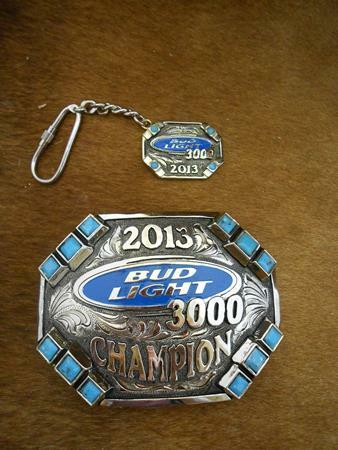 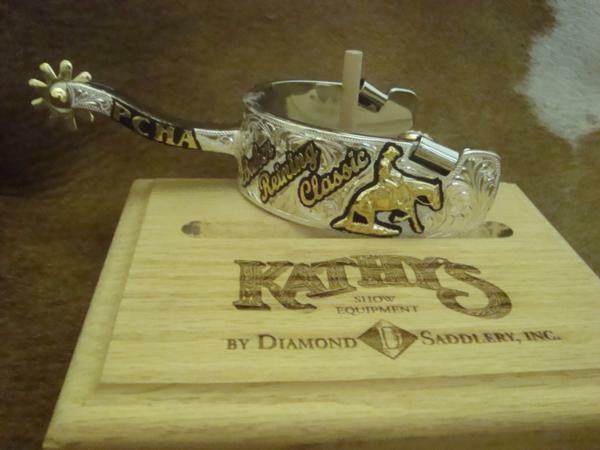 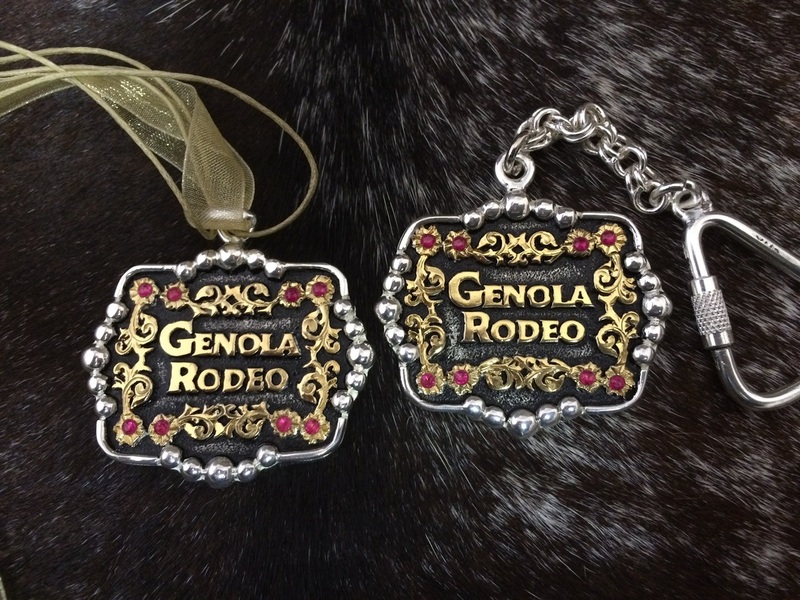 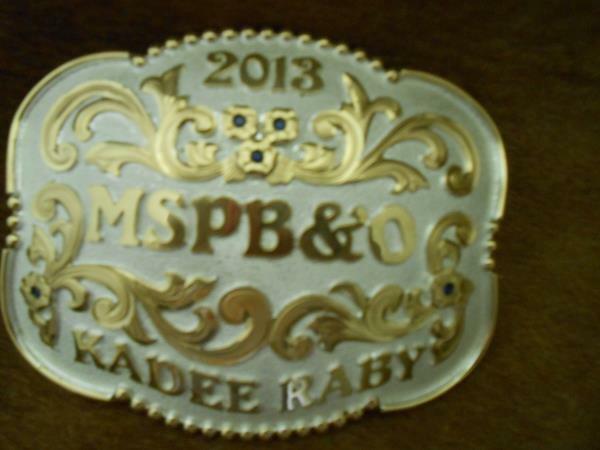 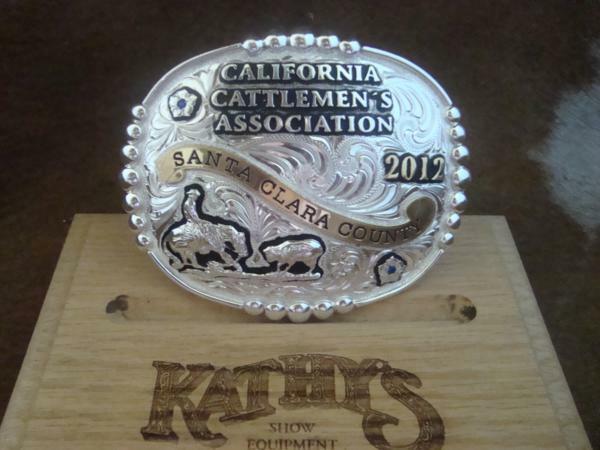 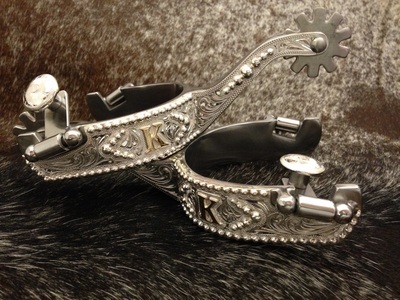 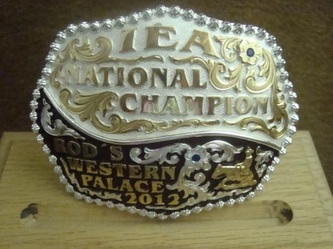 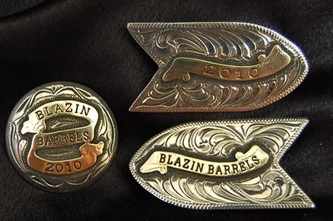 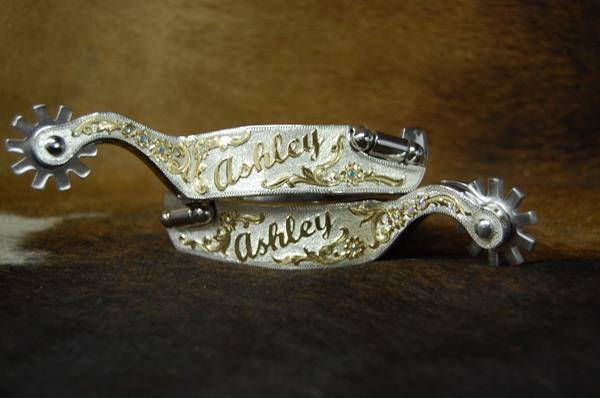 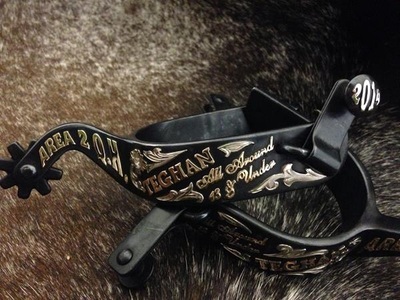 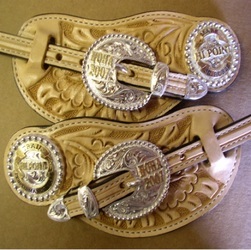 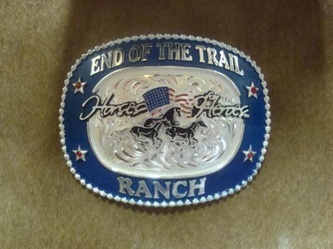 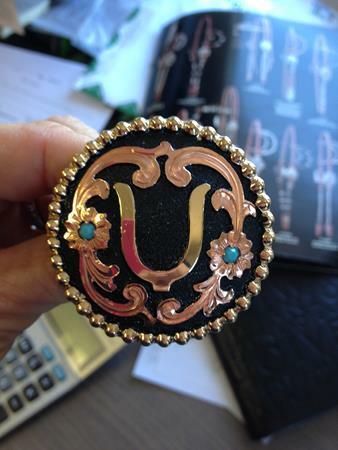 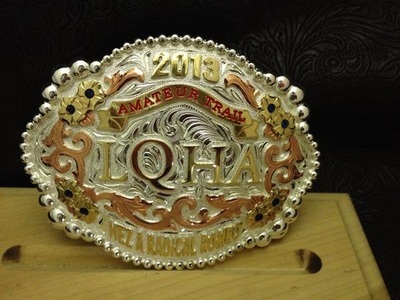 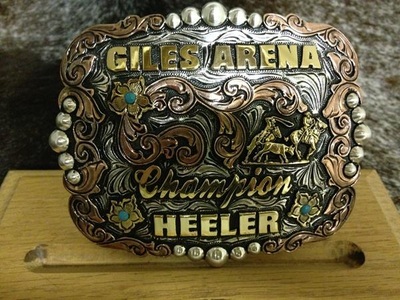 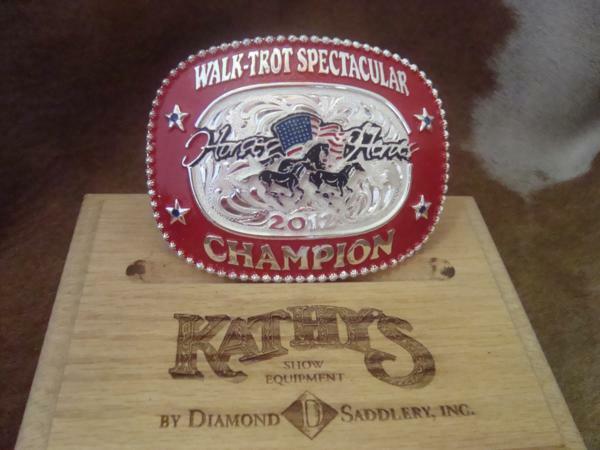 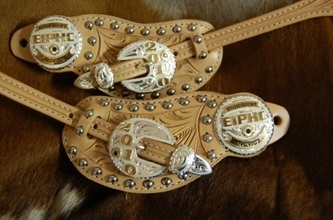 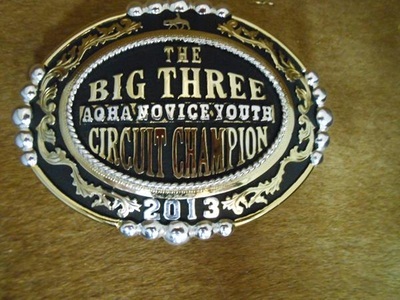 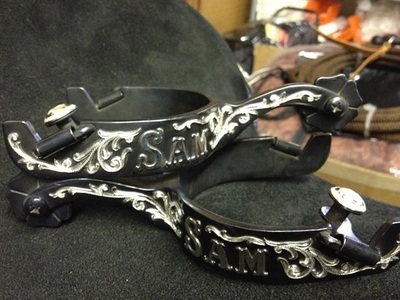 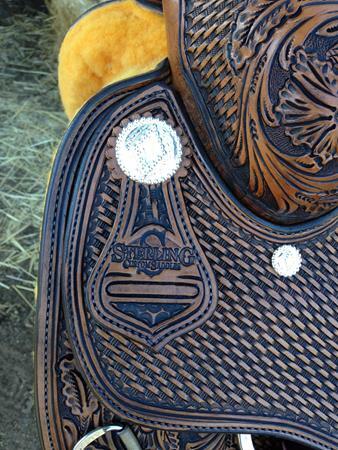 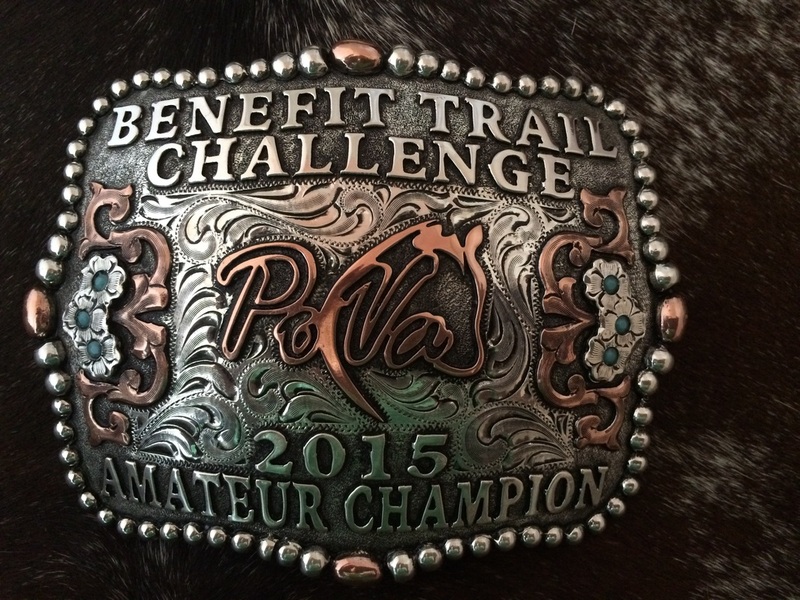 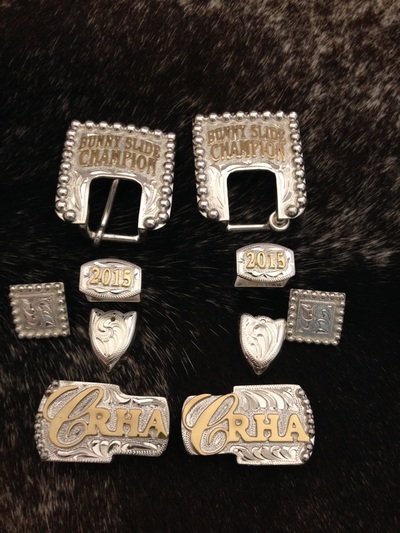 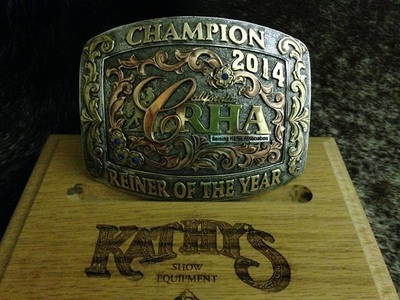 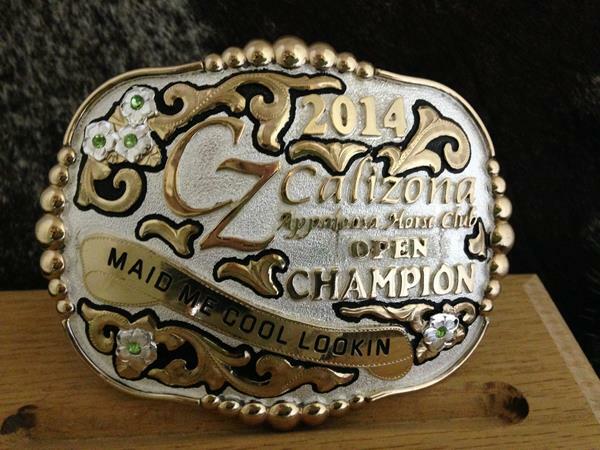 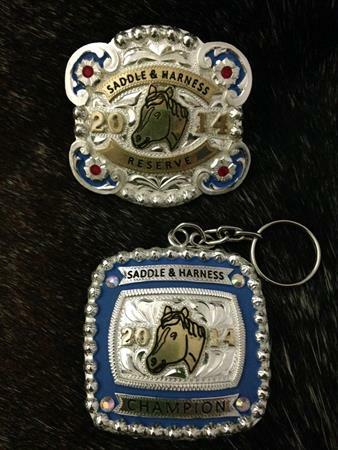 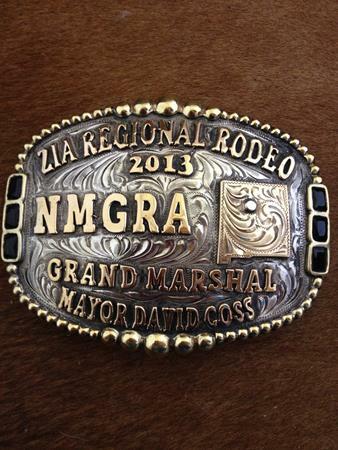 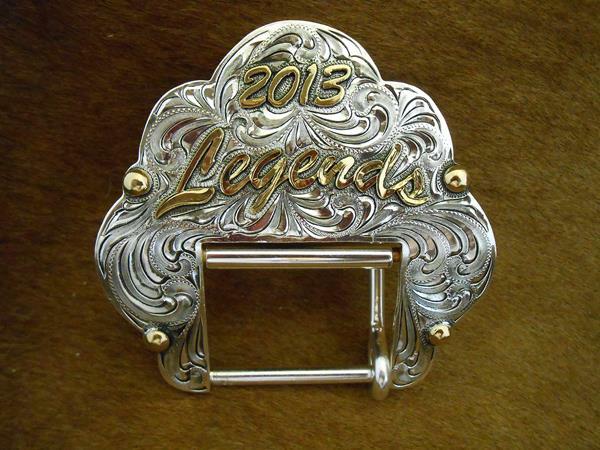 These are some examples of Kathy's Show Equipment Custom Trophy Buckles. 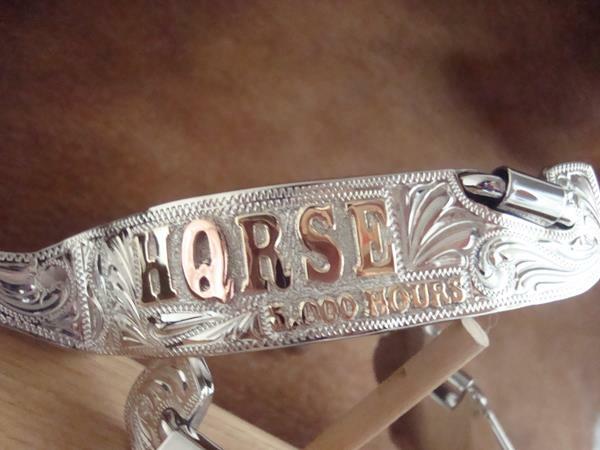 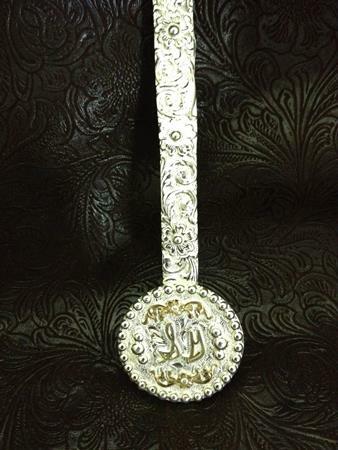 They may be made depending on your budget in hand made silver plate, sterling overlay or solid sterling. 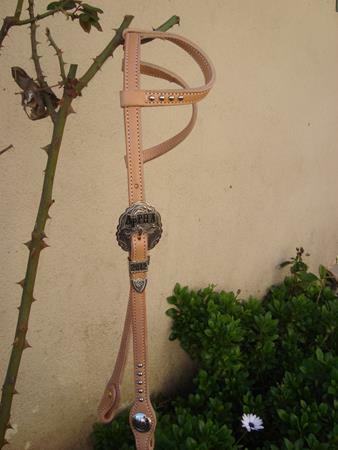 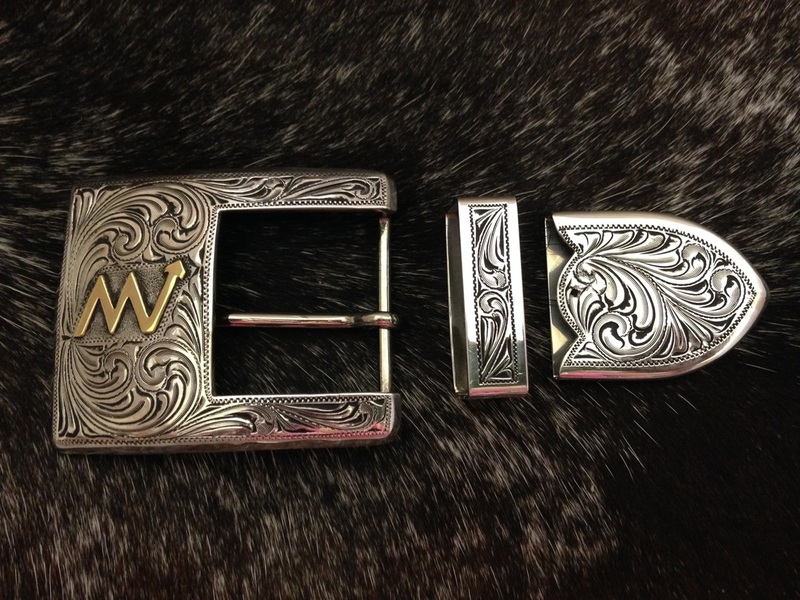 You may choose from an array of stone colors and buckle shapes to make your buckles stand out. 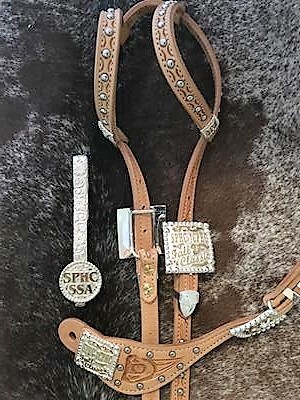 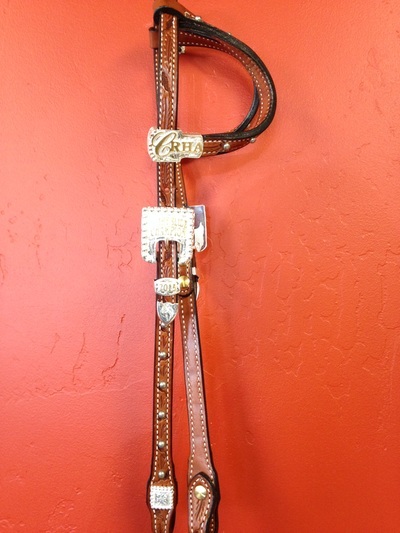 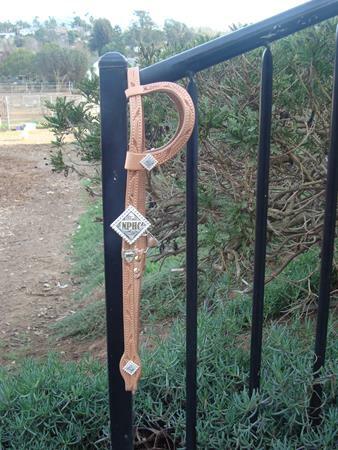 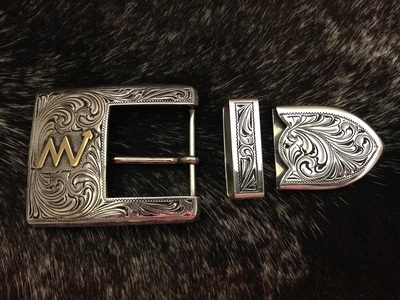 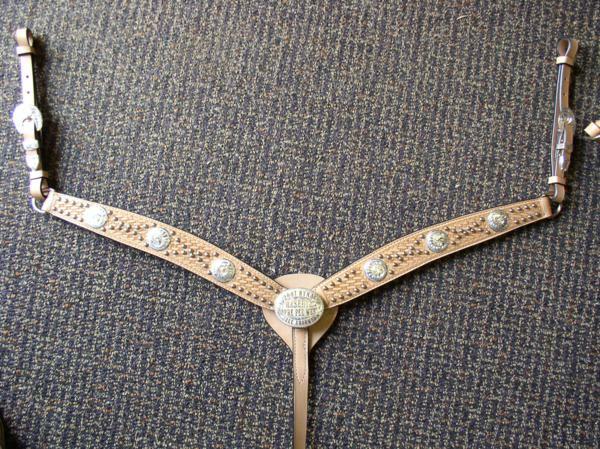 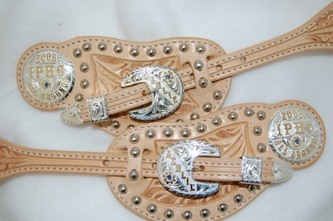 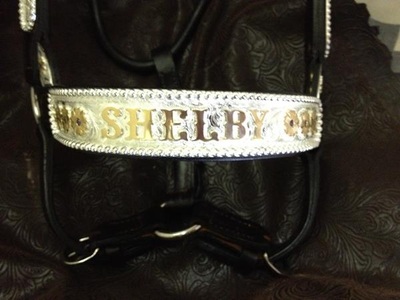 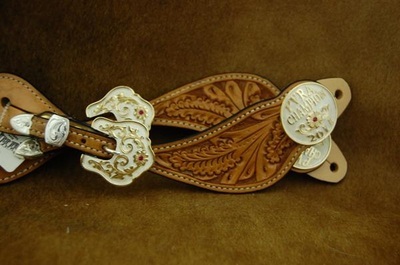 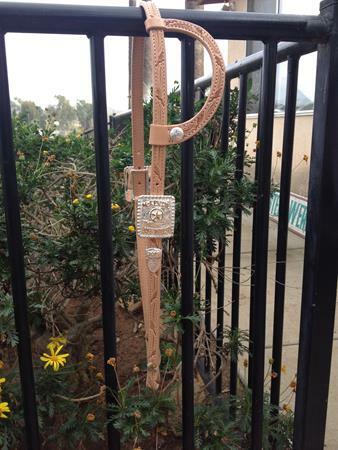 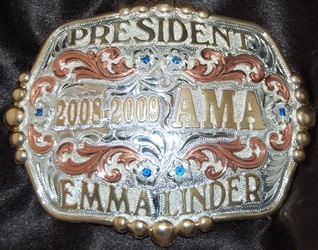 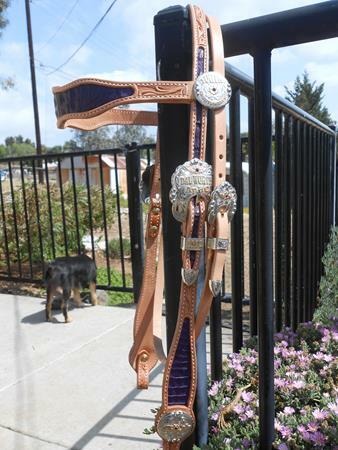 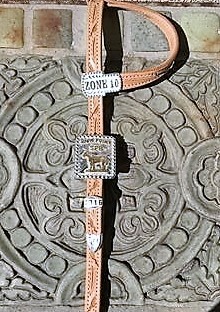 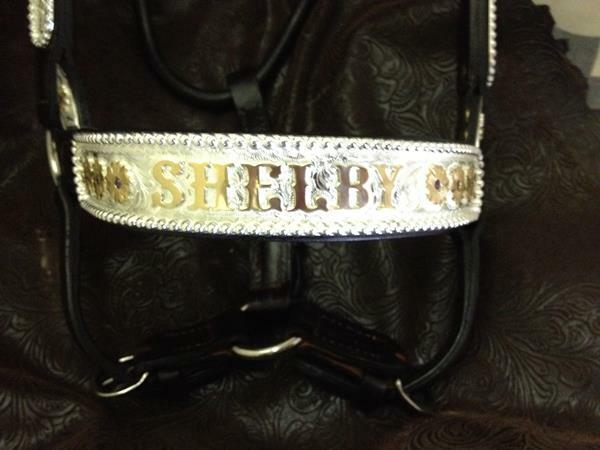 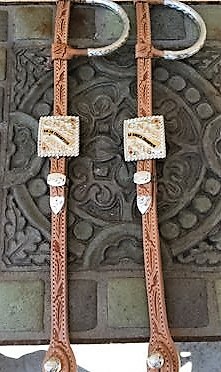 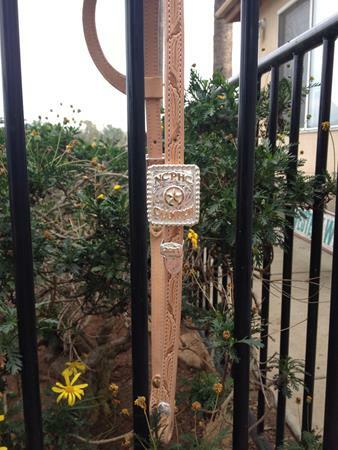 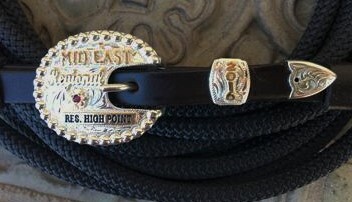 Since every buckle is unique we ask that you call or email for pricing. 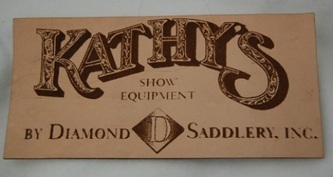 Again anything your imagination dreams up, Kathy's can make a reality! 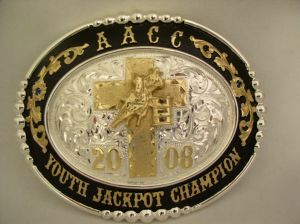 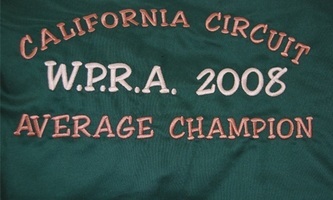 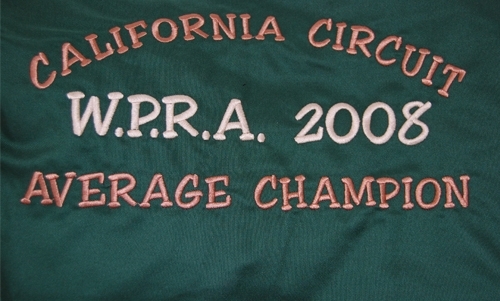 We can put just about any logo or information that you might need to personlize it for an award and a nice gift. 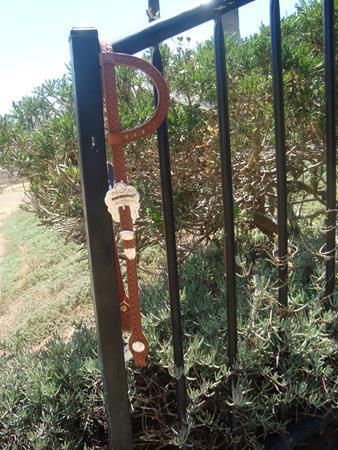 We can also use color inks in the letters to really make a statement! 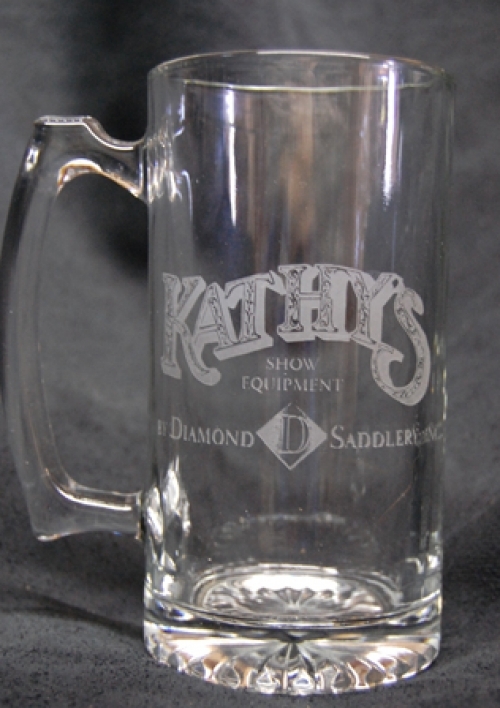 We at Kathy's can do anything that you need! 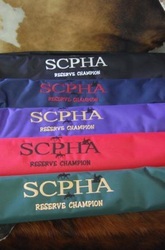 Here we have a quality Kensington day sheet , fly sheet and fly mask that we have embroidered. 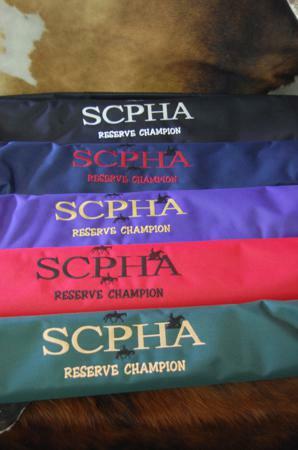 We can provide the blankets for you or use your own. 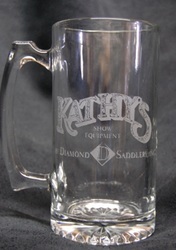 We at Kathy's can be your ONE STOP shop for all your award needs!